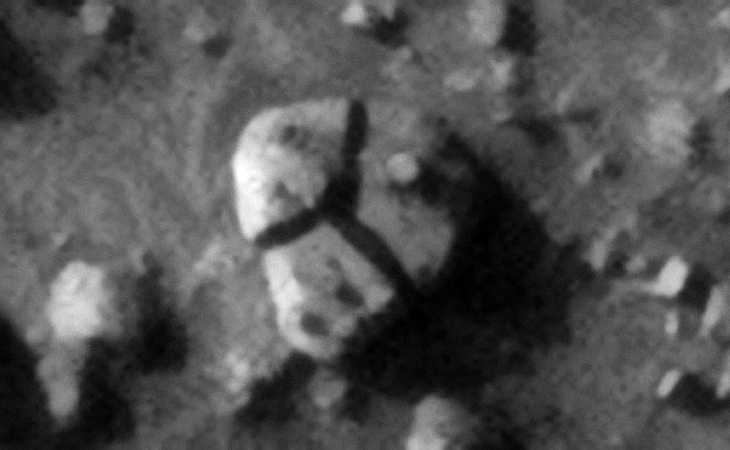 I have been researching anomalies on Mars for several months now and have discovered vast terrains on Mars littered with what look like ancient megalithic blocks with small features or knobs and holes as well and ruins. 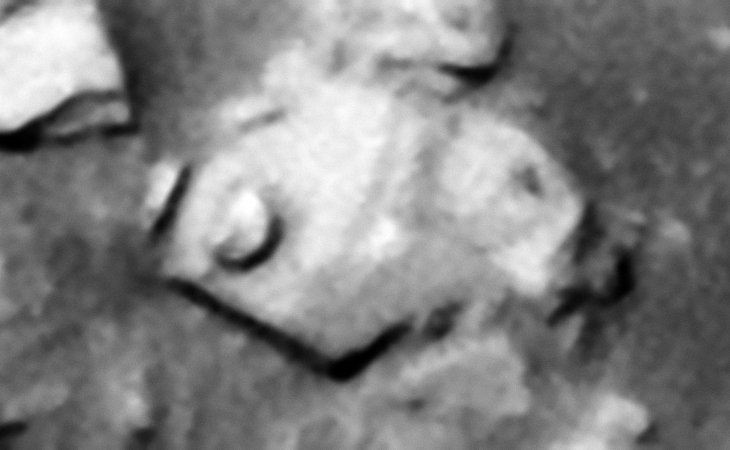 Due to the vast number I found I thought it prudent to present my findings and compelling evidence in Part 2 of this Special Edition Series here and on YouTube. 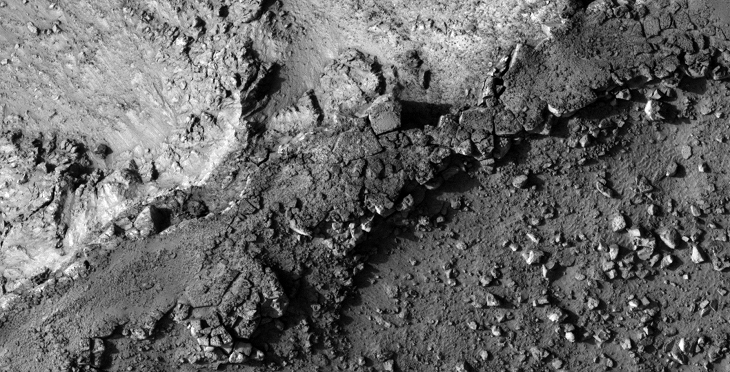 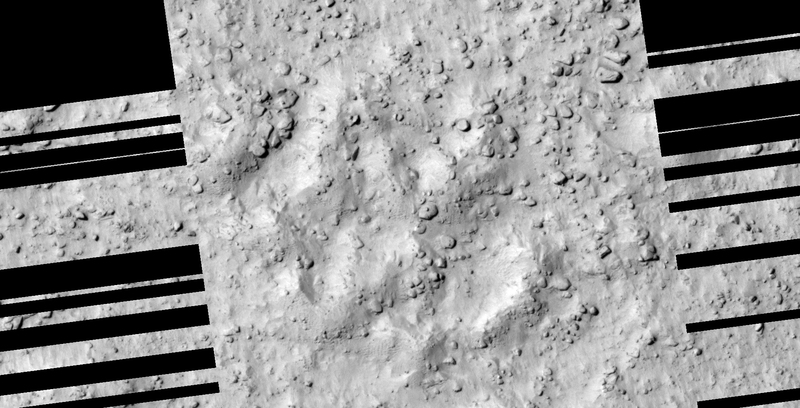 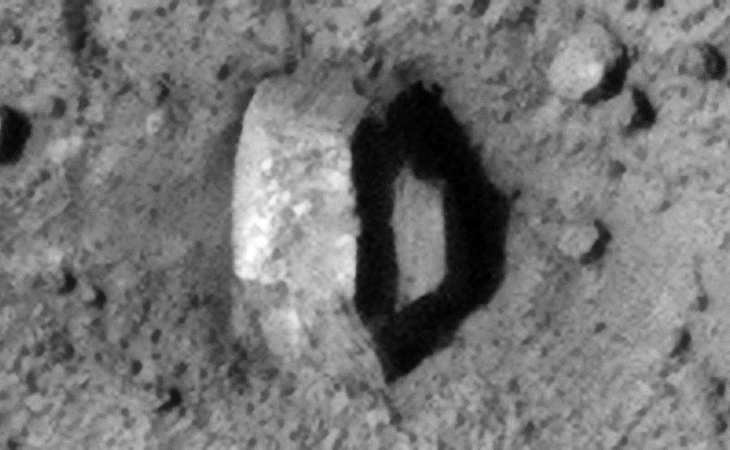 Close examination of the megalithic blocks on Mars show that some have small features or knobs and others similar sized holes, not unlike those found on Earth. 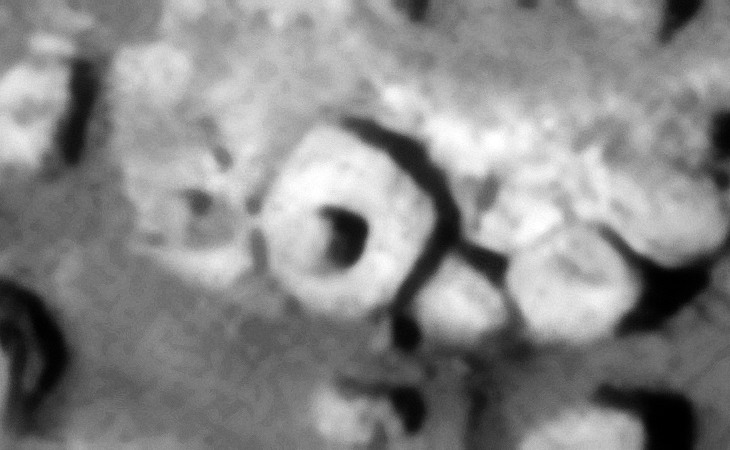 Researchers studying ancient ruins on Earth are perplexed about the presence of the knobs found on most megaliths making up these ancient structures. 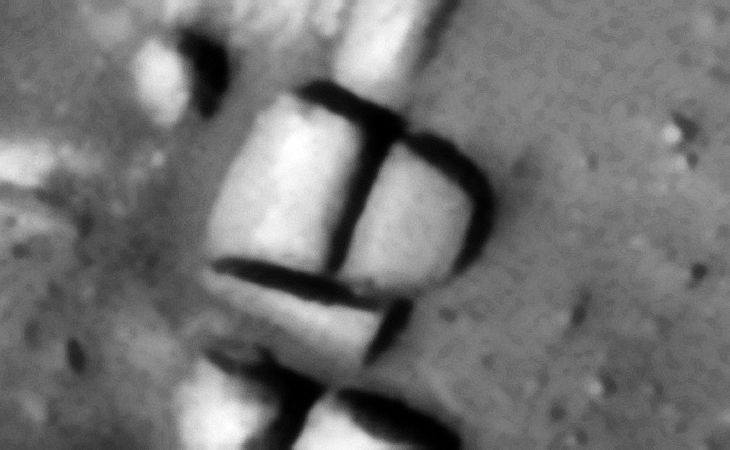 While others speculate these were used to align joins. 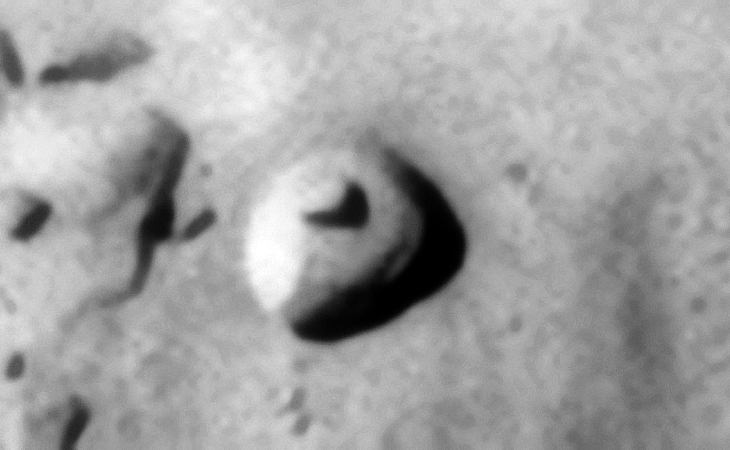 The Megaliths on Mars, many of which have virtually the same proportions and size as their counterparts of Earth, have small features or knobs and holes mostly located in their centers. 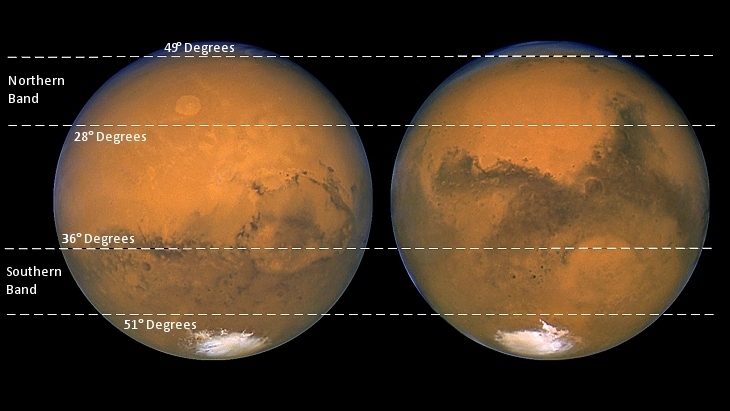 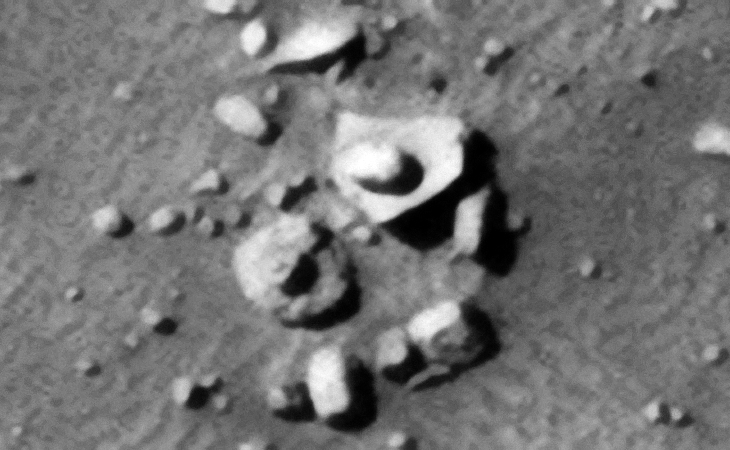 Some megaliths of Mars show the same signs of warping (concave surfaces) as those on Earth. 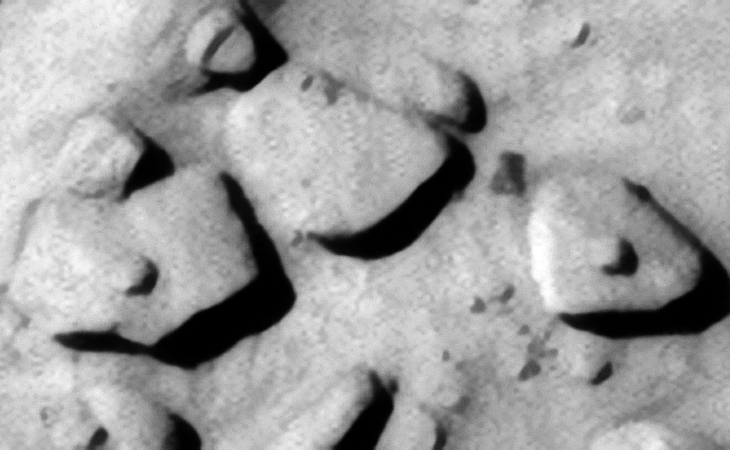 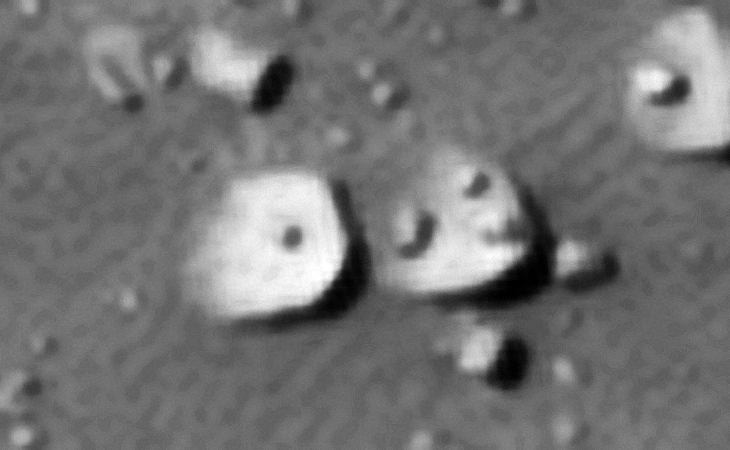 Whatever the reason for the small features or knobs and holes, finding a vast number of these strange megalithic blocks on Mars is highly unusual. 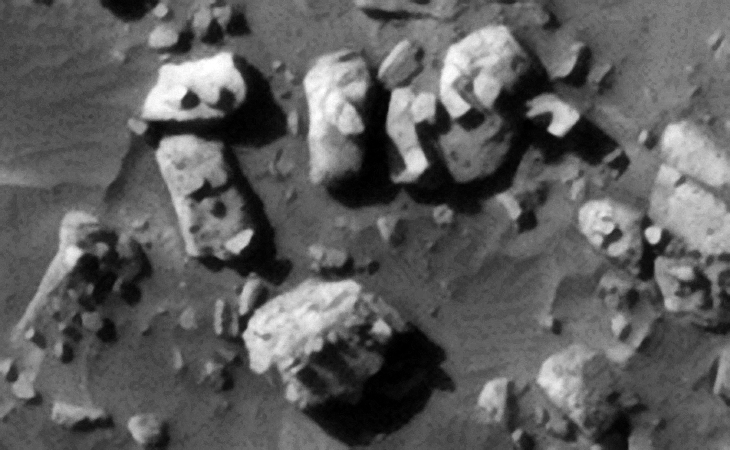 Normal boulders and rocks do not have small, uniformly spaced, centered, mostly same sized features or knobs and holes on them which is why I speculate that these have been manufactured, perhaps by our ancient ancestors. 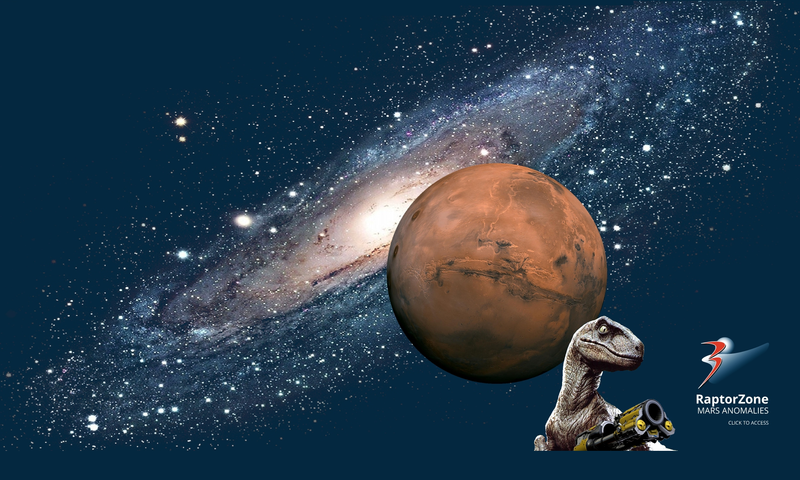 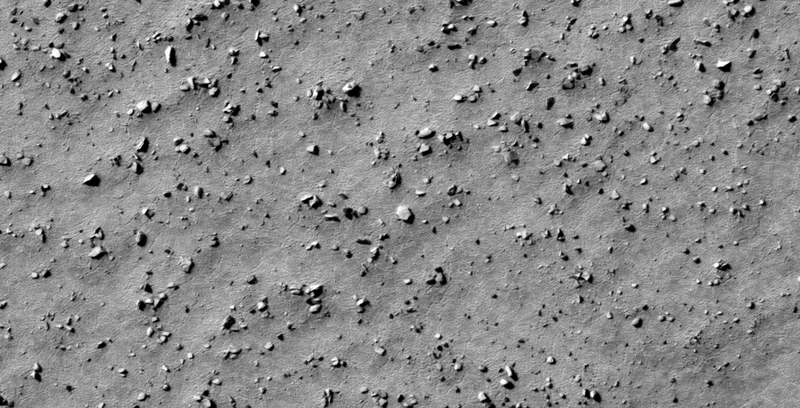 So why do the megaliths on Mars have small features or knobs and holes? 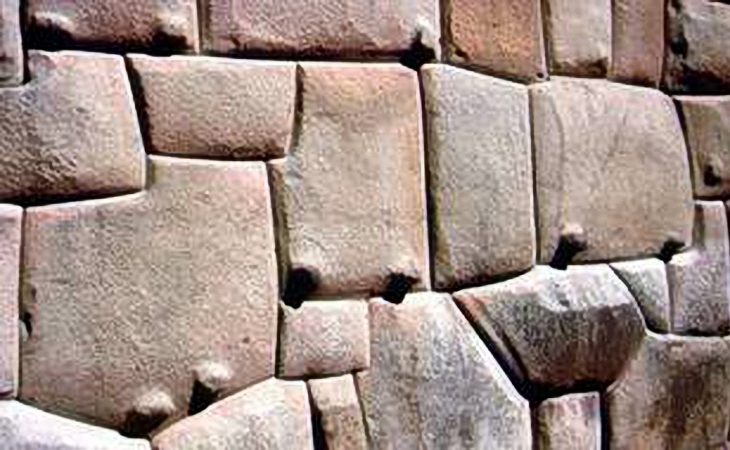 Could the megaliths with knobs fit into those with holes, i.e. 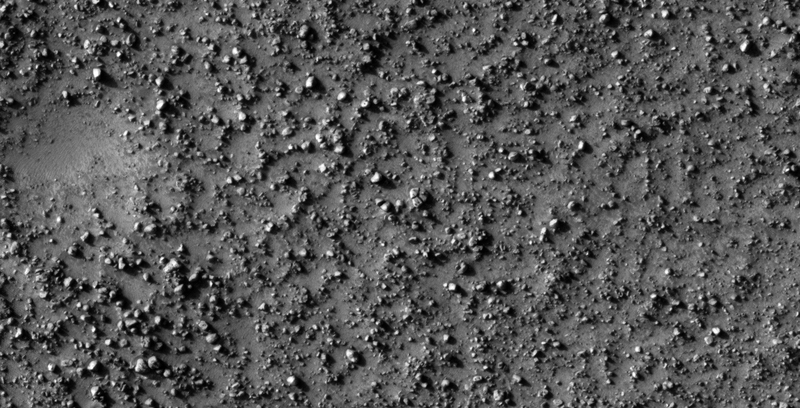 like Lego pieces? 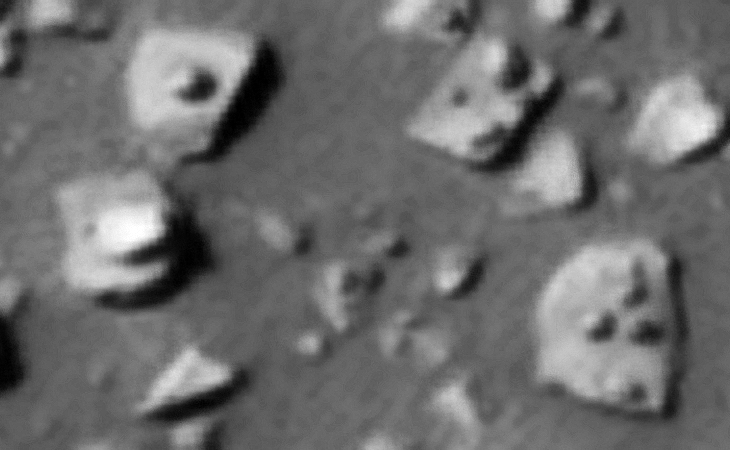 Could it be that the dark spot found in the centers of some objects are cones facing inward in what may be some type of water condensation processing plants? 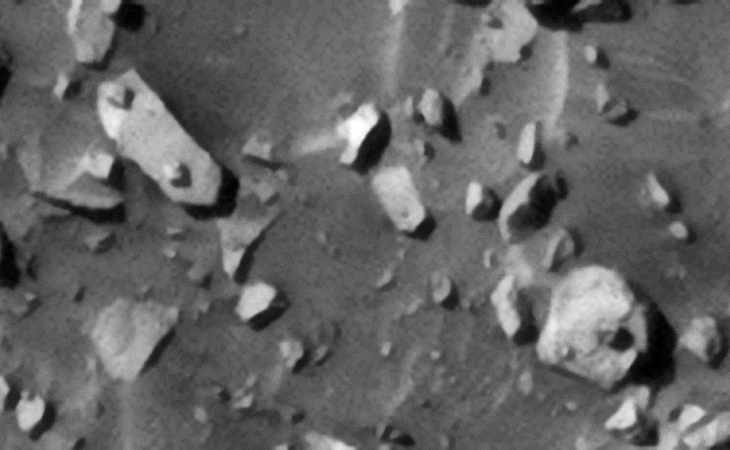 Or are these objects used to generate electricity through some type of technology. 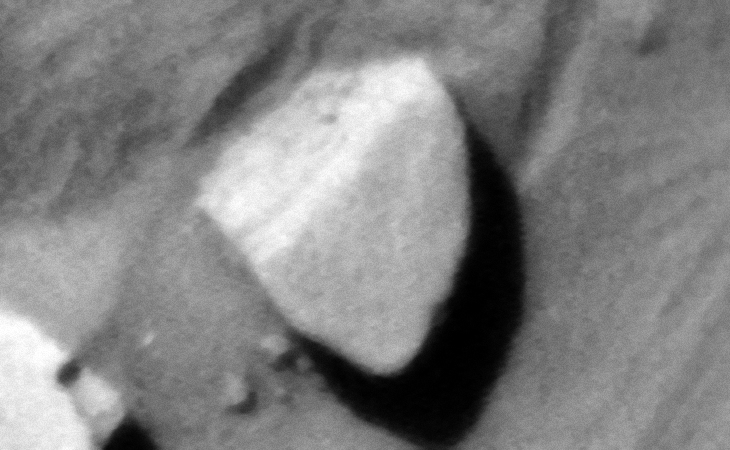 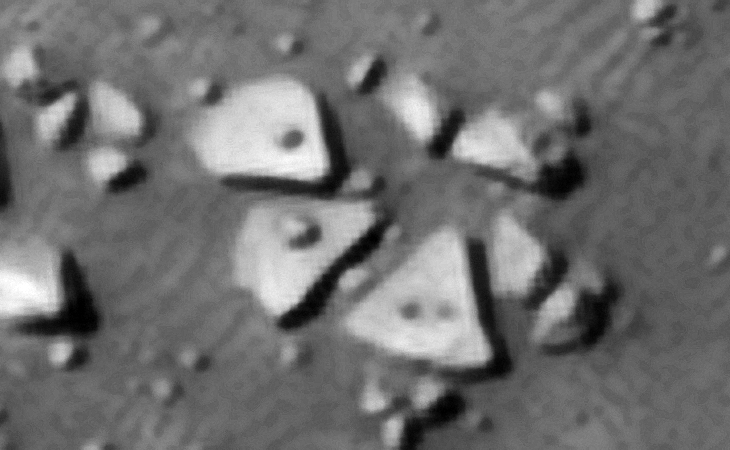 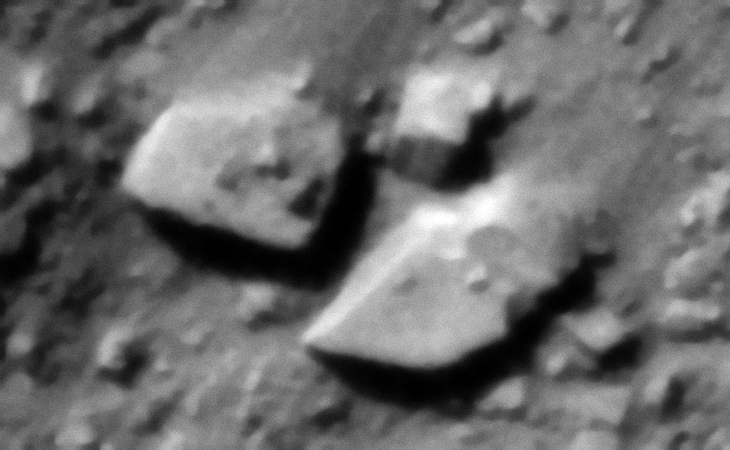 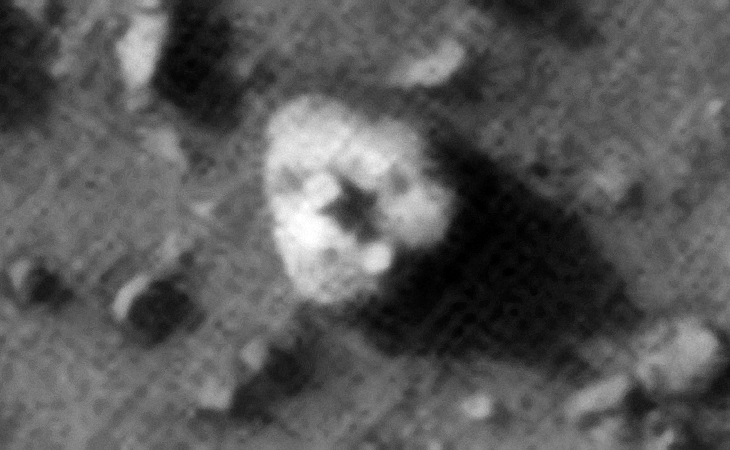 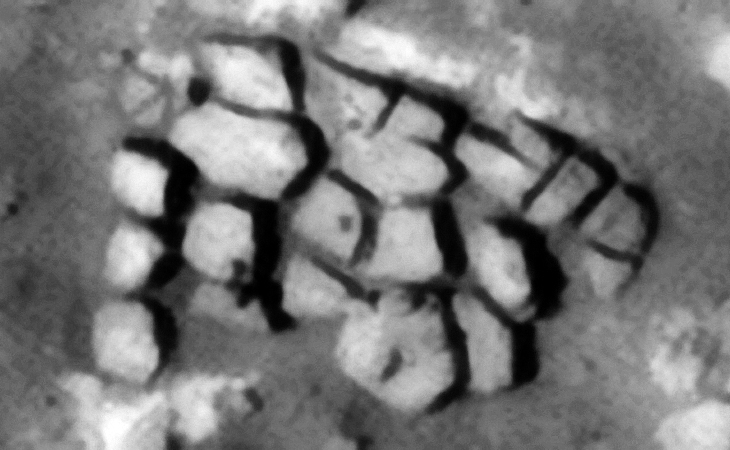 Like those found on Earth, the general geometry of these megaliths on Mars range between chevron-shaped, plectrum-shaped, circular, semi-circular, rhombic, hexagonal, square and rectangular and range in size. 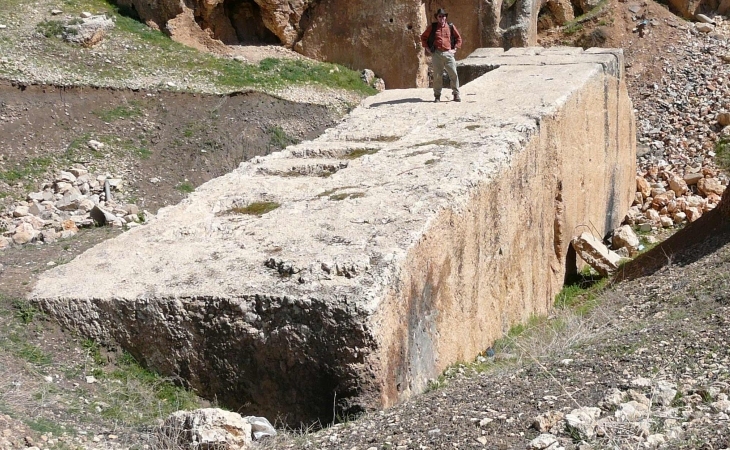 In general most measure a minimum of about 8 metres wide and a minimum of about 8 metres long. 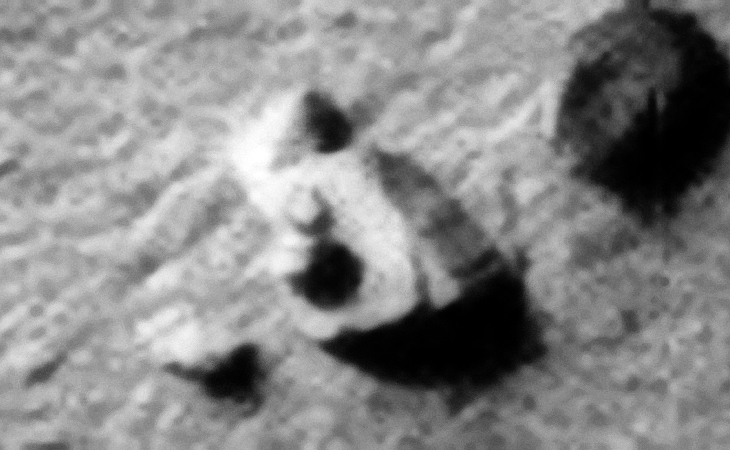 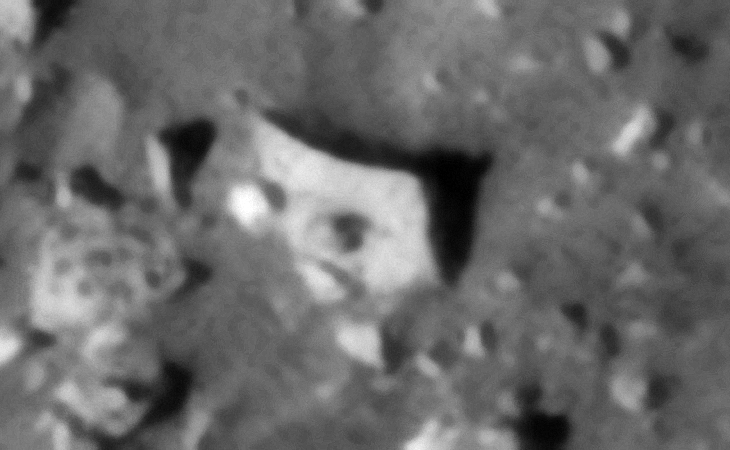 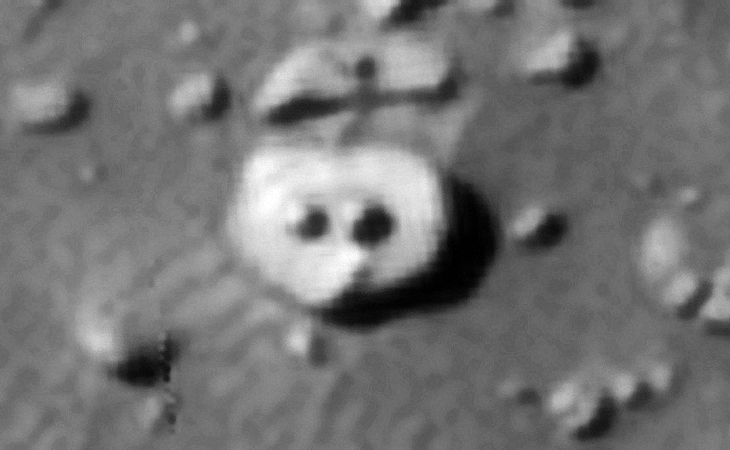 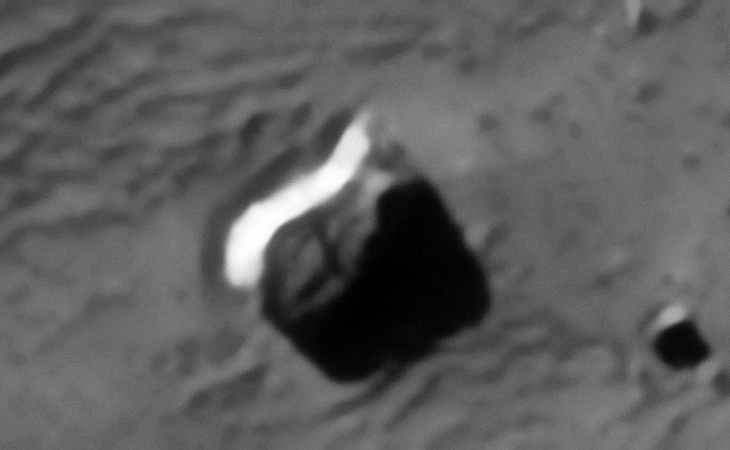 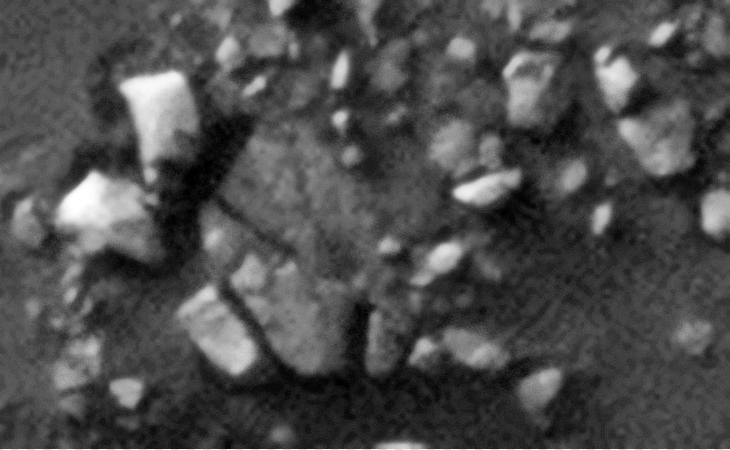 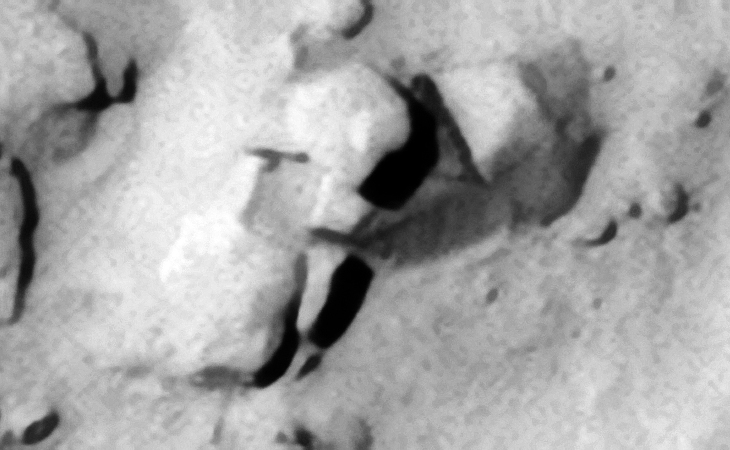 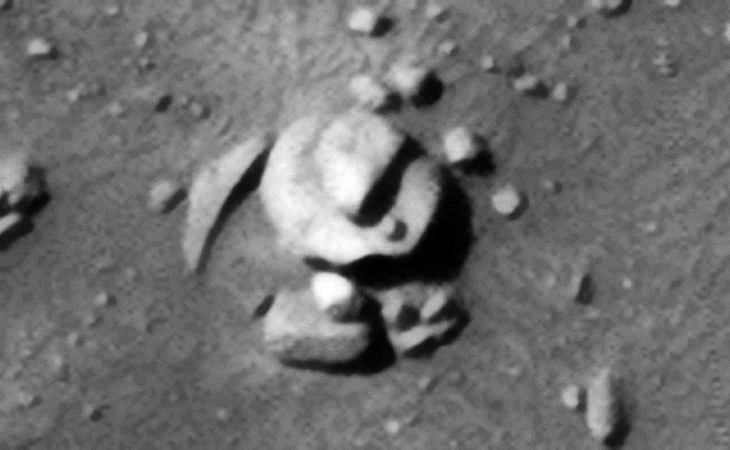 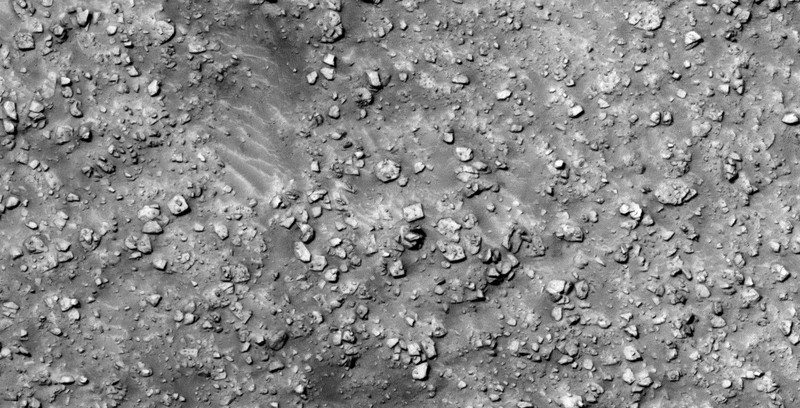 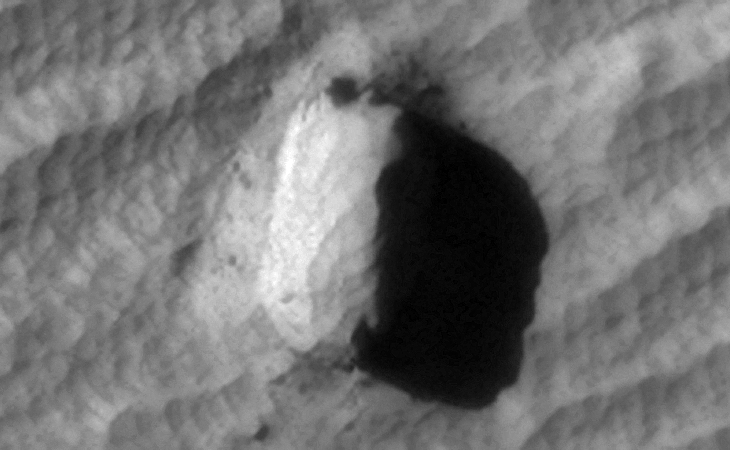 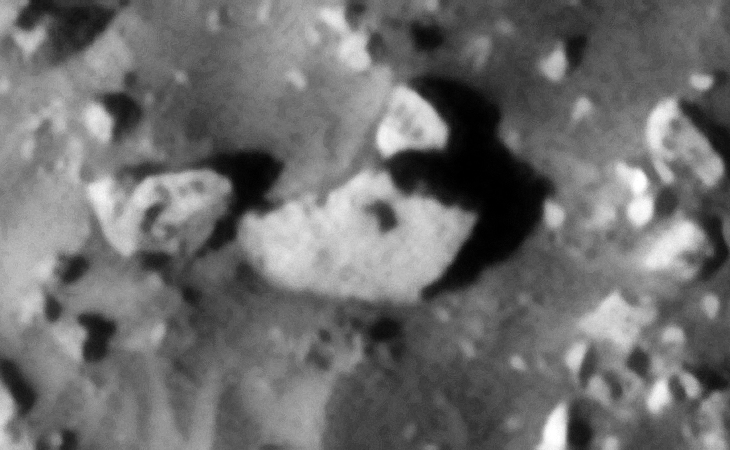 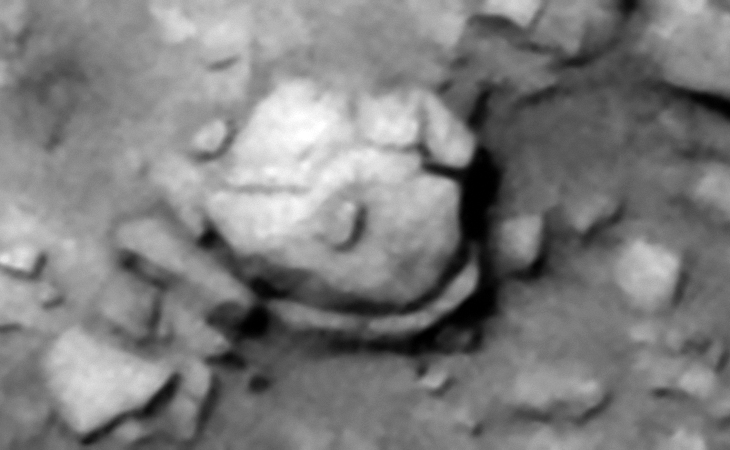 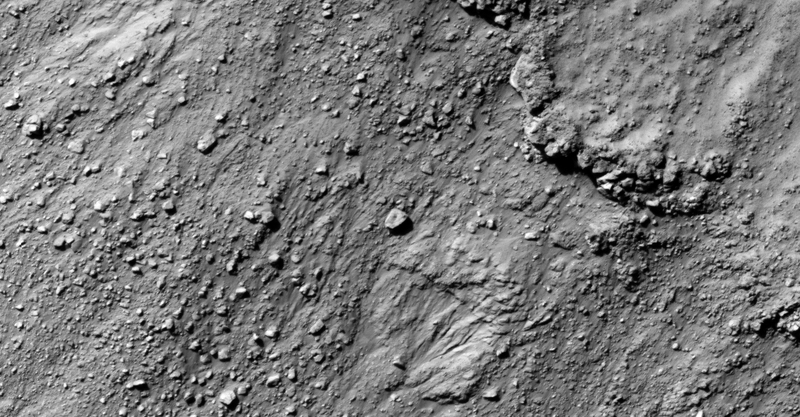 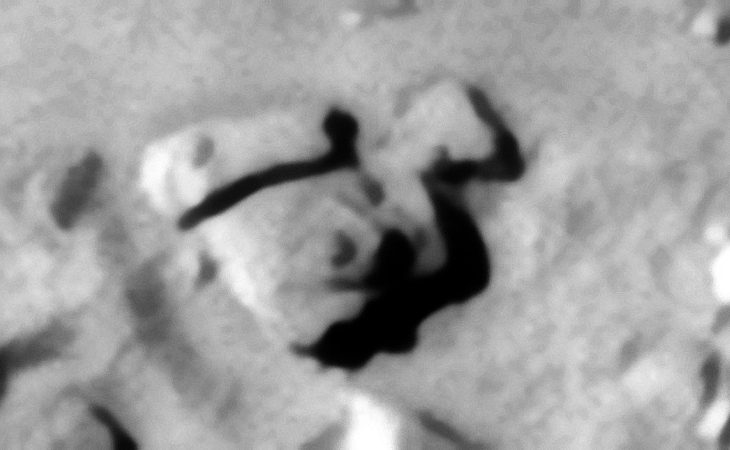 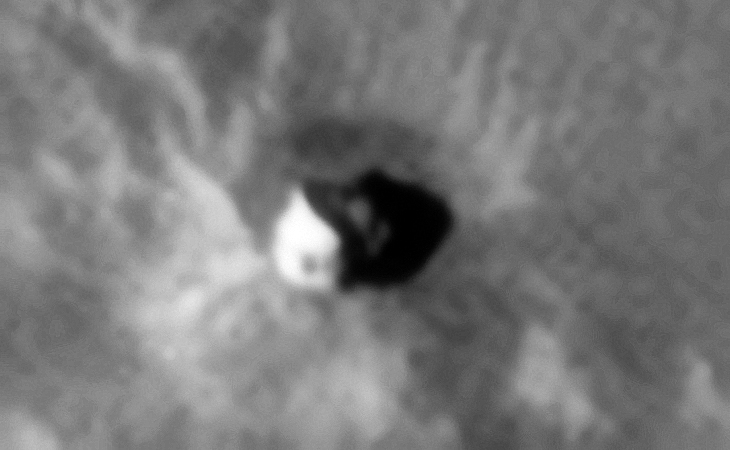 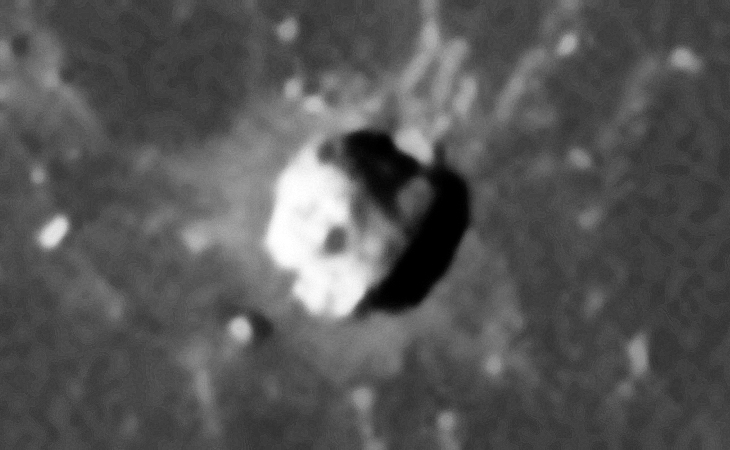 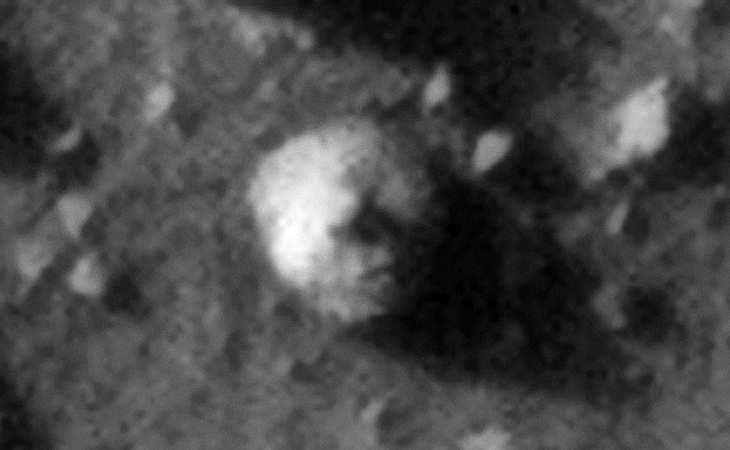 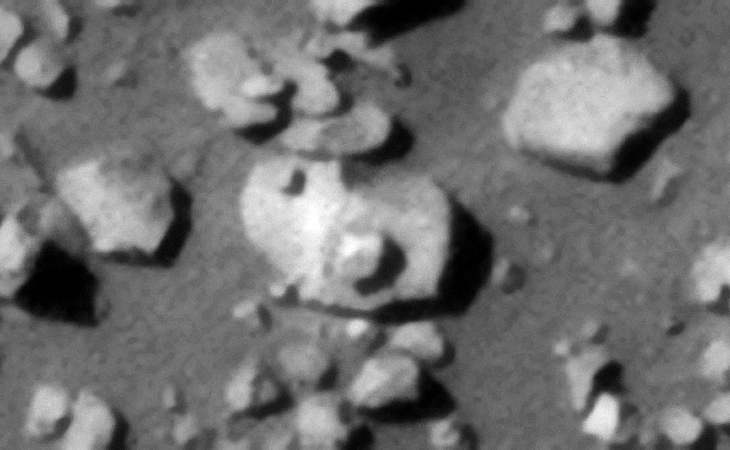 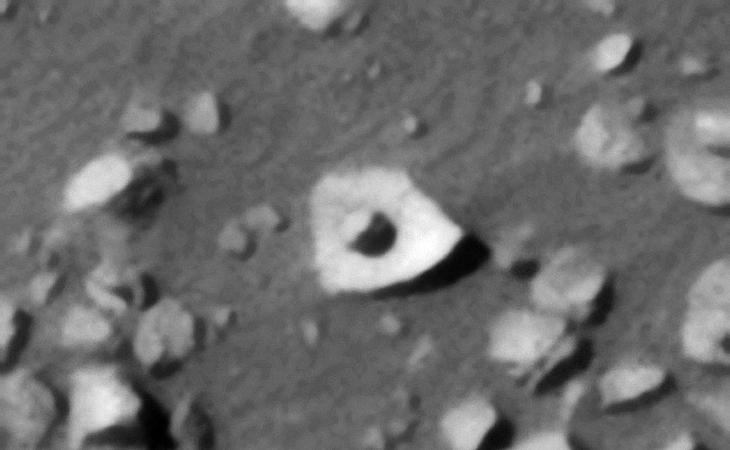 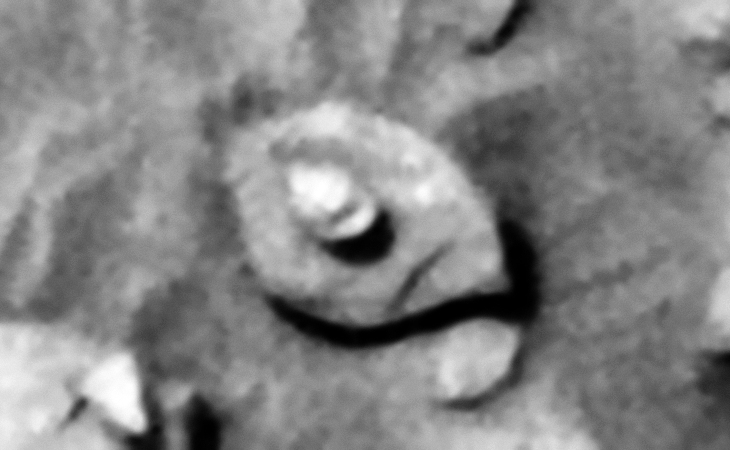 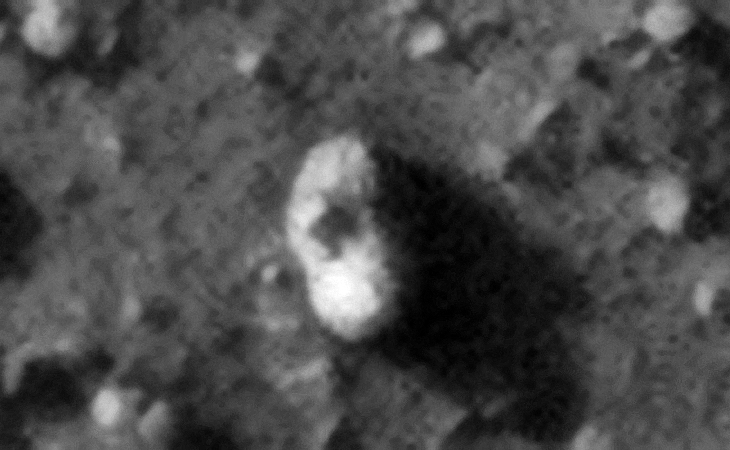 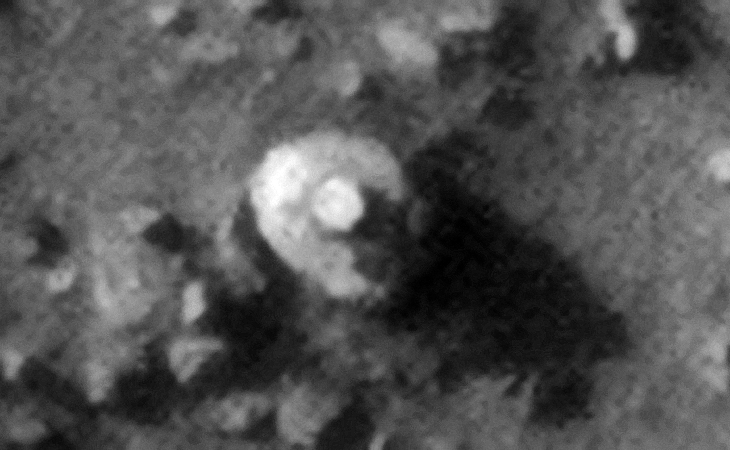 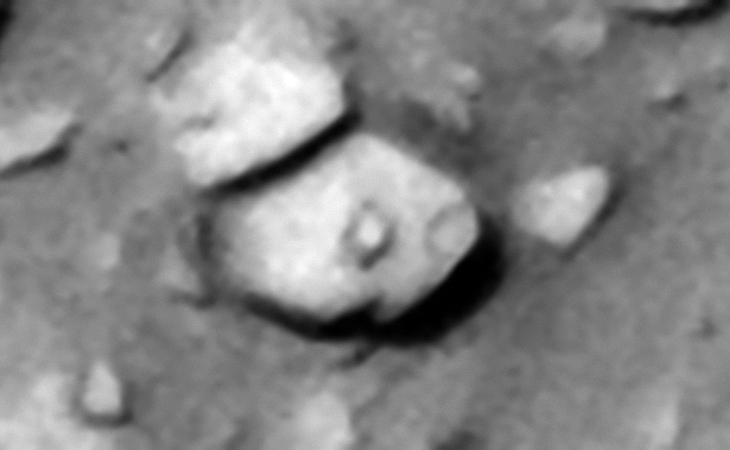 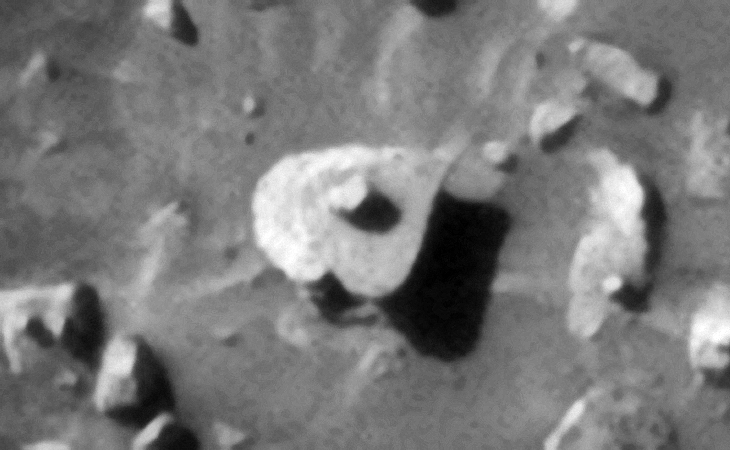 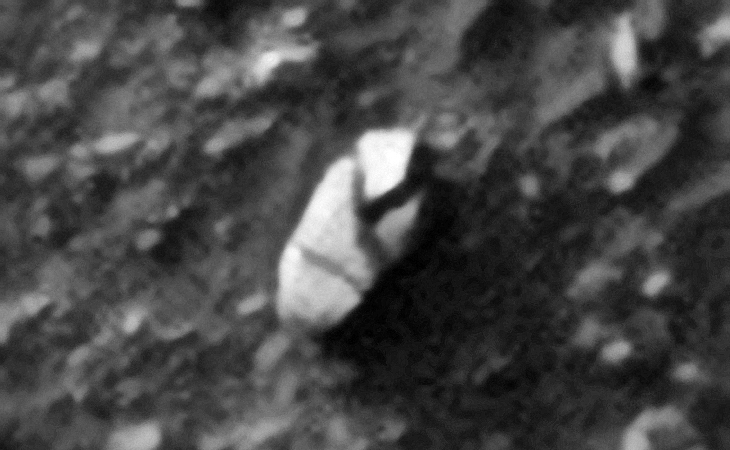 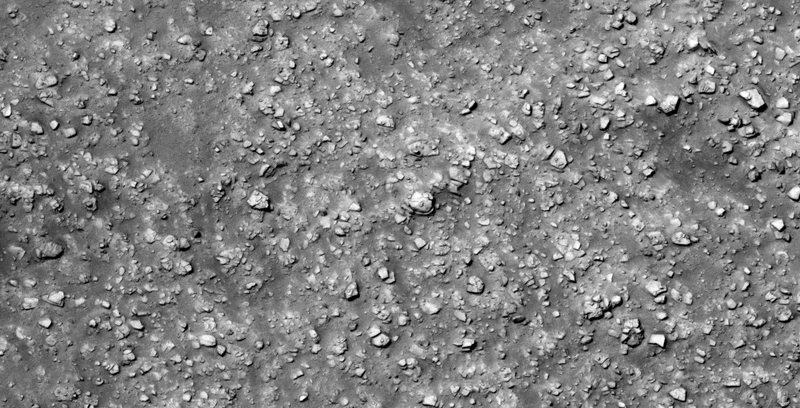 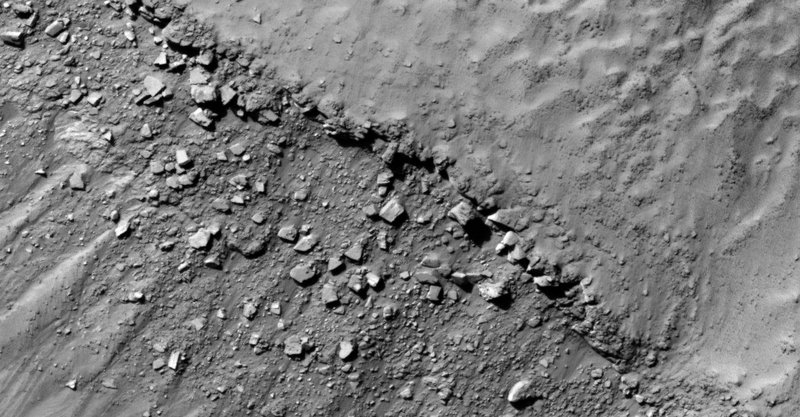 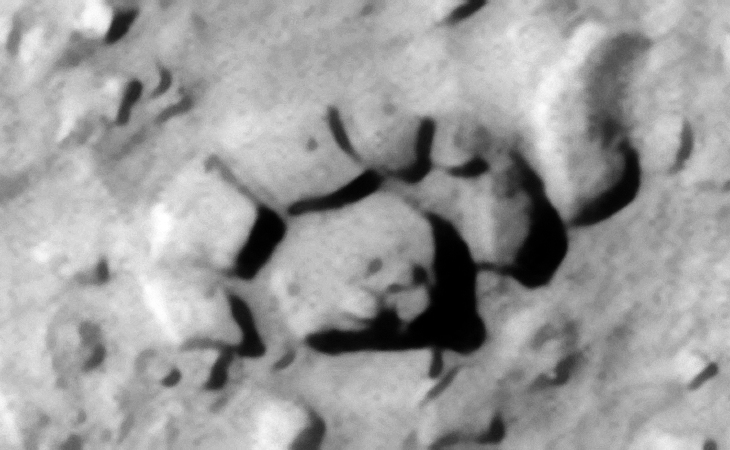 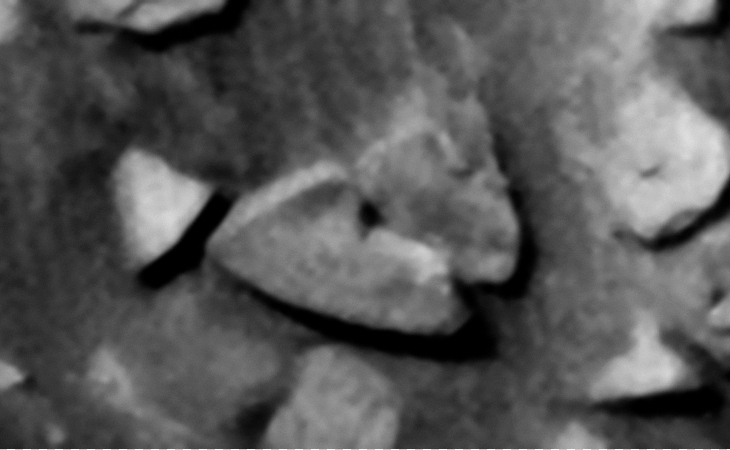 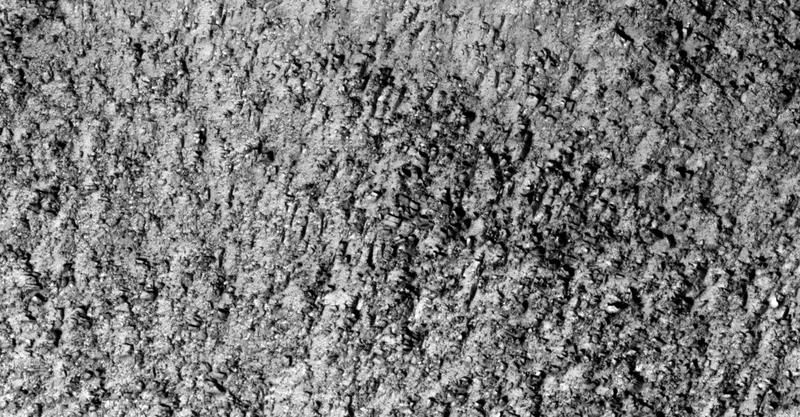 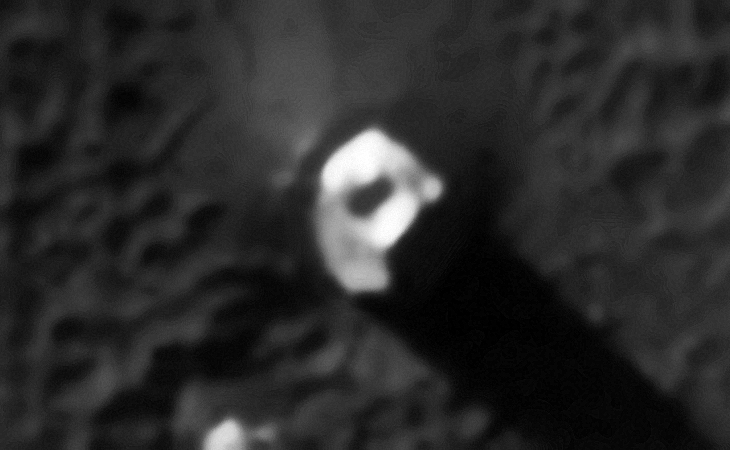 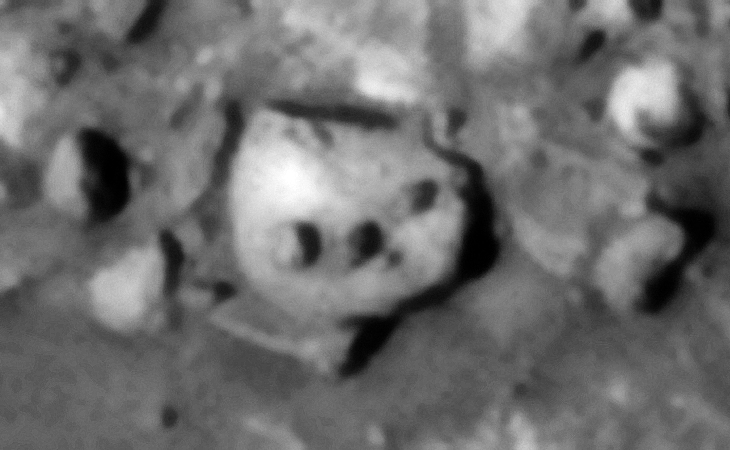 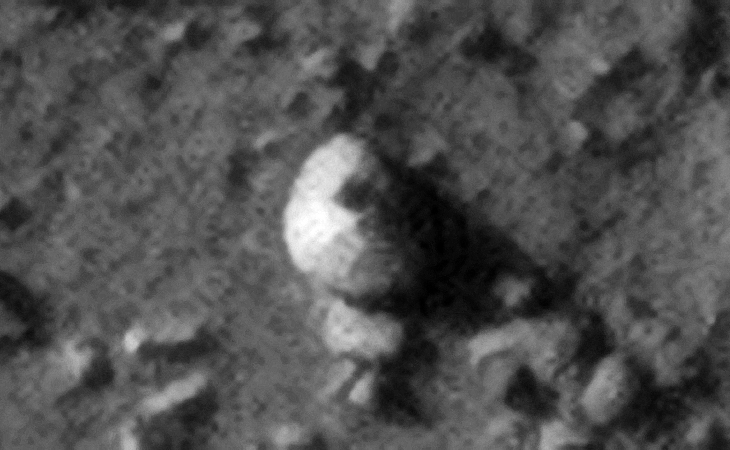 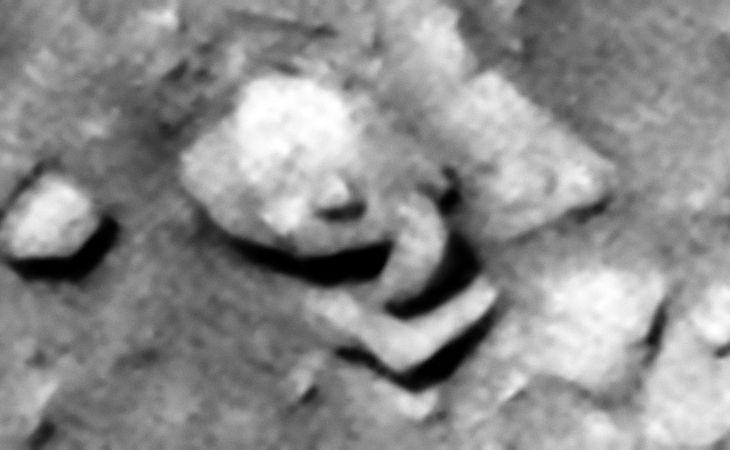 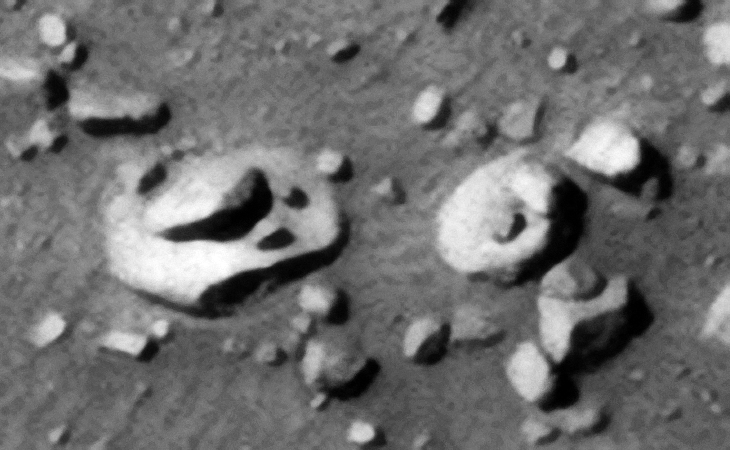 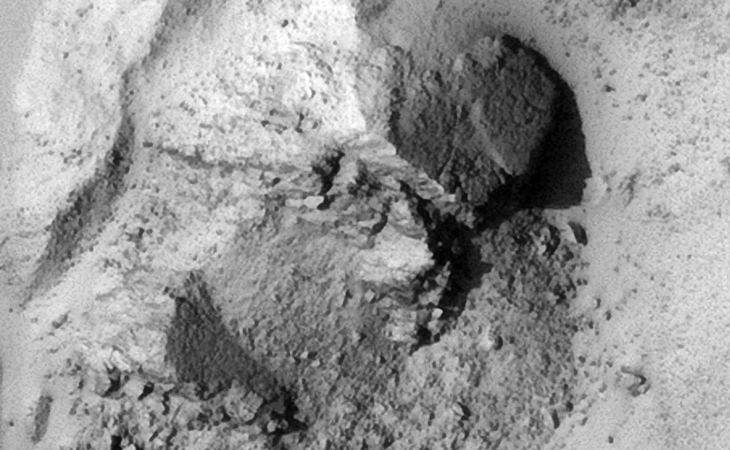 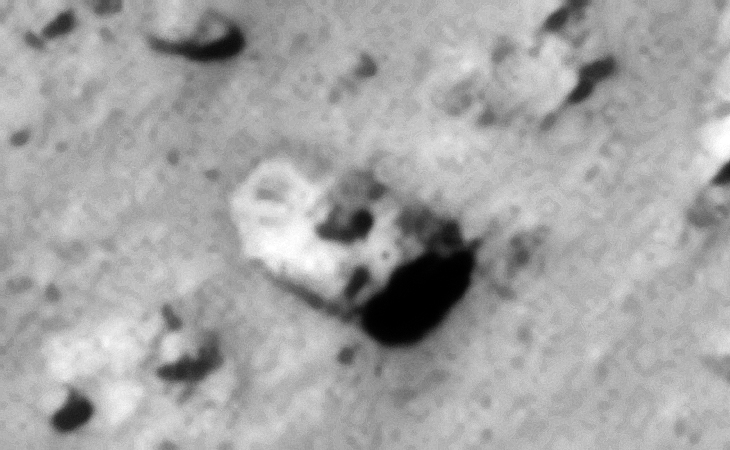 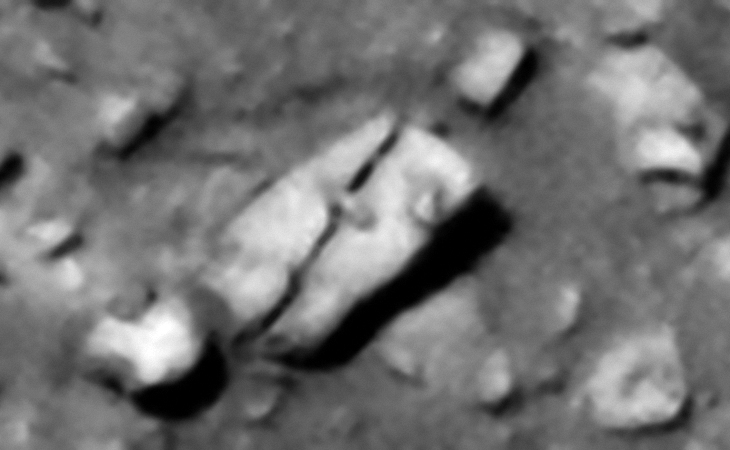 As the photographs taken by the orbiters is top-down it is difficult to estimate the depth, unless a megalith is lying on one of its sides. Some megaliths on Mars are much bigger than those found on Earth. 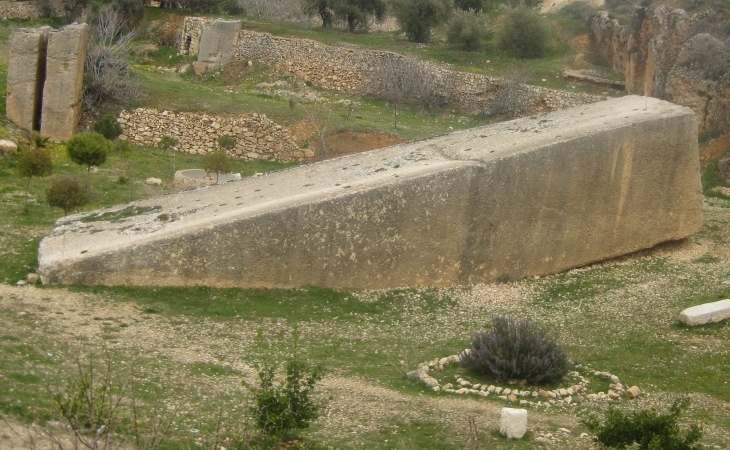 Furthermore the megaliths have mostly flat, smooth surfaces, well defined straight edges and 90 degree/right-angle corners. 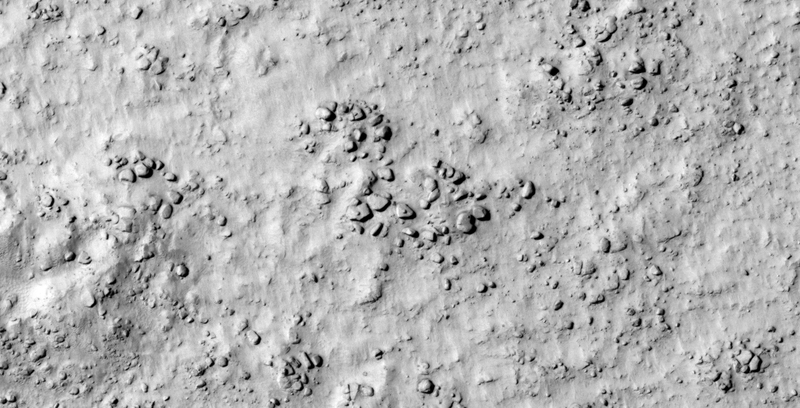 Small features, knobs or holes are mostly located in the center of the megaliths, which is highly unnatural. 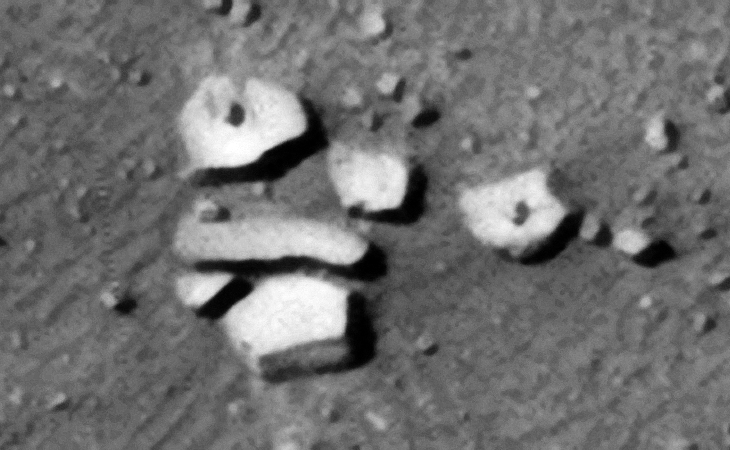 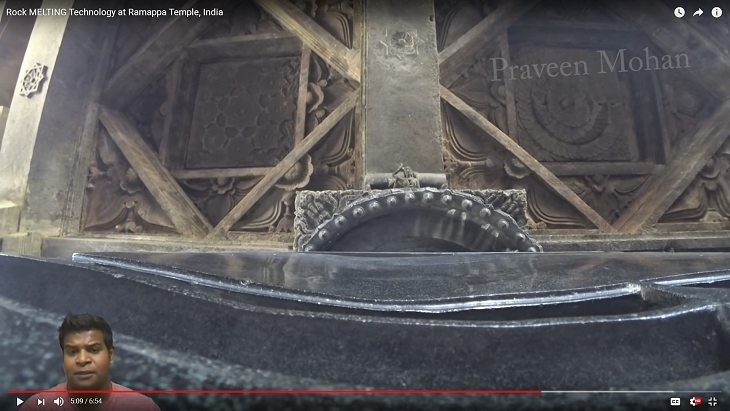 I speculate this geometry indicates intelligent design, furthermore that the same technique used to design and manufacture these megaliths on Earth was also used on Mars. 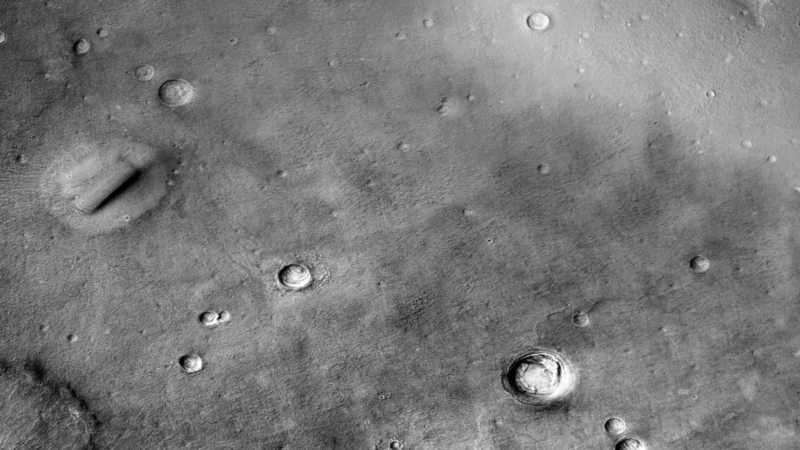 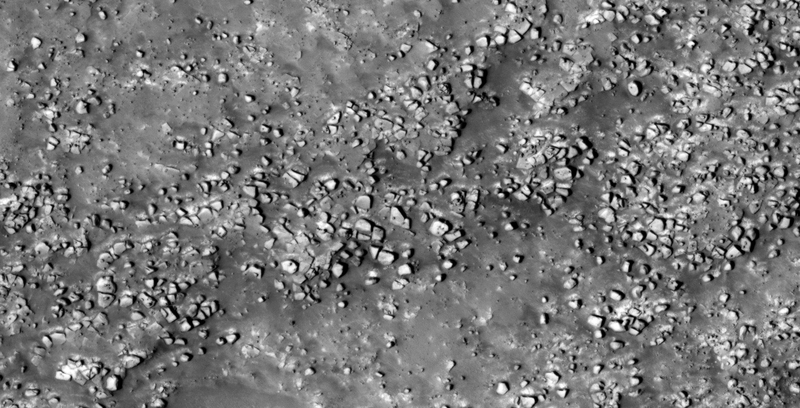 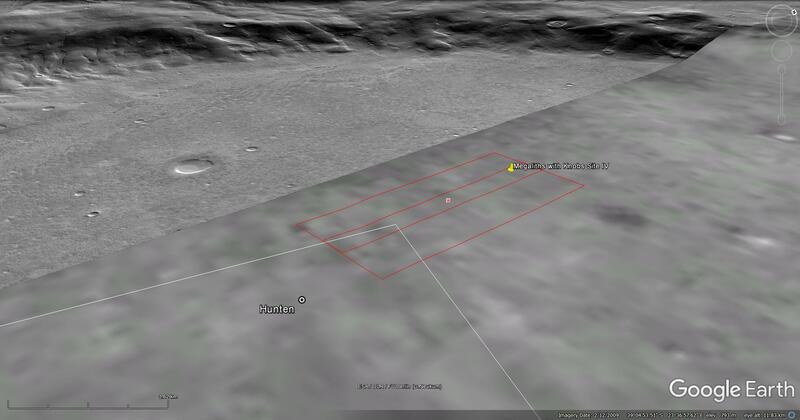 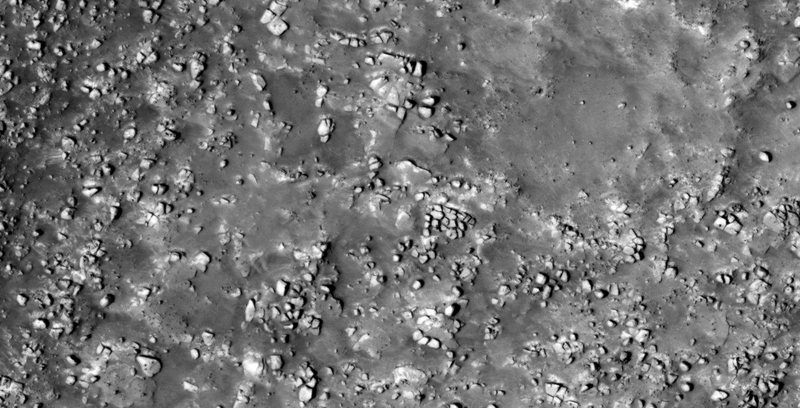 Where are these strange ancient megaliths and ruins located on Mars? The vast majority of sites at which I discovered these peculiar megaliths with holes/knobs are in two latitude bands, one band in the Northern hemisphere and the other band in the Southern hemisphere, however a few other sites also featured here fall outside these bands. 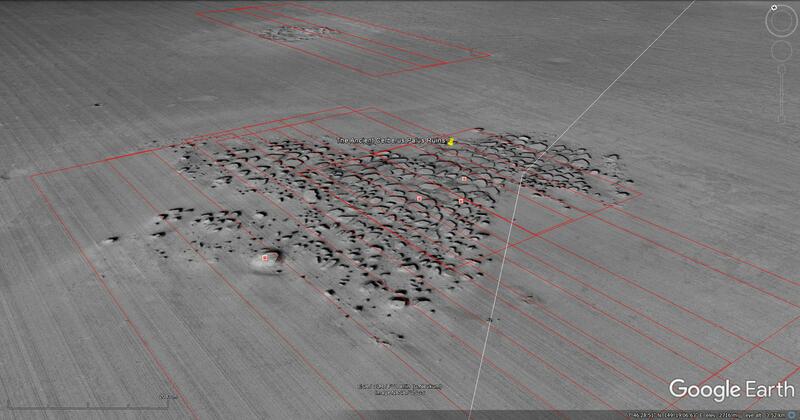 The Northern hemisphere band ranges between latitudes 28 degrees North and 49 degrees North – in this band I discovered 6 sites with these peculiar megaliths – the distance between the 1st site and the last site is about 5300 km with varying distances between the remaining sites. 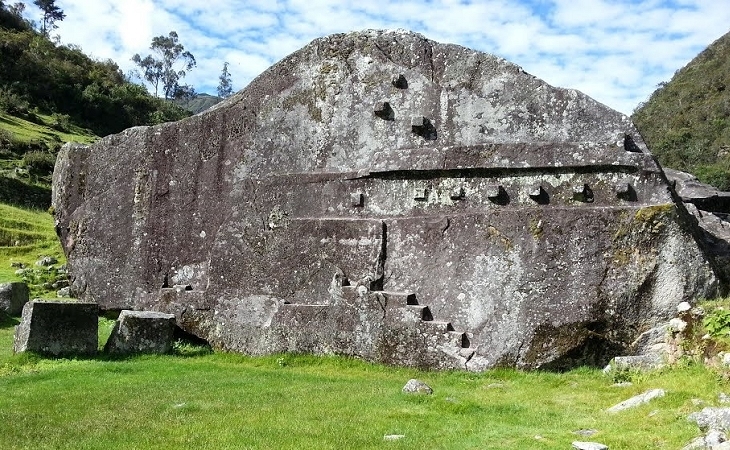 The Southern hemisphere band ranges between latitudes 51 degrees South and 36 degrees South – in this band I discovered 11 sites right around the planet, with these peculiar megaliths – the distance between these sites vary, for example 2800 km, 330 km, 1800 km 630 km and so on. 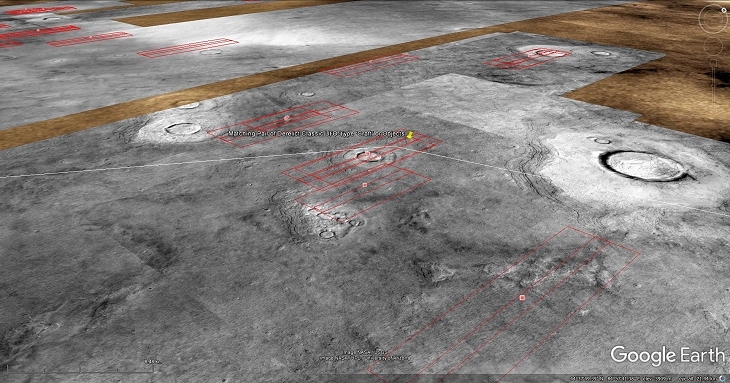 All of the sites examined here appear to have been devastated by some catastrophic event is the past. 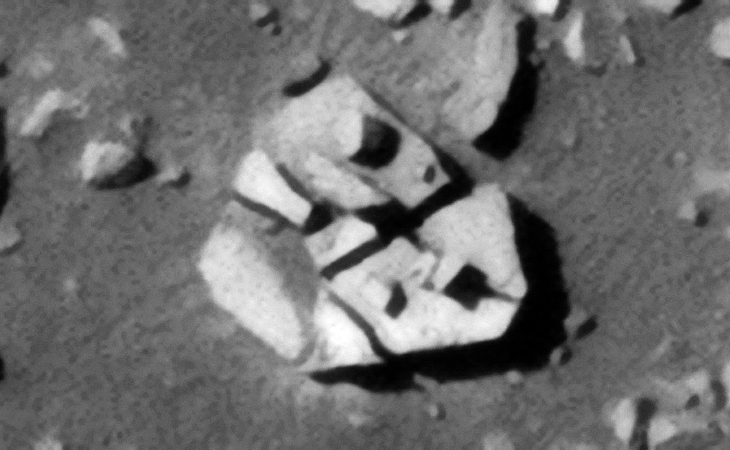 Many megaliths are scattered about and some show sign of erosion or damage. 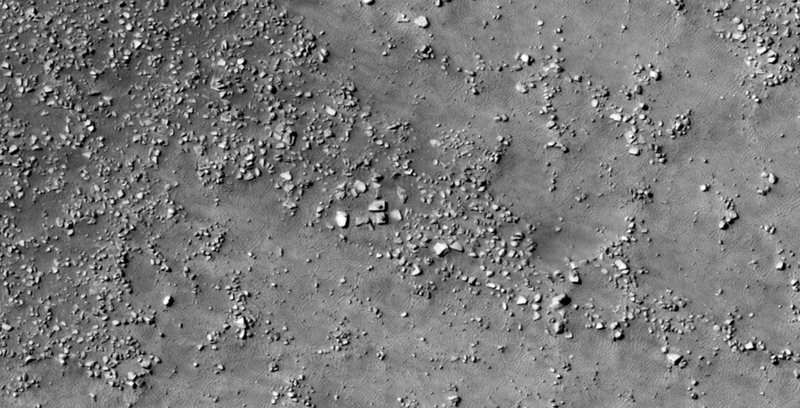 The structures or ruins are totally destroyed and in most cases only foundations are visible. 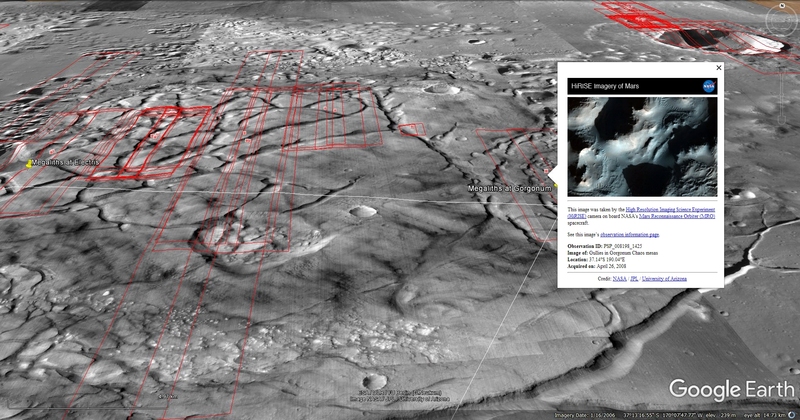 This is a collaborative work between Saturn Ark and RaptorZone in which further evidence supporting the speculation of a Kunowsky-Asimov Ley Line which connects ancient ruins is presented. 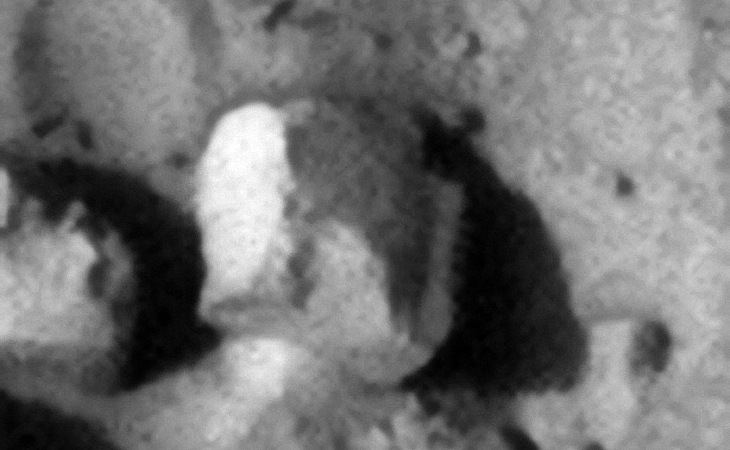 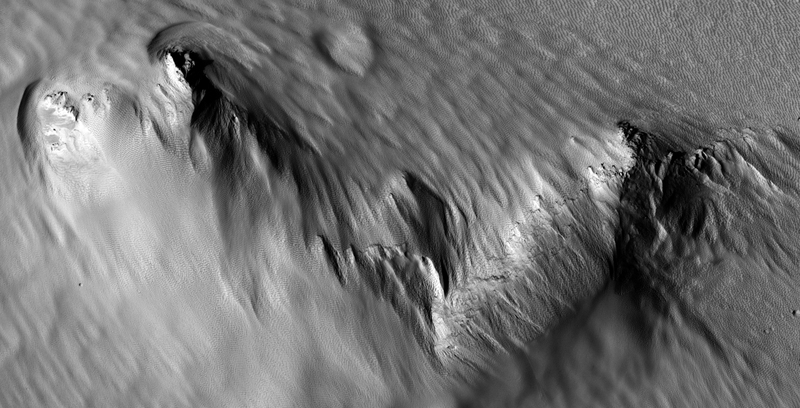 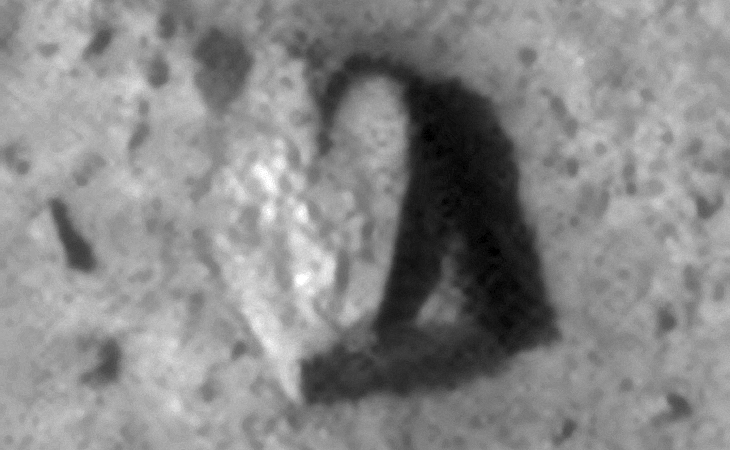 This photograph (PSP_007447_1995) was taken by NASA’s Mars Reconnaissance Orbiter (MRO) HiRISE Camera on 27 February 2008. 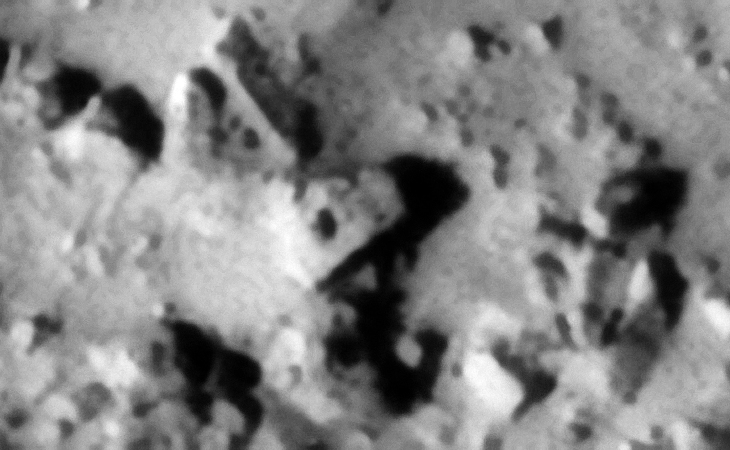 Discovered is what looks like huge ancient, eroded and damaged Monolithic/Megalithic blocks in Kotka Crater and an extensive debris field and perhaps mining operation. 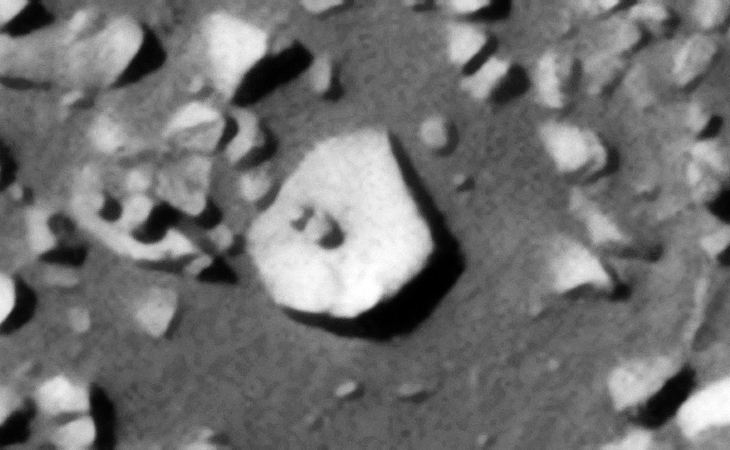 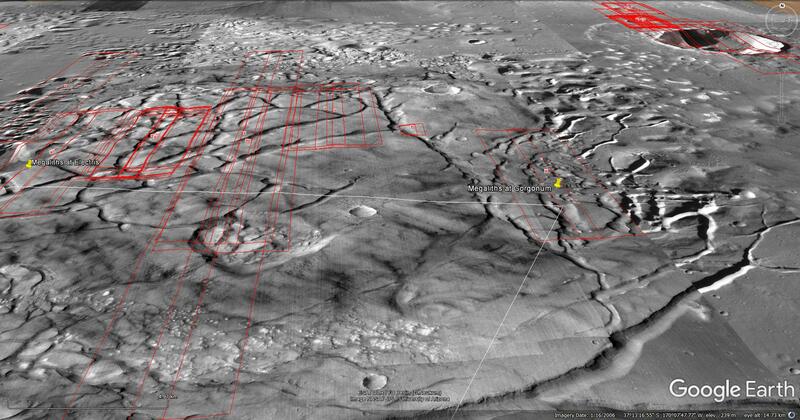 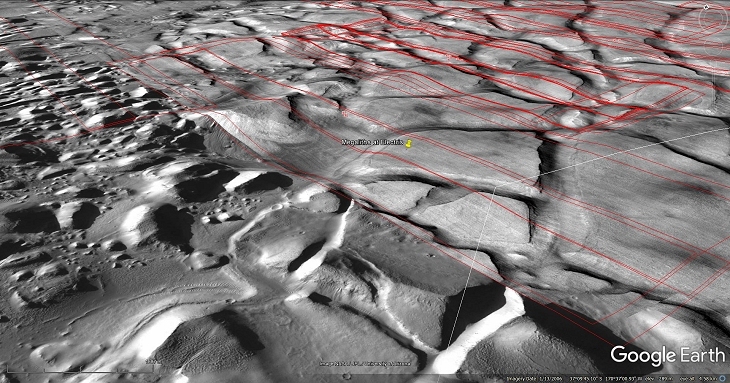 The Monolithic/Megalithic blocks in Kotka Crater look similar to the one in Asimov Crater, i.e. 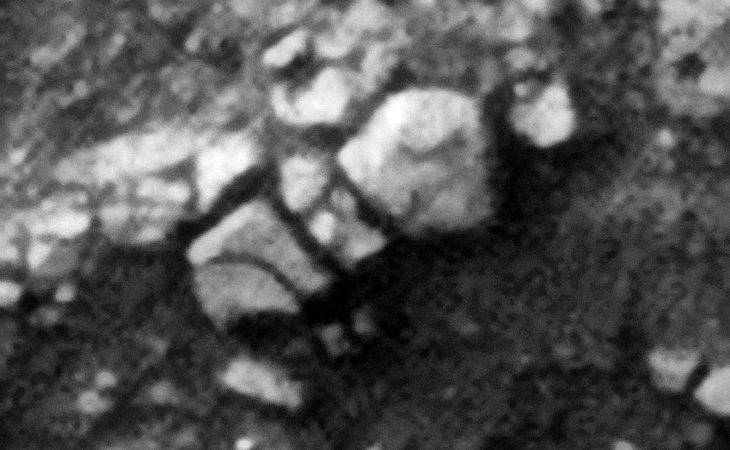 the textures and shade of colour appear similar. 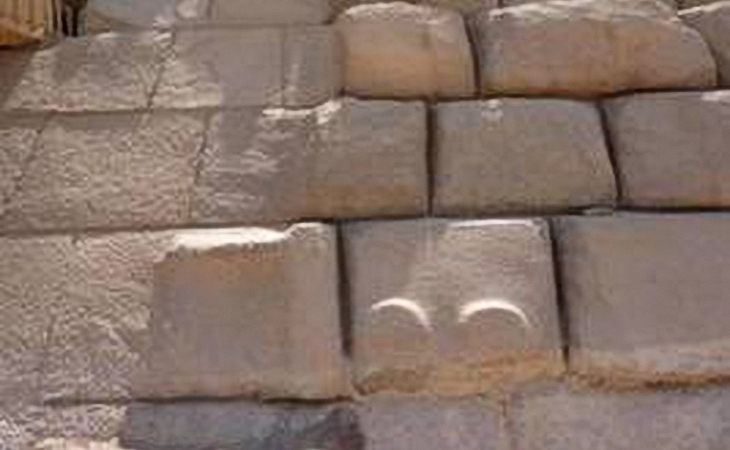 It is rather difficult to obtain any measurements from these blocks as they are partially buried in sand. 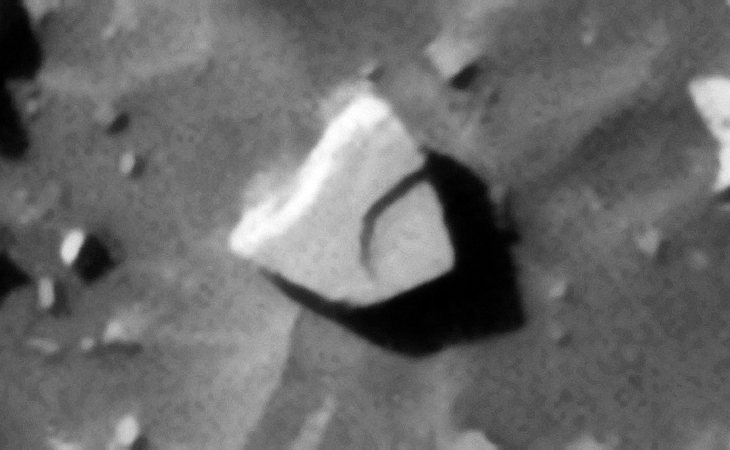 The one side that is visible measures between approximately 23 and 30 metres across (the angle makes it difficult to be certain and a piece may have broken off). 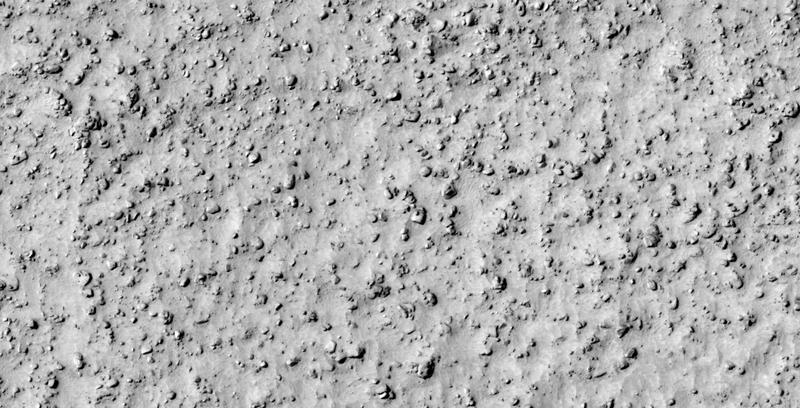 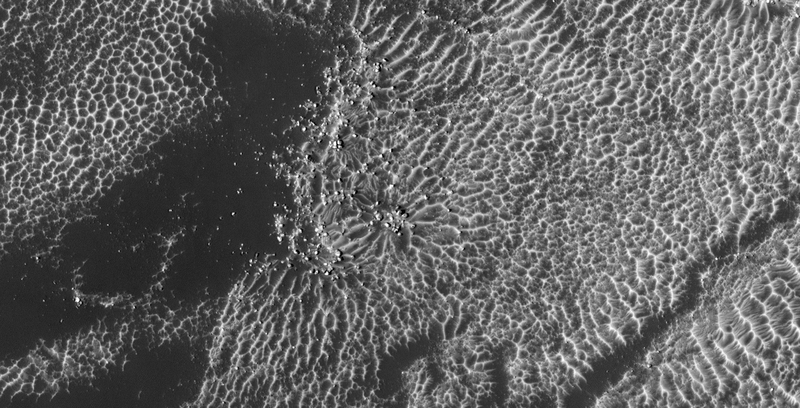 This photograph (ESP_034342_1315) was taken by NASA’s Mars Reconnaissance Orbiter (MRO) HiRISE Camera on 23 November 2013. 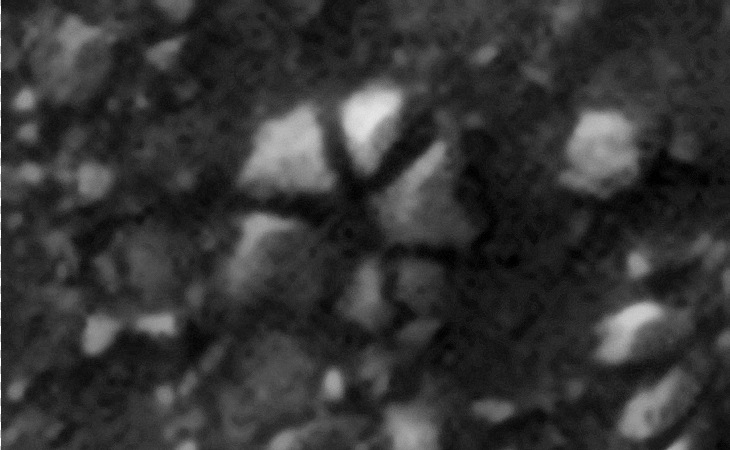 I discovered what looks like broken statues, structures and odd megaliths with very geometric shapes. 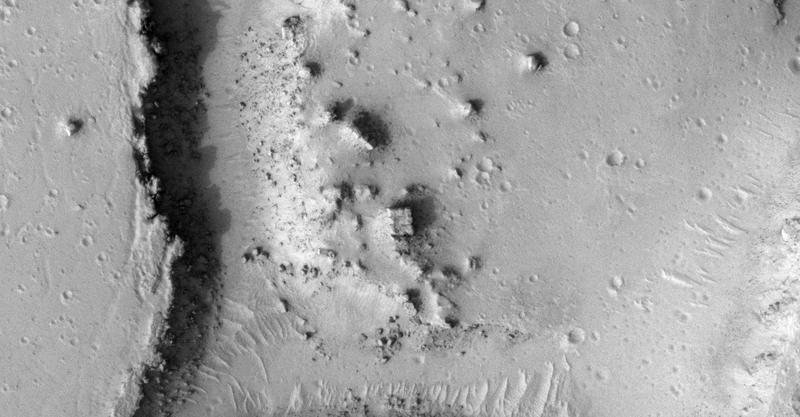 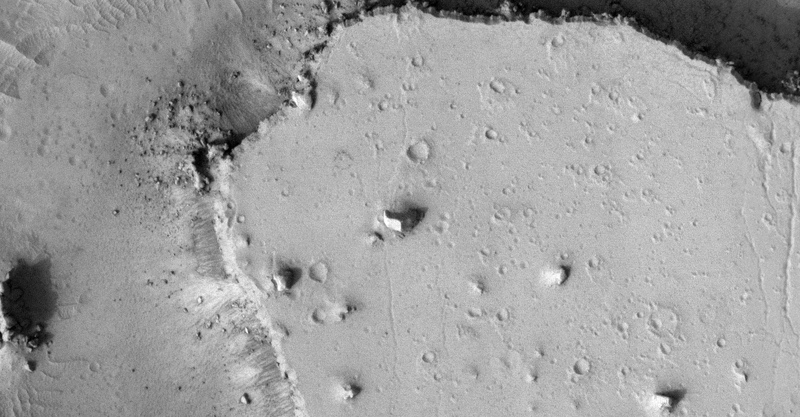 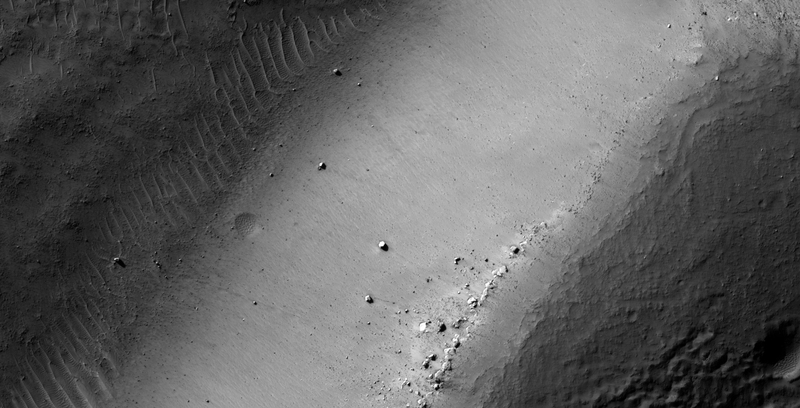 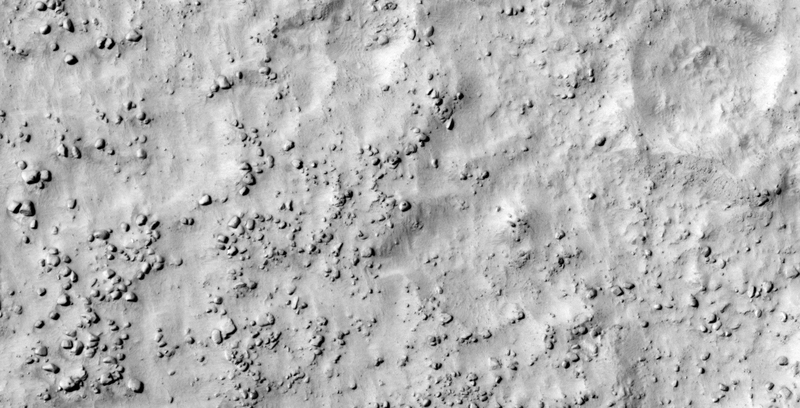 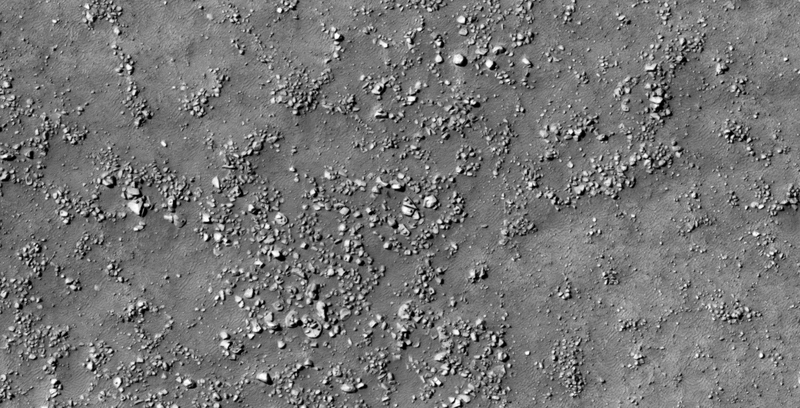 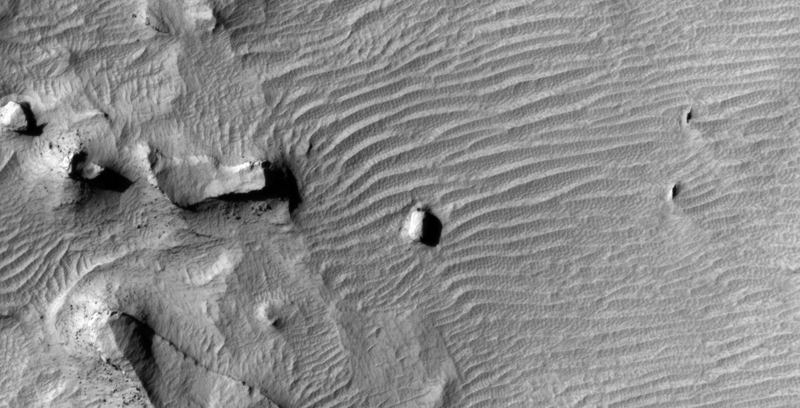 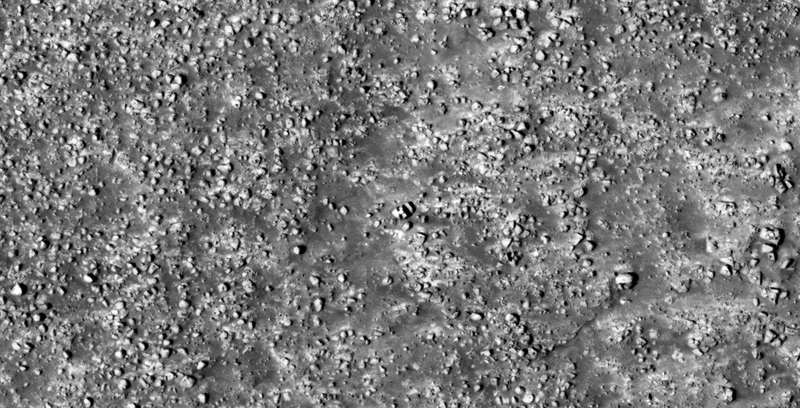 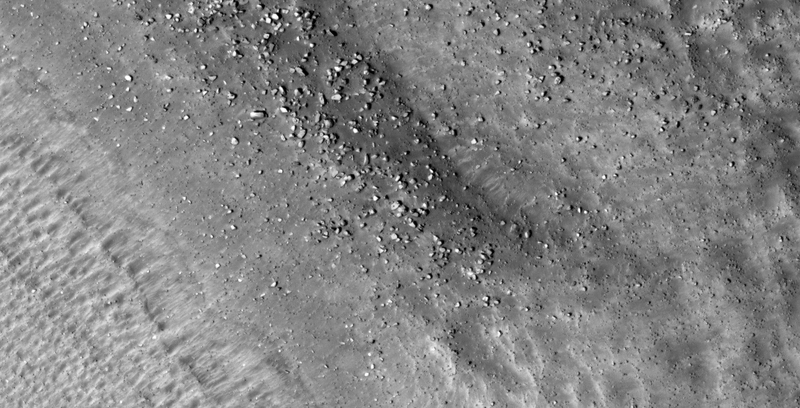 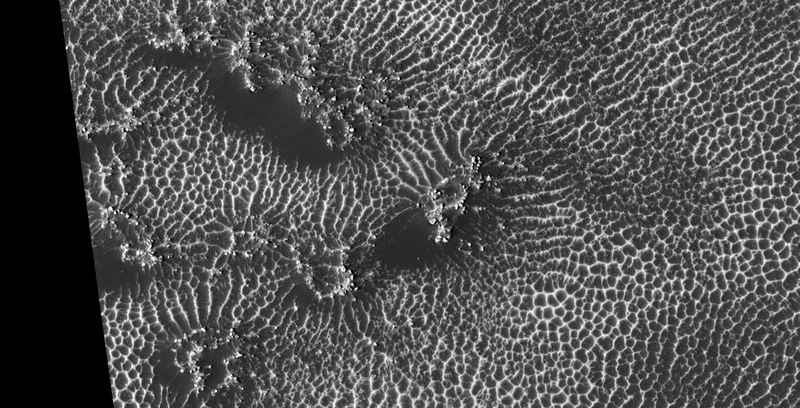 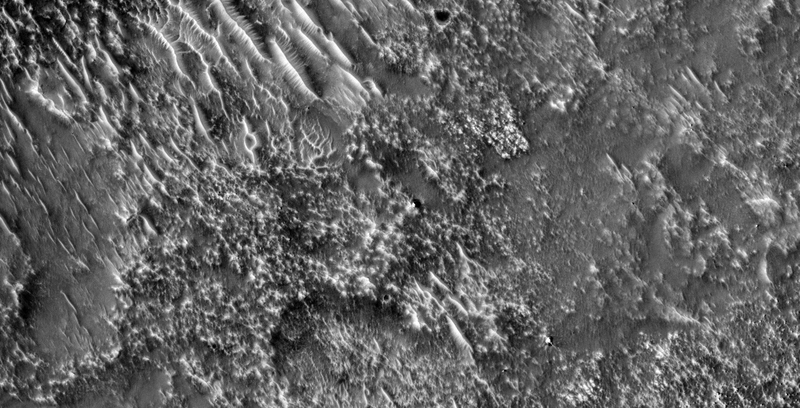 This photograph (PSP_003880_1325) was taken by NASA’s Mars Reconnaissance Orbiter (MRO) HiRISE Camera on 25 May 2007. 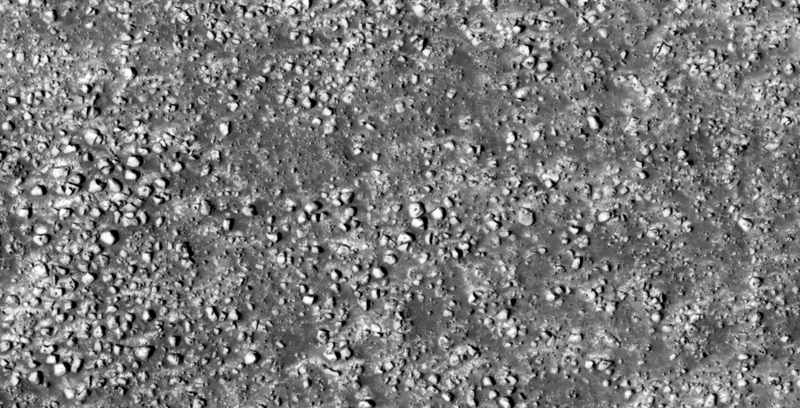 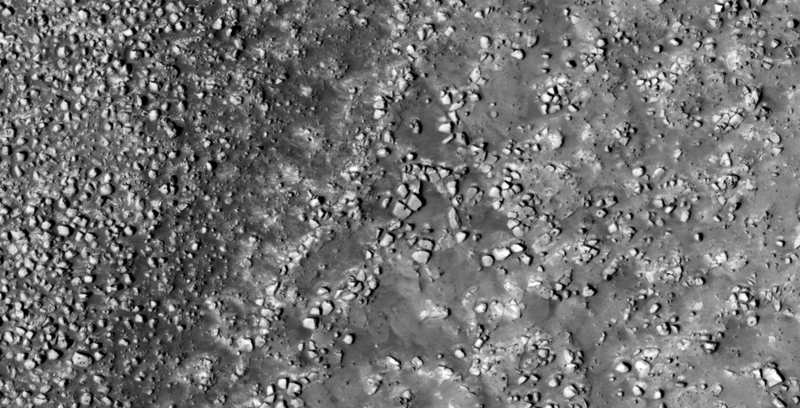 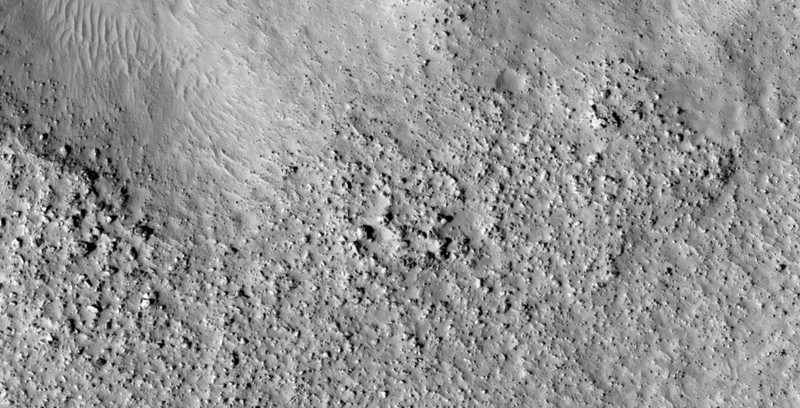 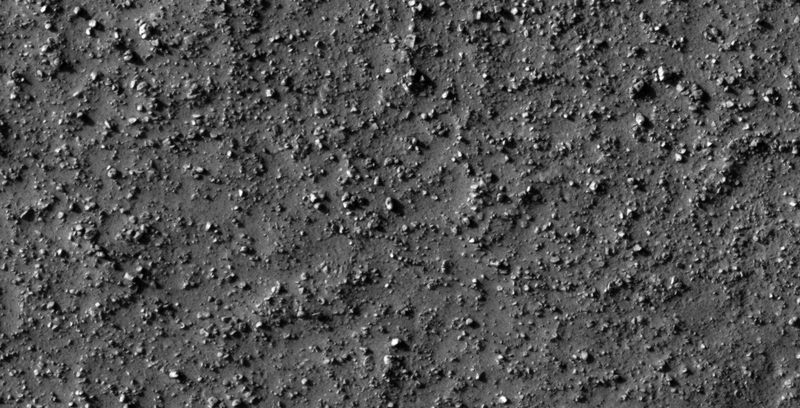 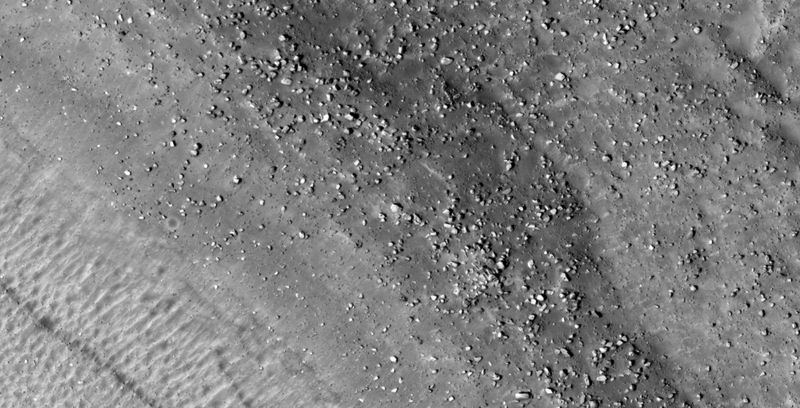 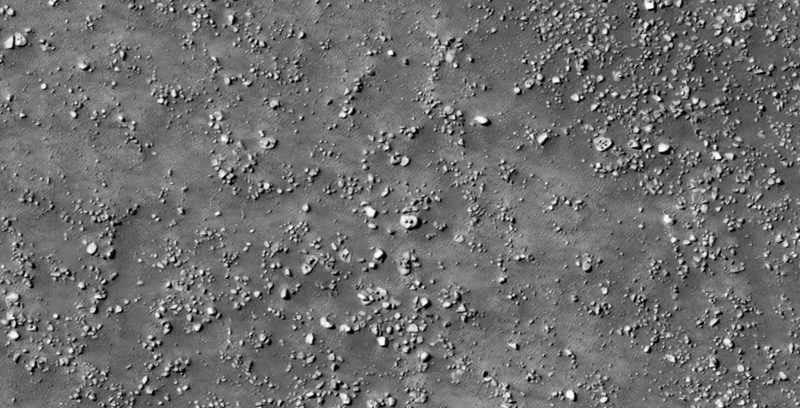 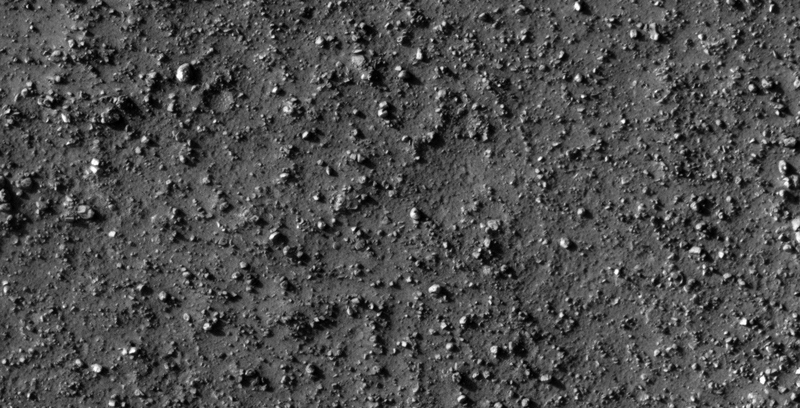 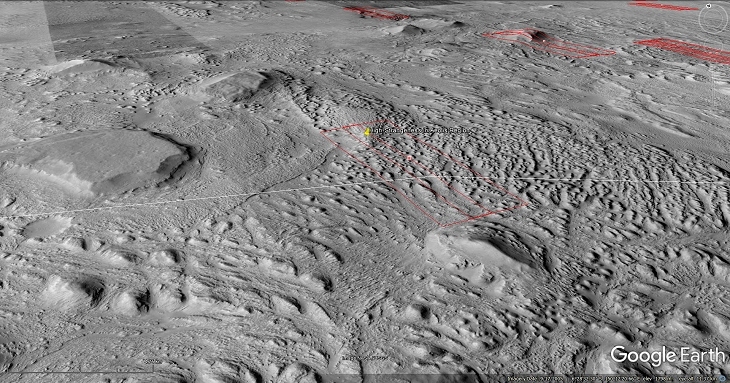 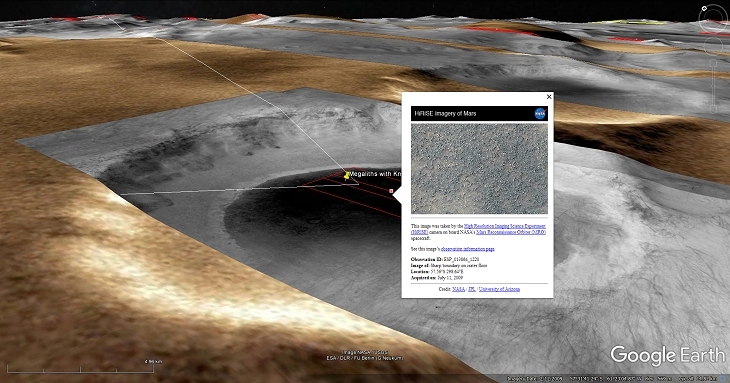 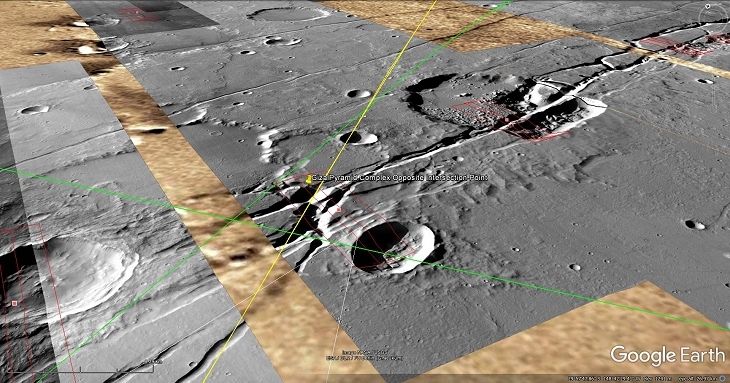 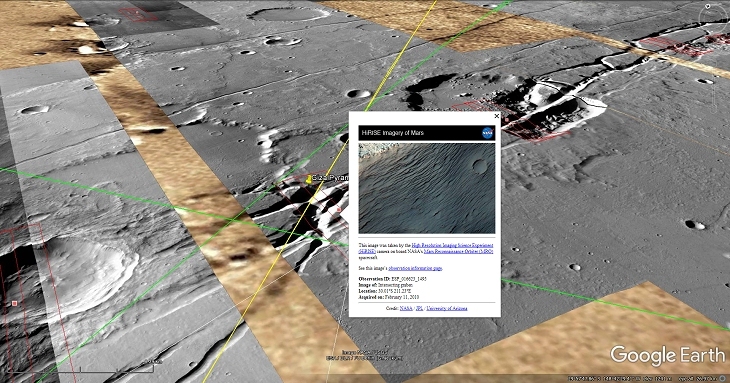 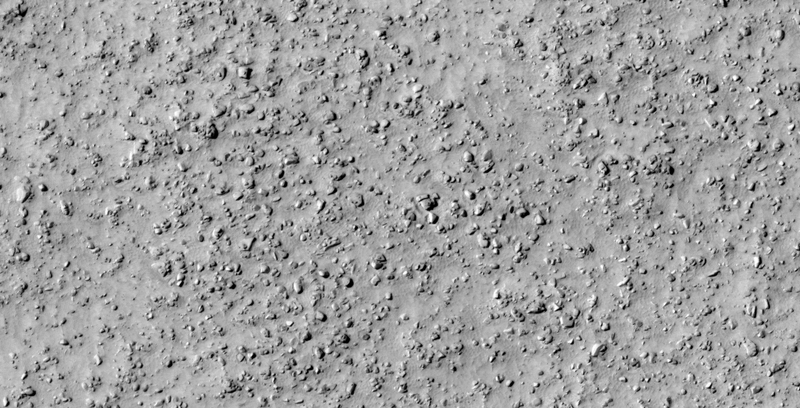 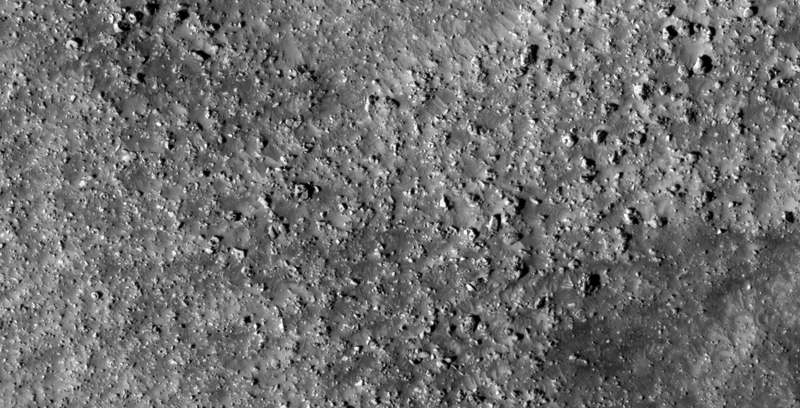 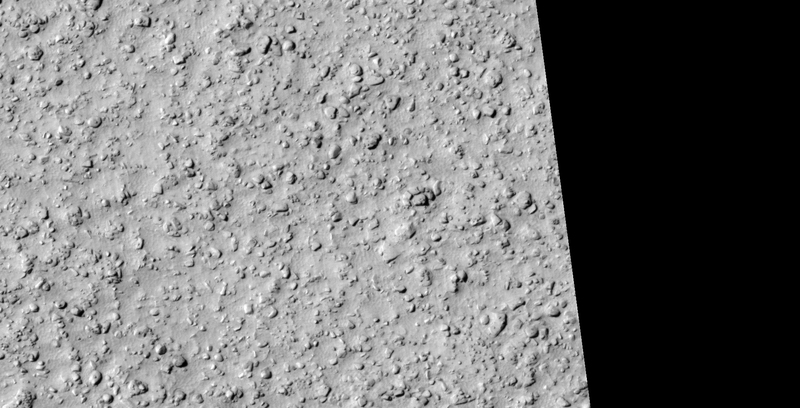 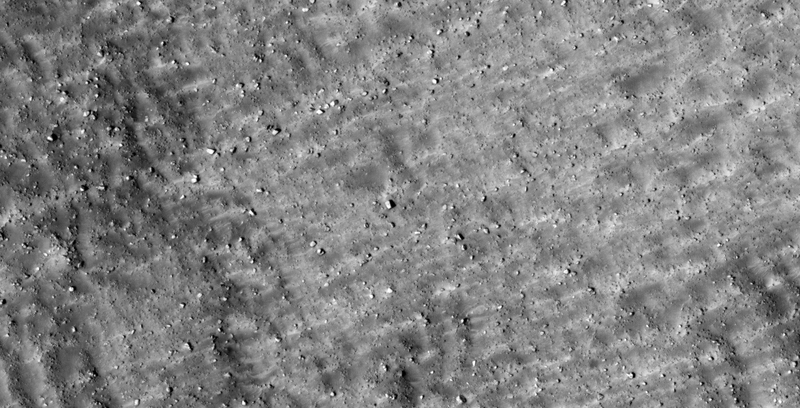 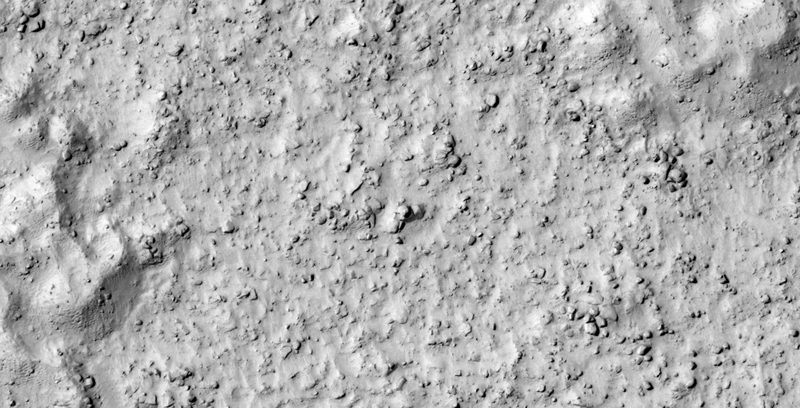 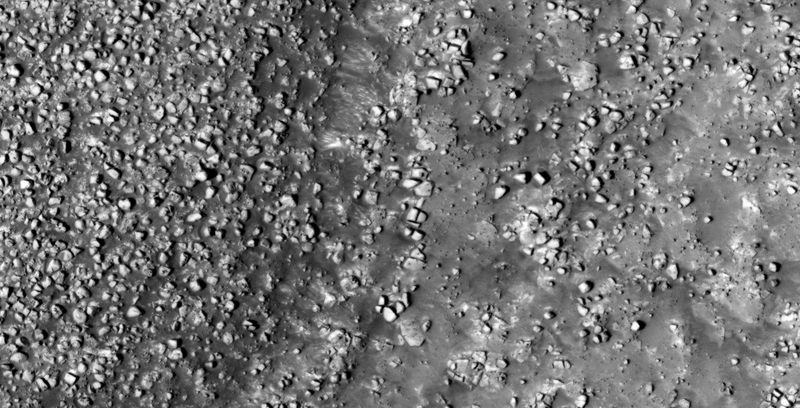 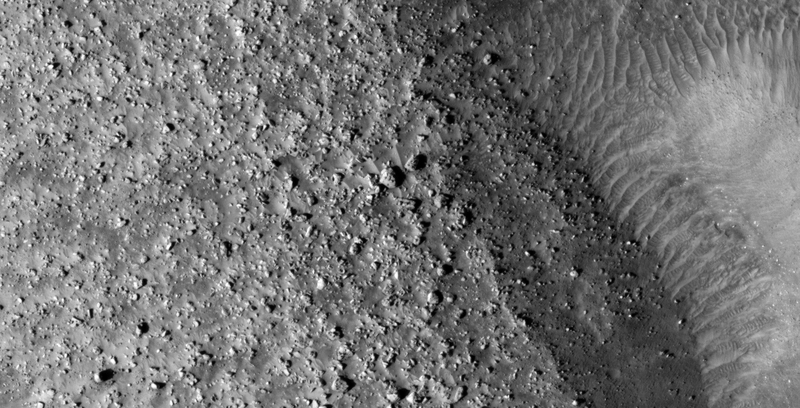 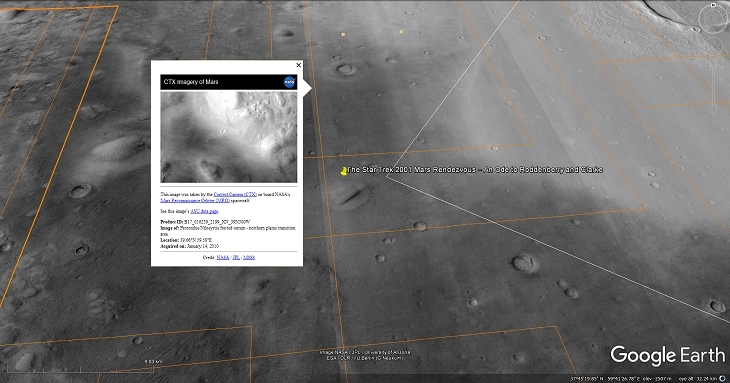 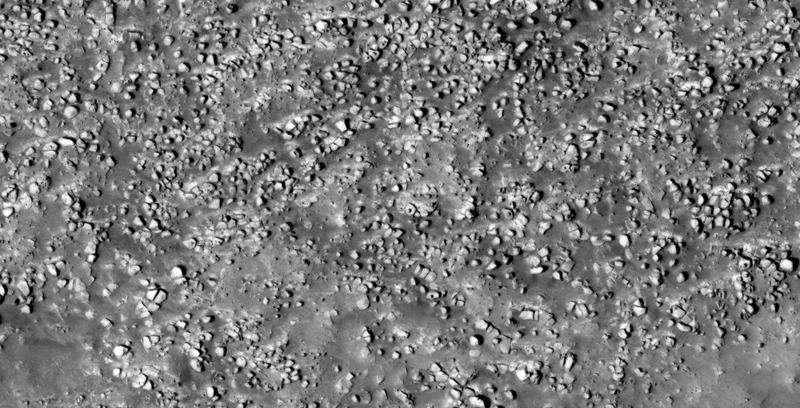 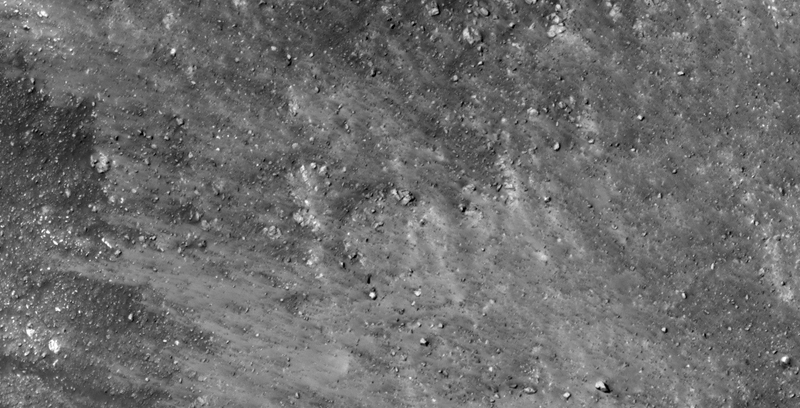 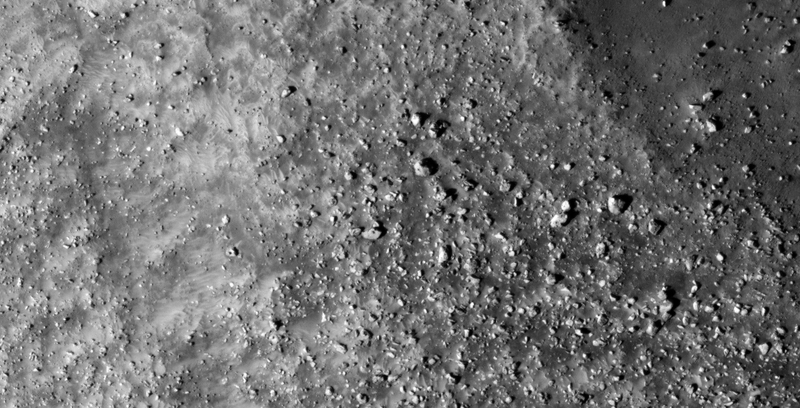 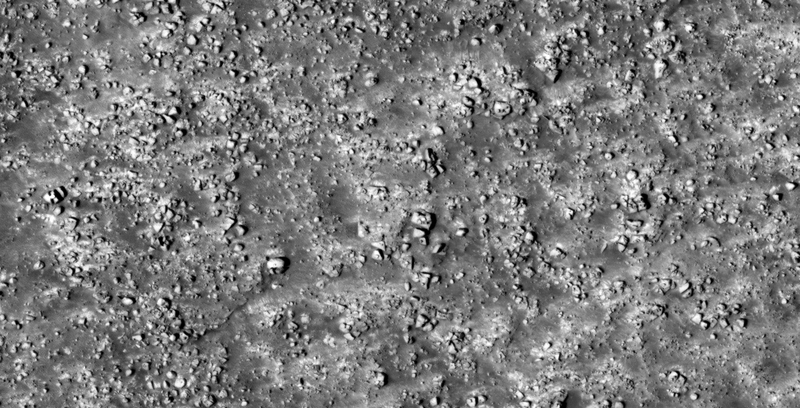 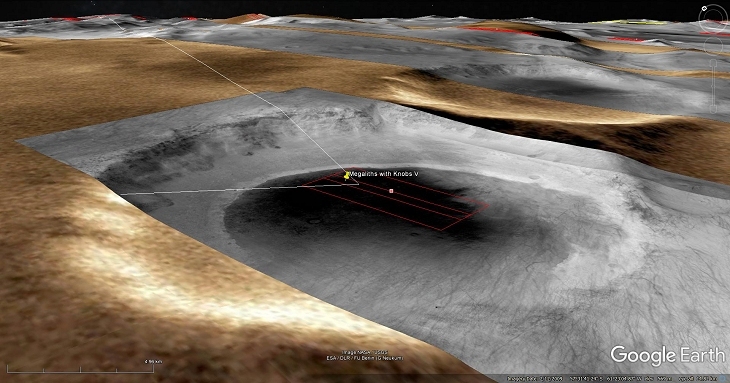 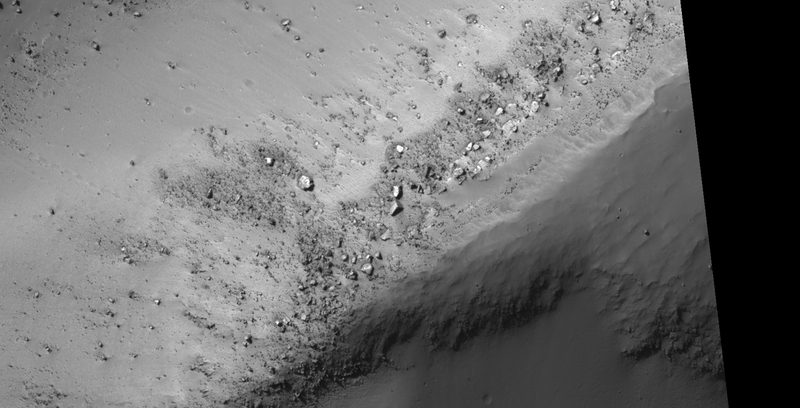 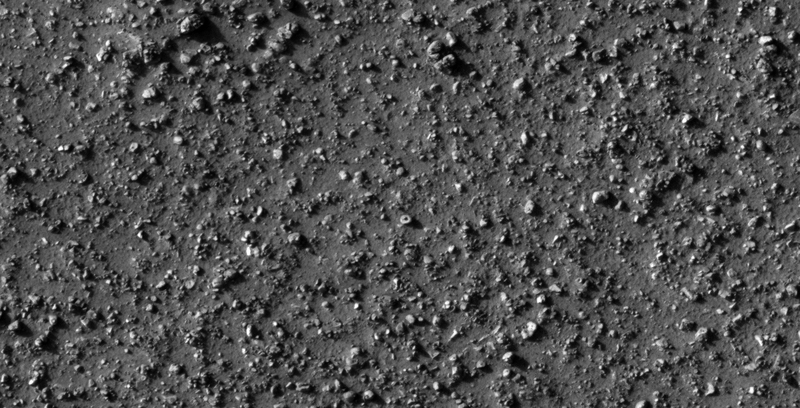 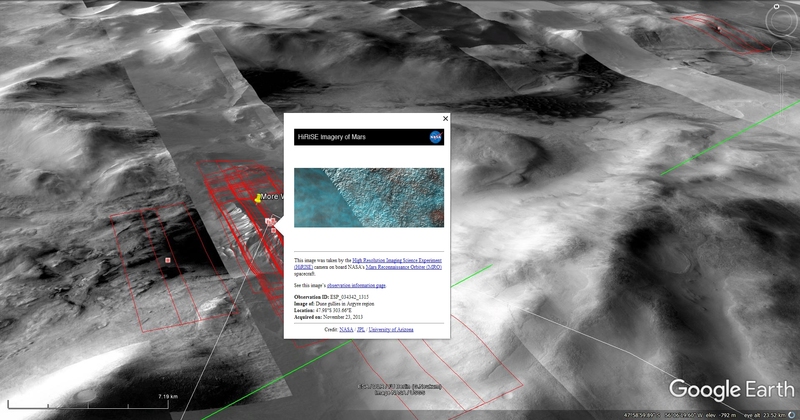 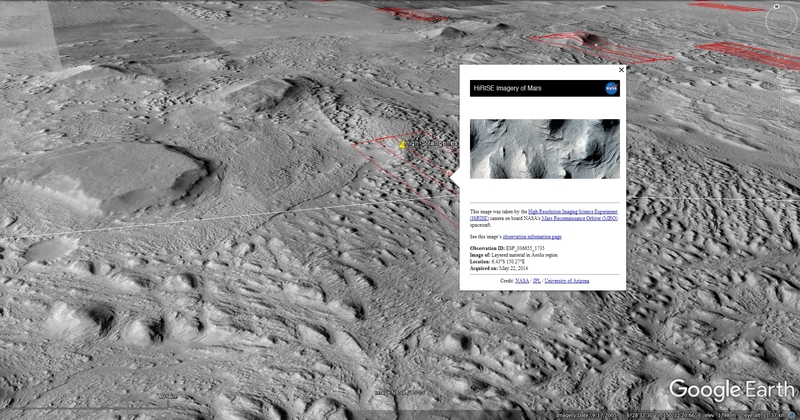 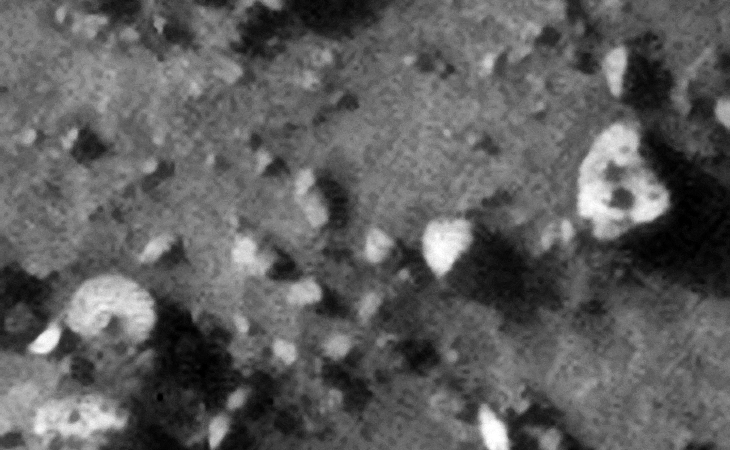 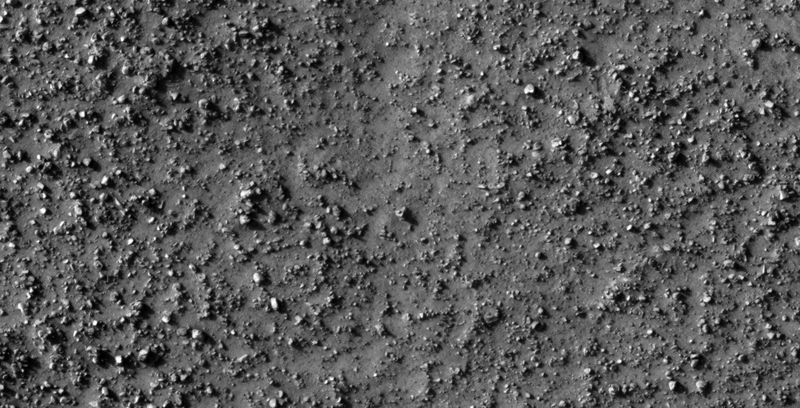 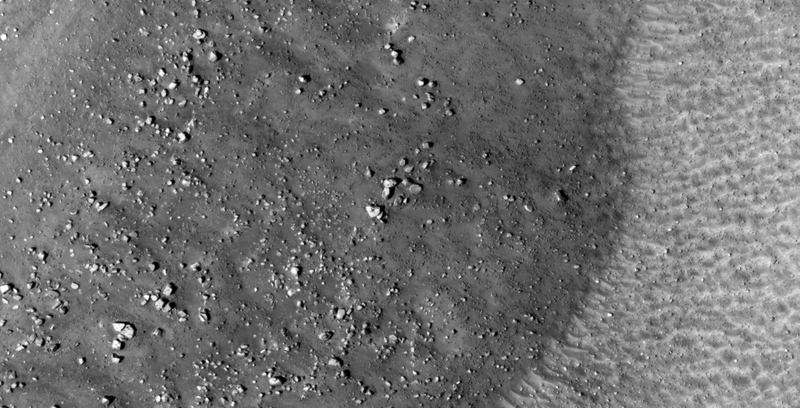 Discovered are what look like walls or structures in Asimov Crater. 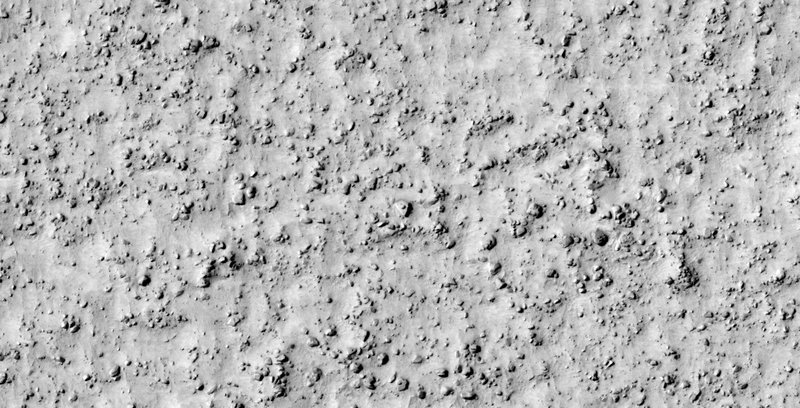 The sides of the building blocks appear to be covered in smooth, white, reflective material like plaster or cement. 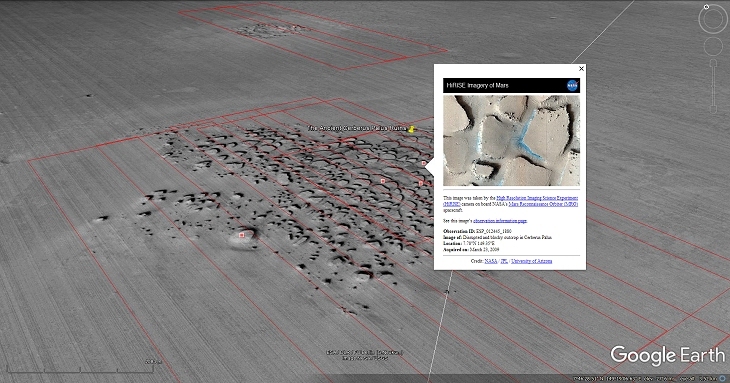 There are several huge megalithic blocks scattered about in the gullies. 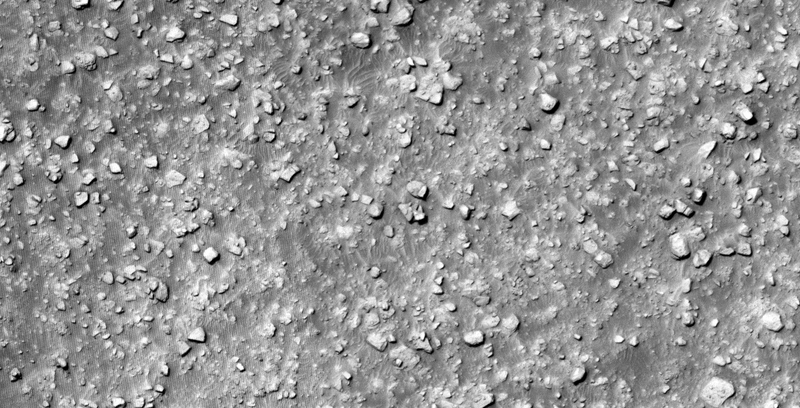 This photograph (ESP_032158_1185) was taken by NASA’s Mars Reconnaissance Orbiter (MRO) HiRISE Camera on 06 June 2013. 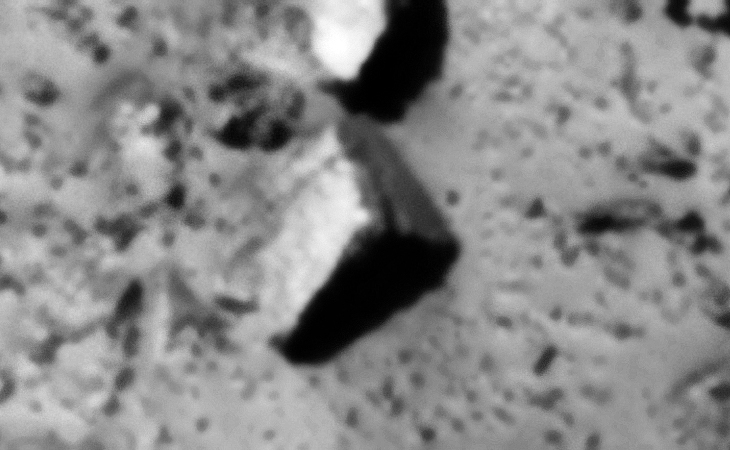 Discovered are what looks like a huge debris field of machine, vehicle, craft and structure pieces and parts (average size of these anomalies is between 3 m and 10 m across). 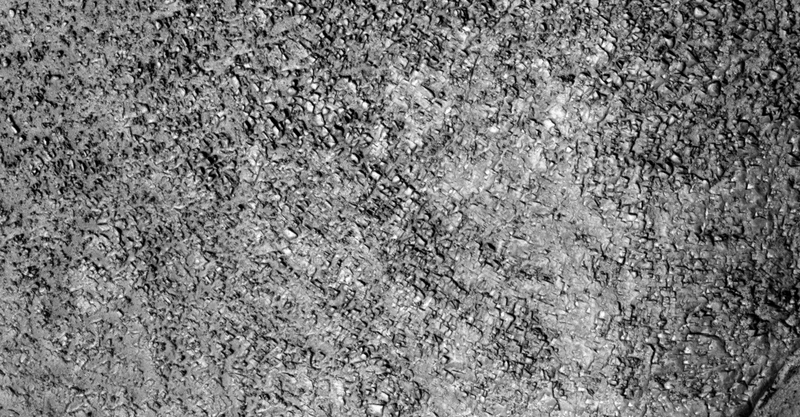 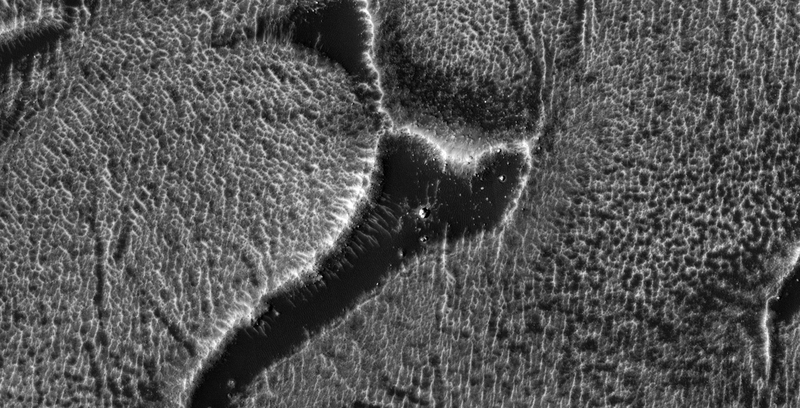 his photograph (ESP_035036_2225) was taken by NASA’s Mars Reconnaissance Orbiter (MRO) HiRISE Camera on 16 January 2014. 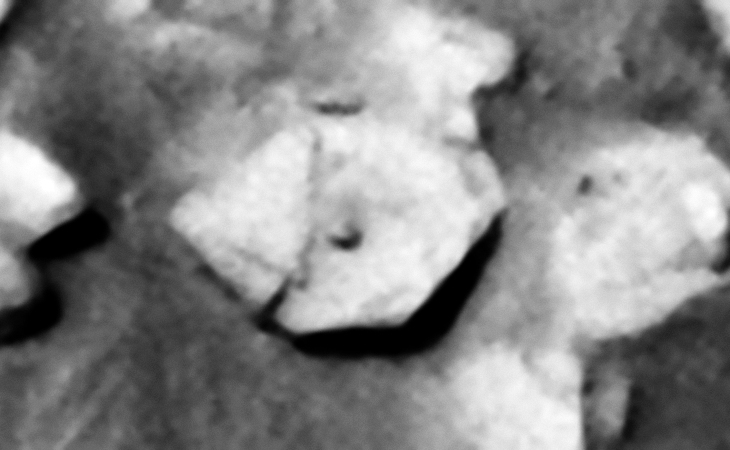 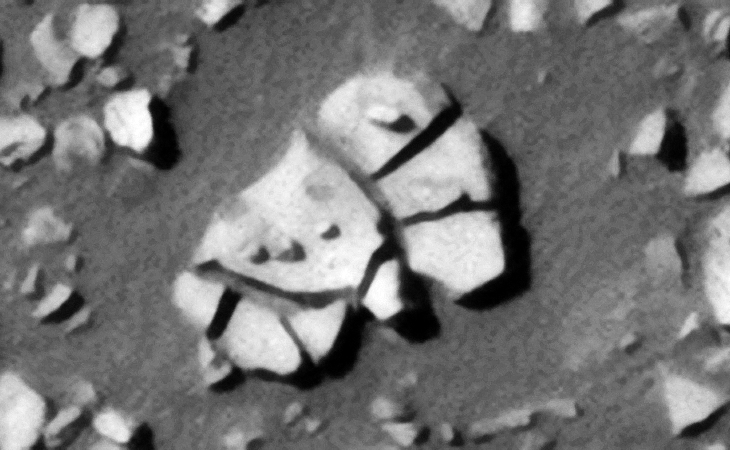 I discovered what looks like giant structures on Mars, in particular there is a large triangular structure measuring approximately 300 metres per side. 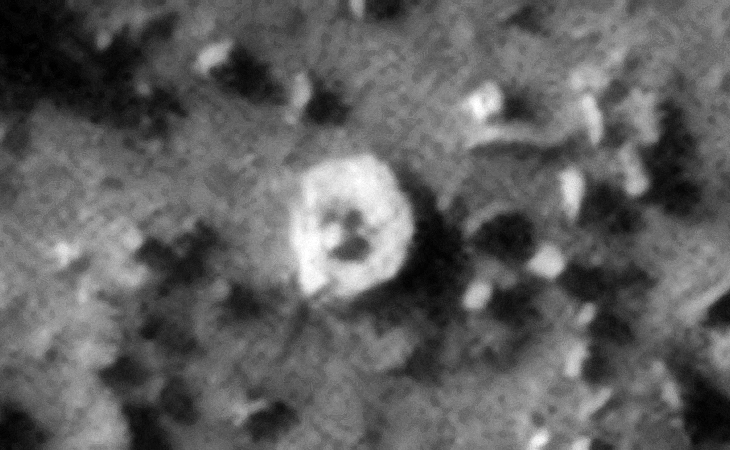 There are various other structures, including several small ‘Stonehenge-type’ structures each measuring approximately 40 metres in diameter. 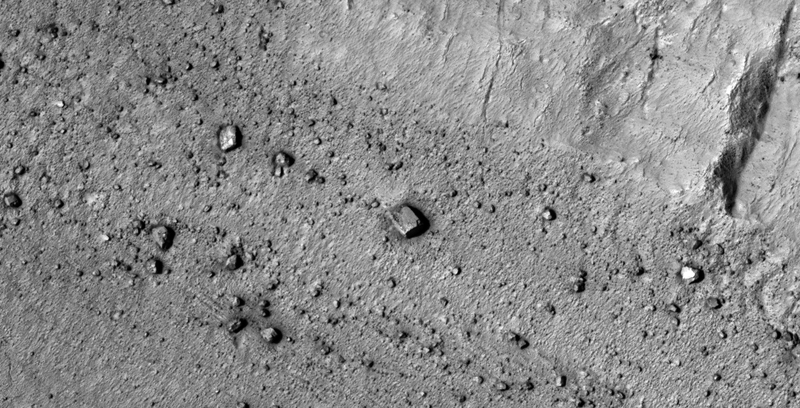 Many small objects are scattered throughout this photograph. 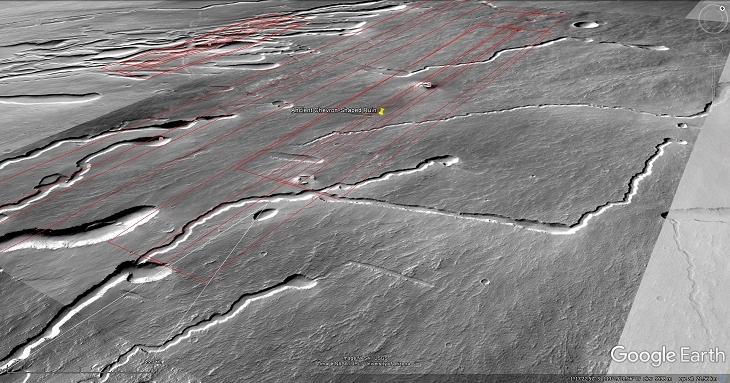 The objects, which may be artificial debris from some kind of technology, measure between 5 metres and 10 metres across. 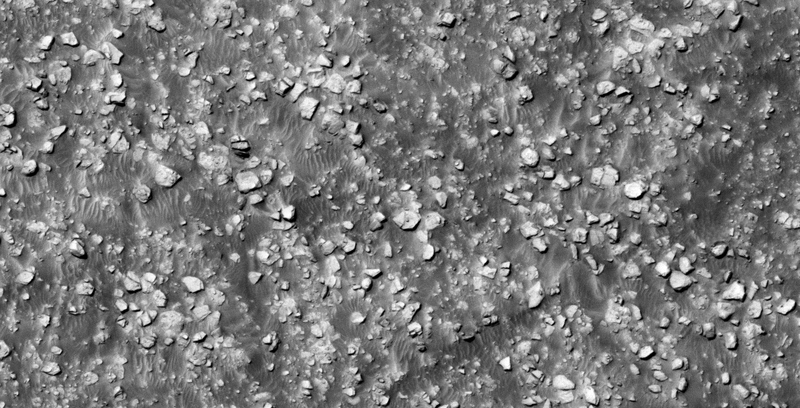 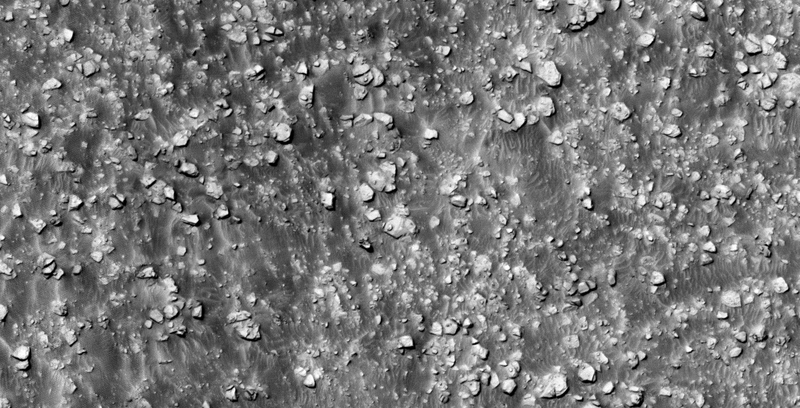 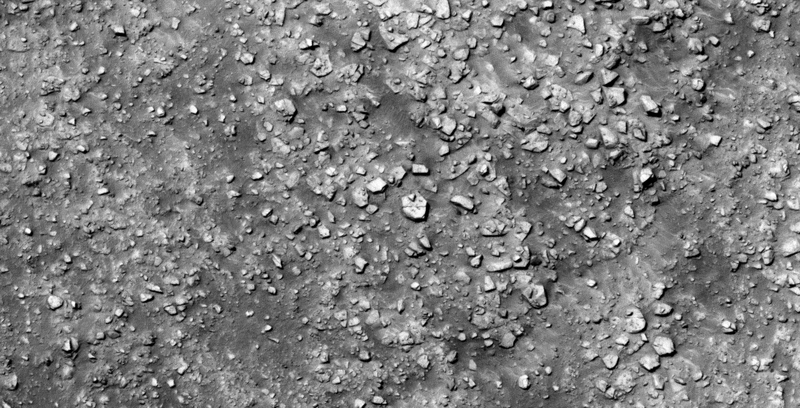 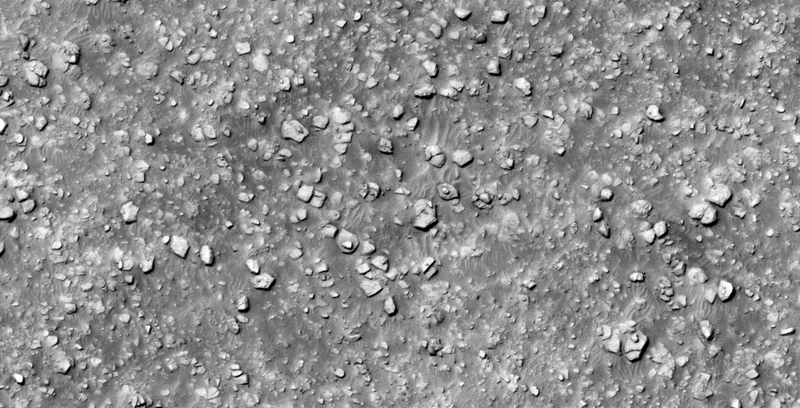 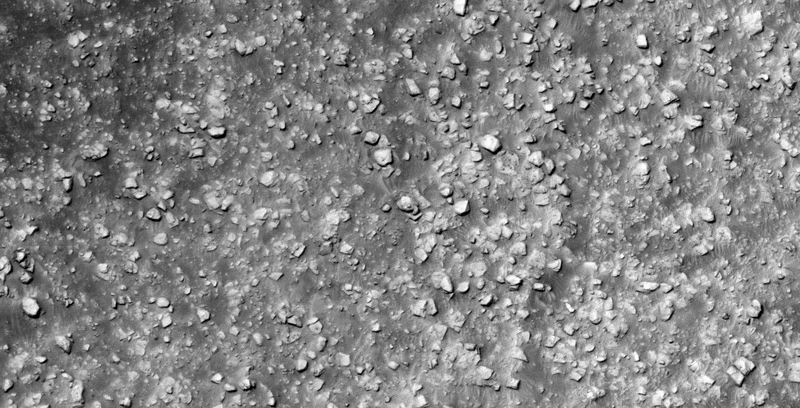 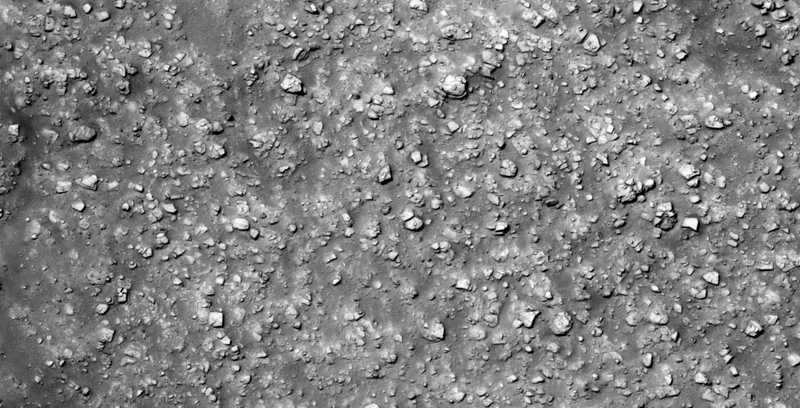 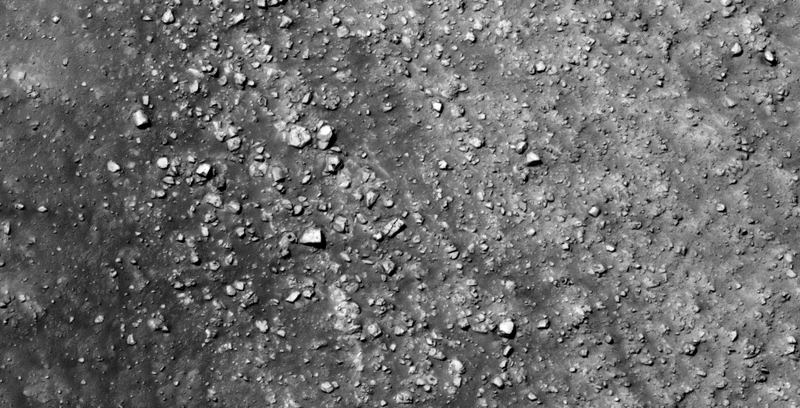 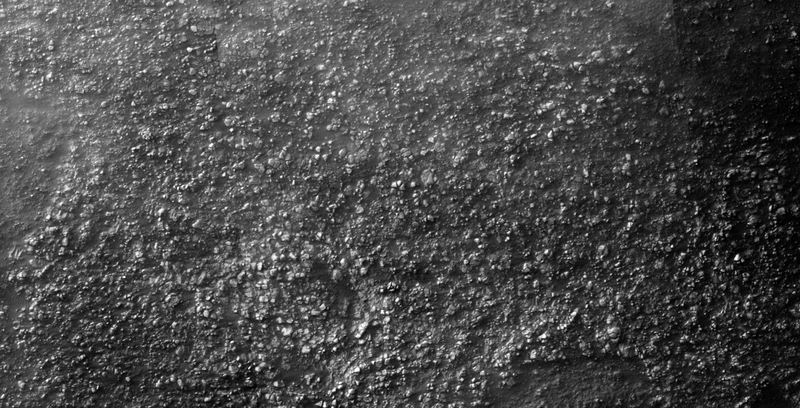 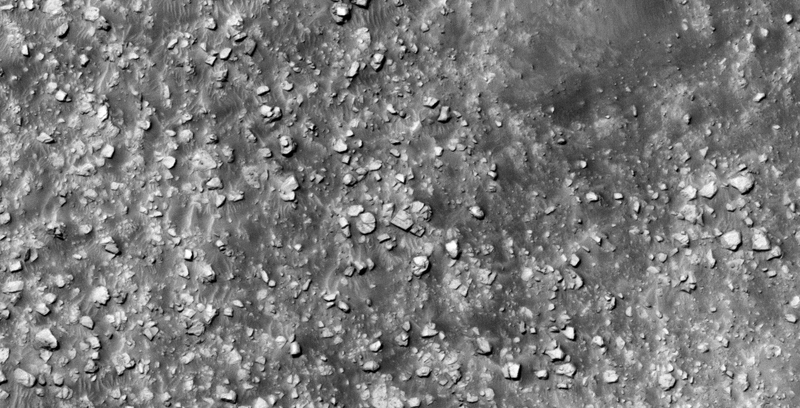 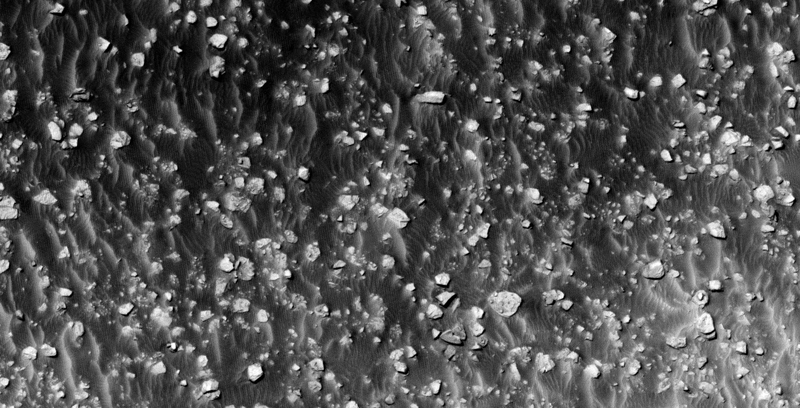 This photograph (PSP_008198_1425) was taken by NASA’s Mars Reconnaissance Orbiter (MRO) HiRISE Camera on 26 April 2008. 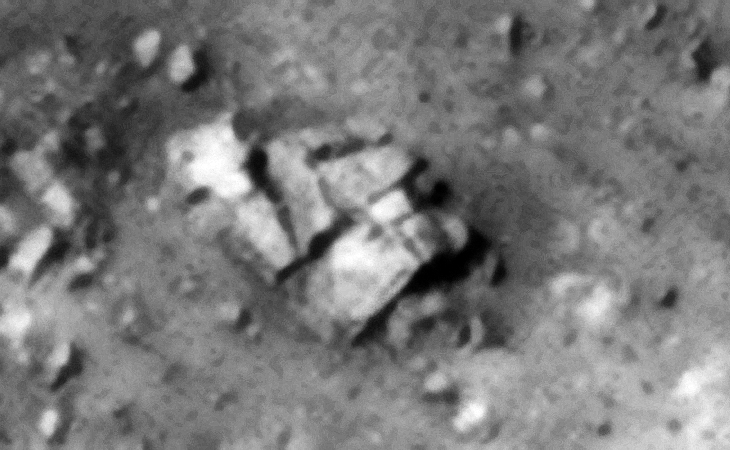 Discovered are what look like similar walls/structures built using large blocks as those found in Asimov Crater as well as multiple craft/machine/tech looking anomalies. 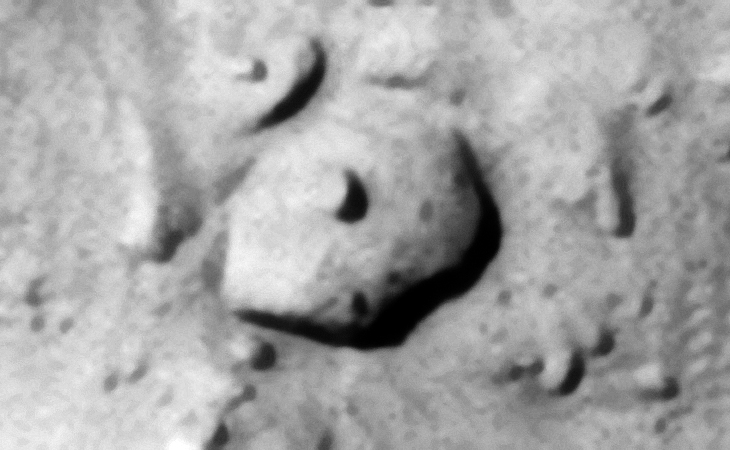 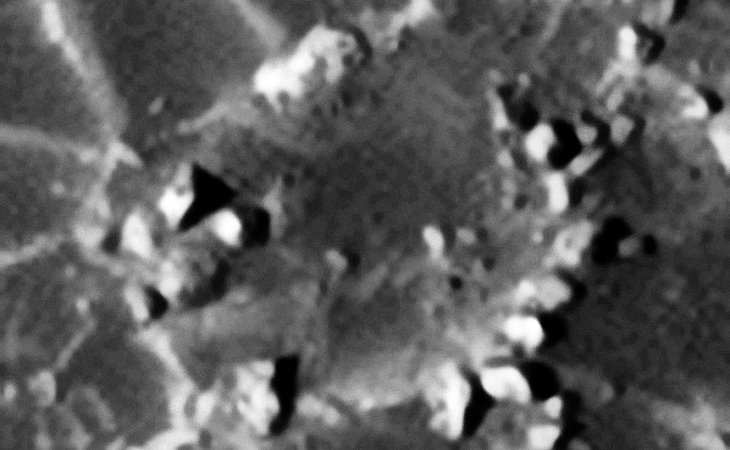 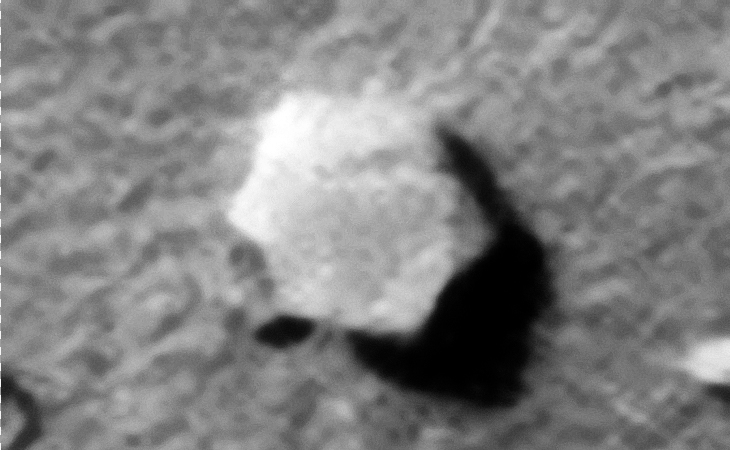 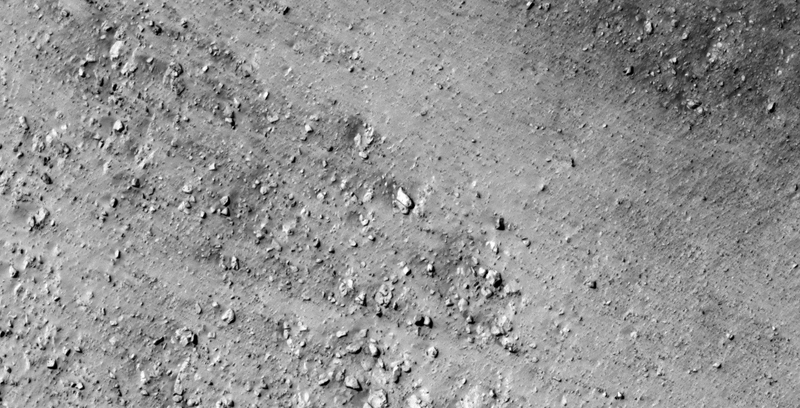 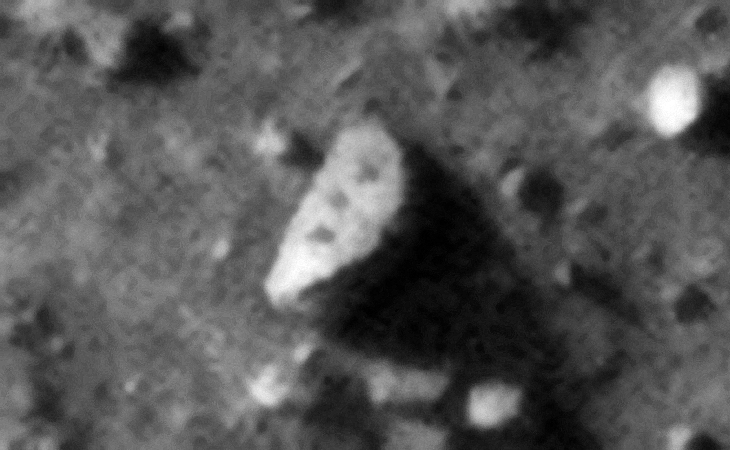 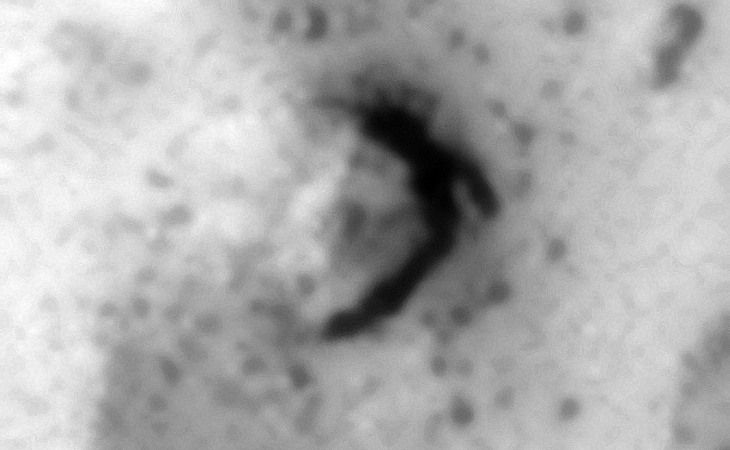 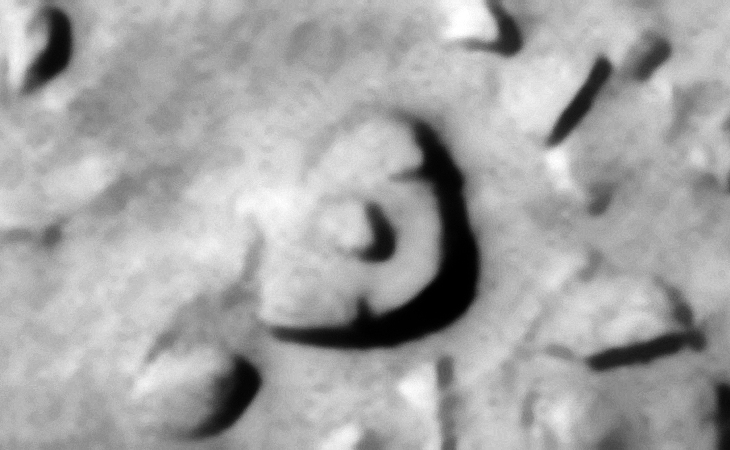 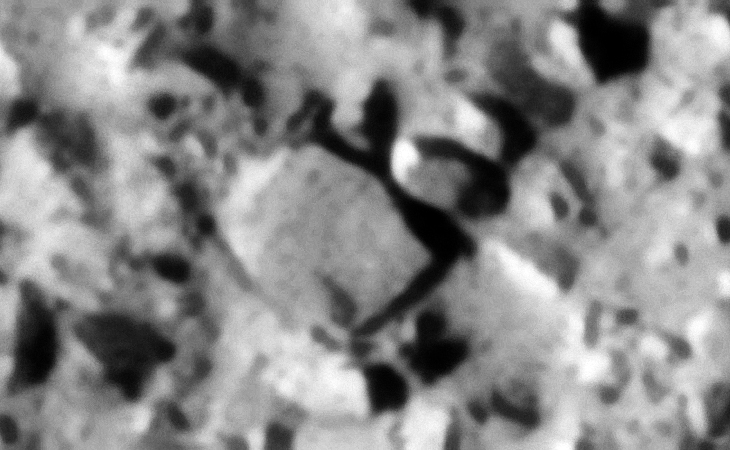 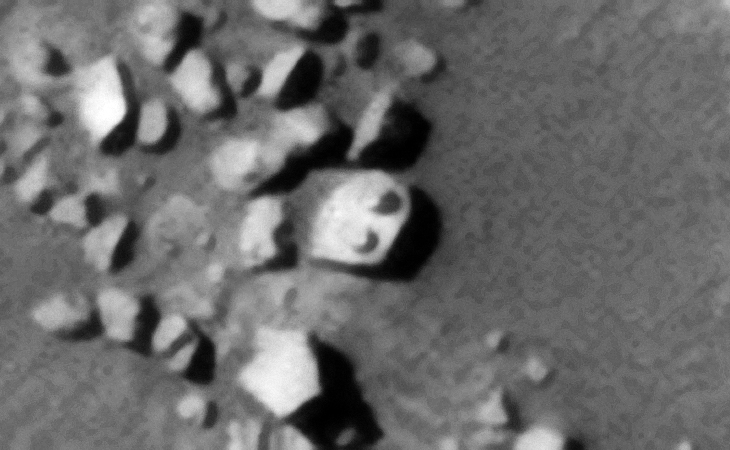 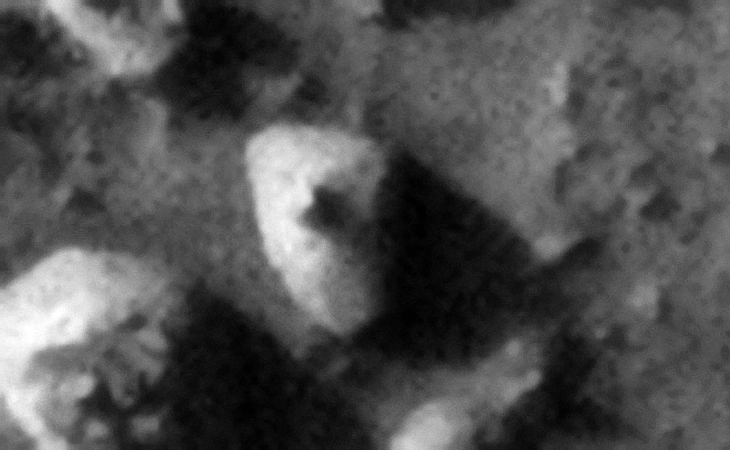 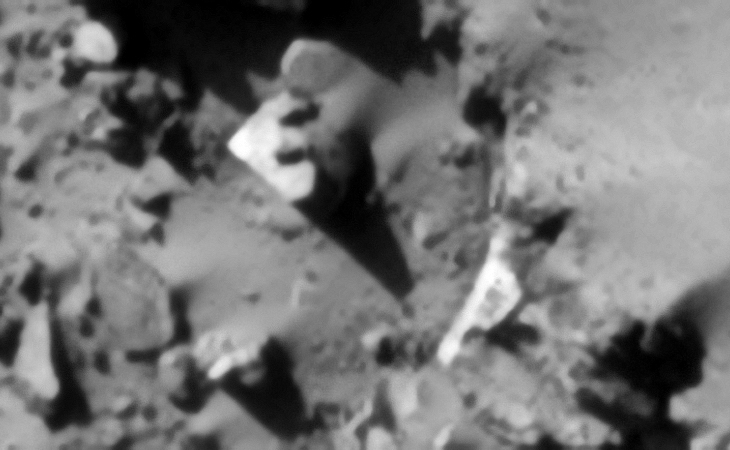 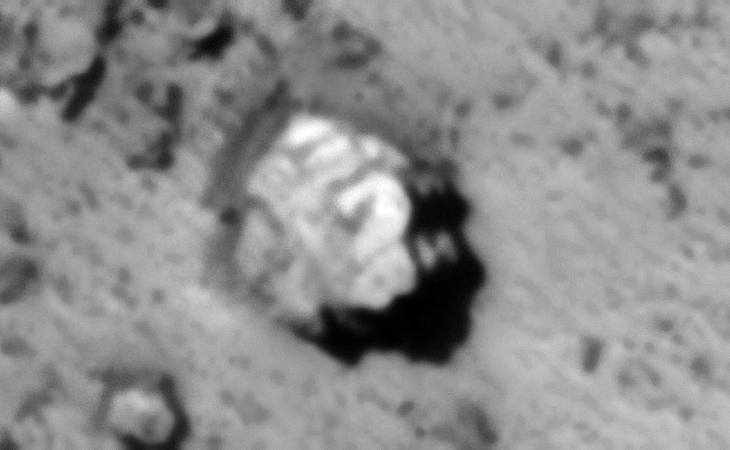 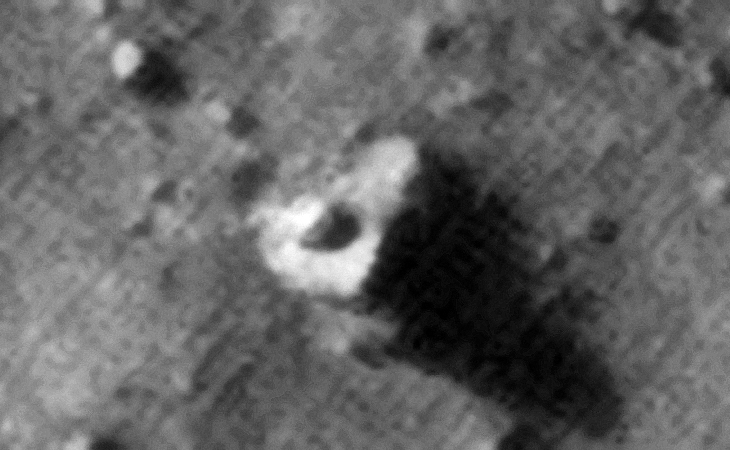 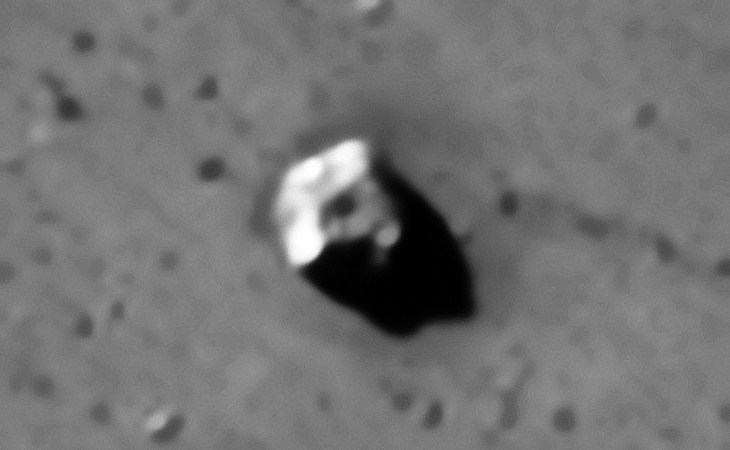 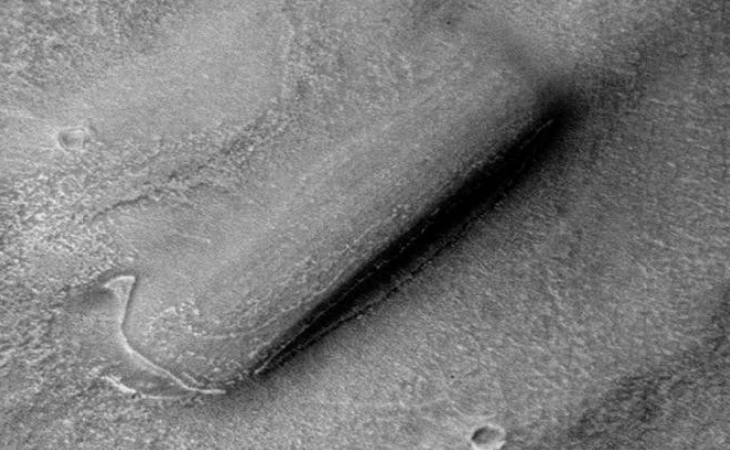 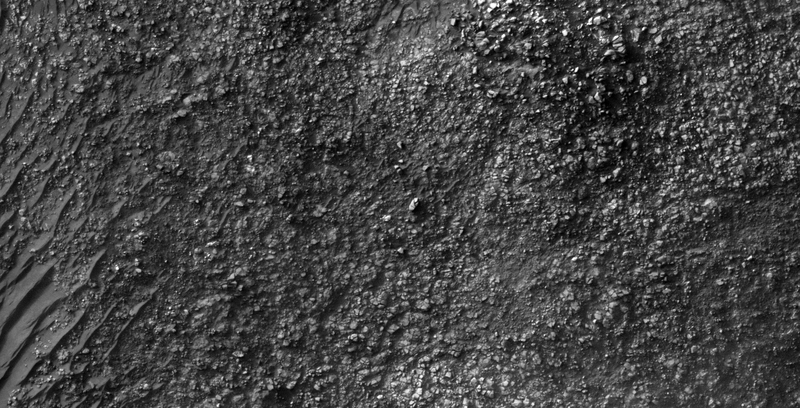 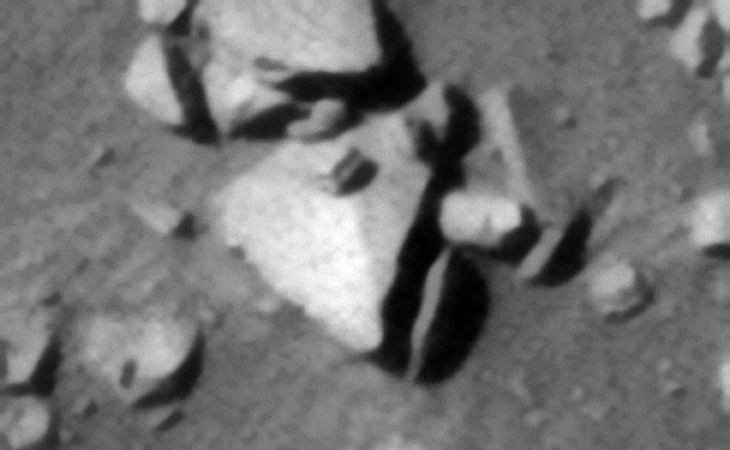 On the 13th of March 2018 I discovered what looks like a small, derelict classic UFO-type ‘craft’ on Mars in a HiRISE photograph (ESP_014166_1820) taken by NASA’s Mars Reconnaissance Orbiter (MRO) HiRISE Camera on 04 August 2009 and NASA describes this photograph as “Possible Layering in Block Material in Hydraotes Chaos.” It has a larger flat disc and a smaller oval dome on top and measures approximately 8 metres in diameter. 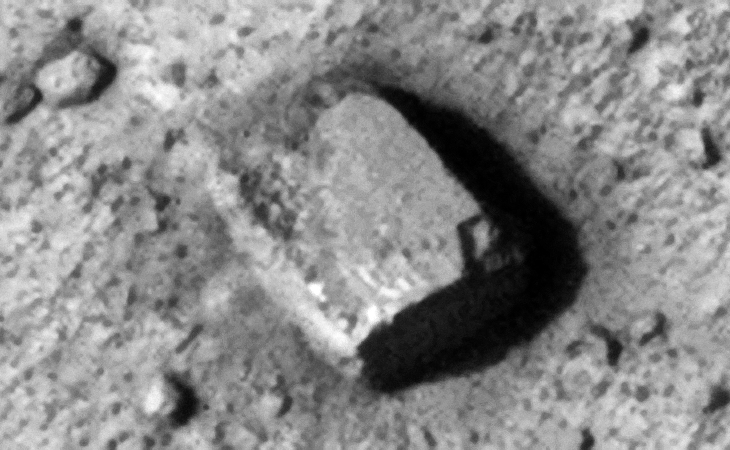 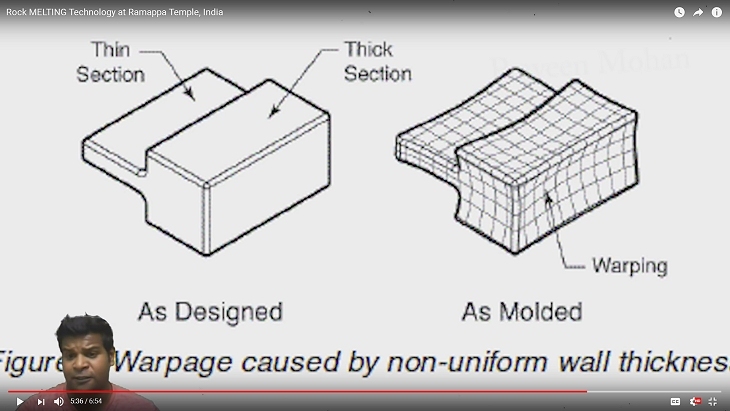 30) Were Megalithic Blocks with Knobs Manufactured on Mars? 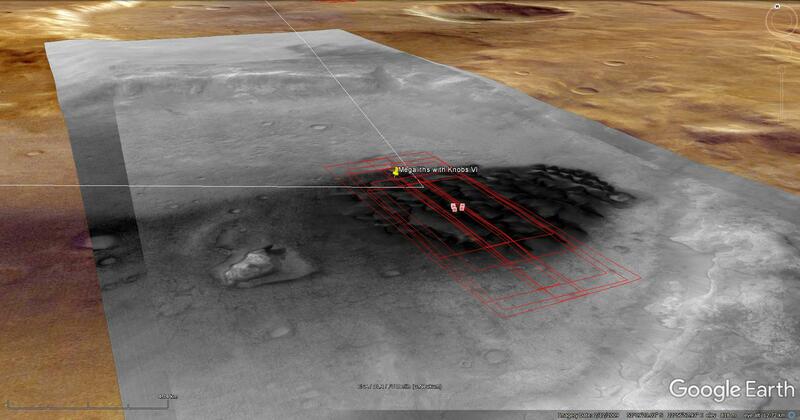 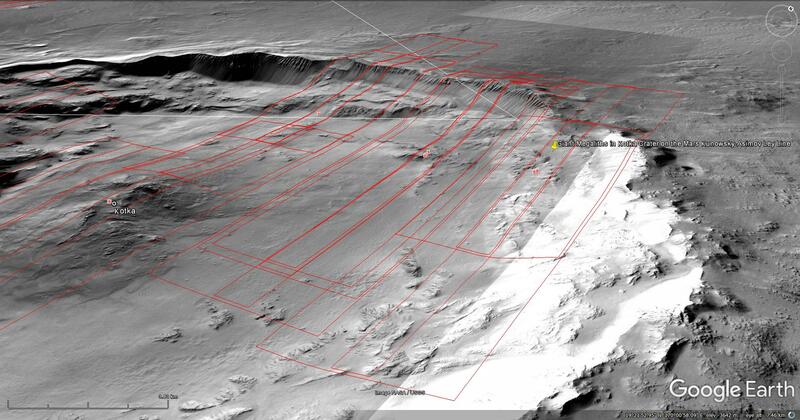 31) More Megalithic Ruins Found on Mars? 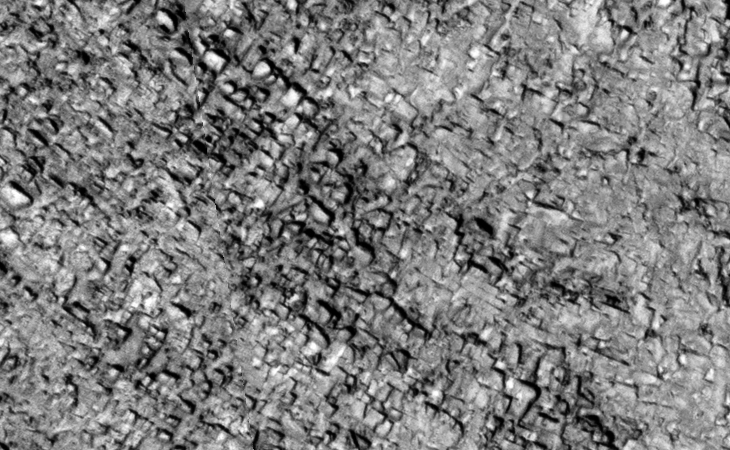 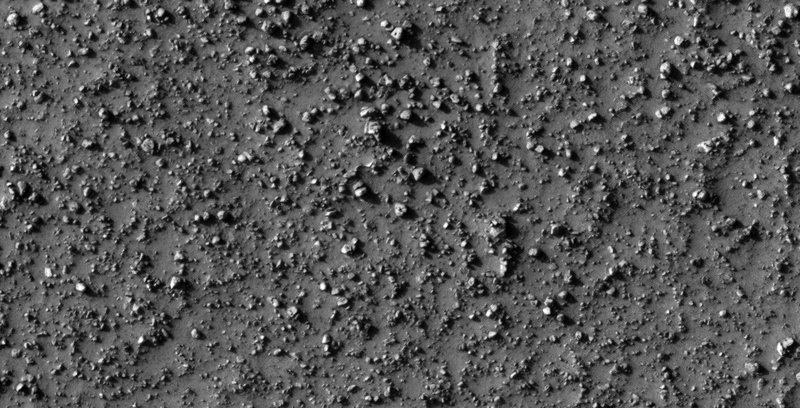 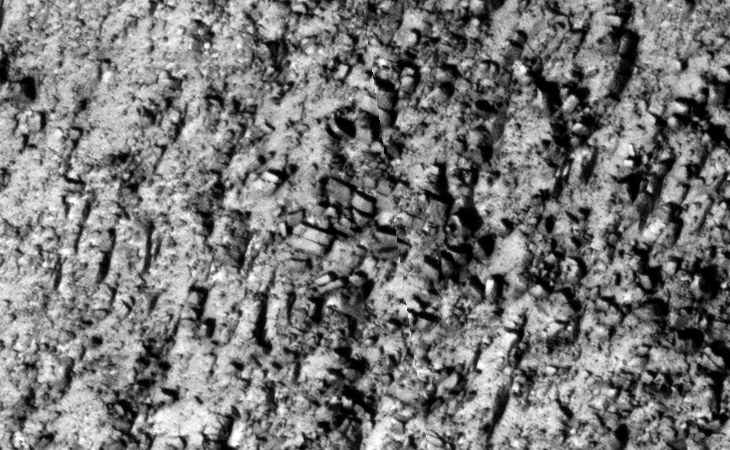 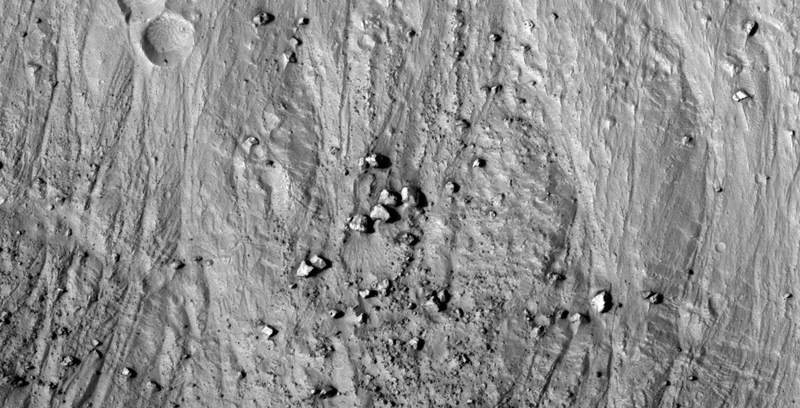 I discovered another vast terrain on Mars littered with what look like megalithic blocks with knobs. 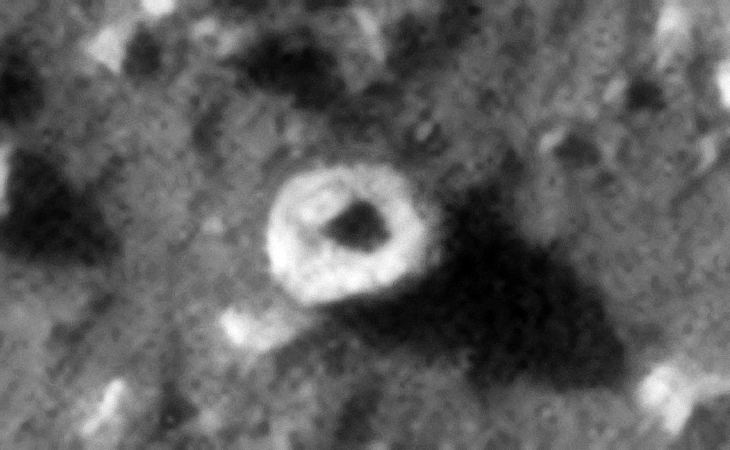 Due to the vast number I speculate that ancient buildings/structures were built here and that some devastating event destroyed them in the distant past. 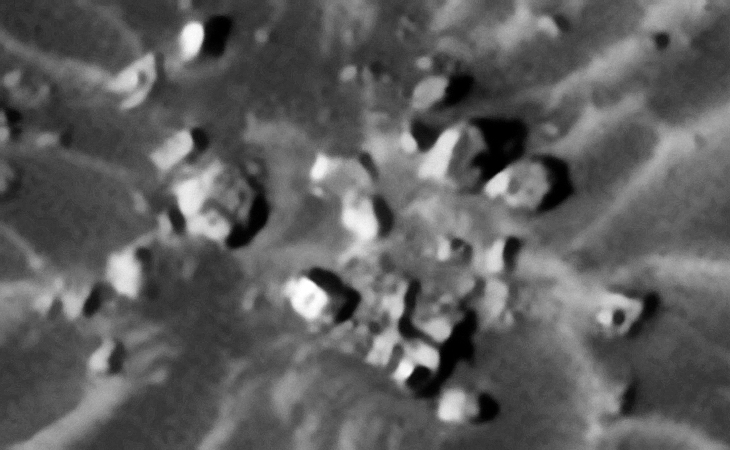 Megalithic ruins such as these and those featured in my previous Blog Post’s and YouTube video’s seem to indicate this was the preferred building style of the ancient civilization/s that once thrived on Mars. 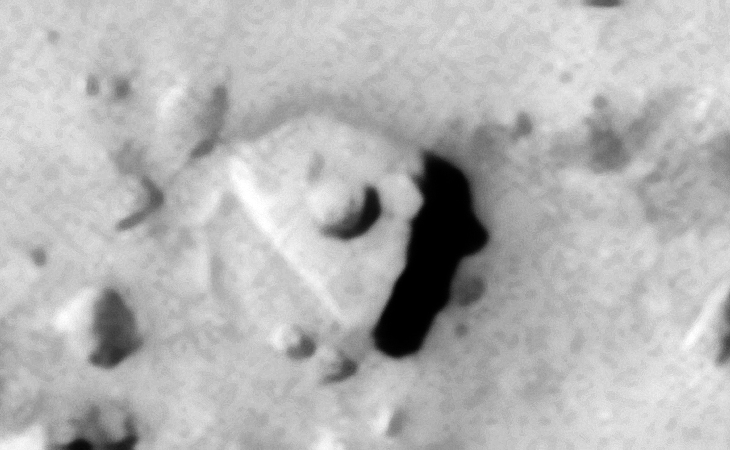 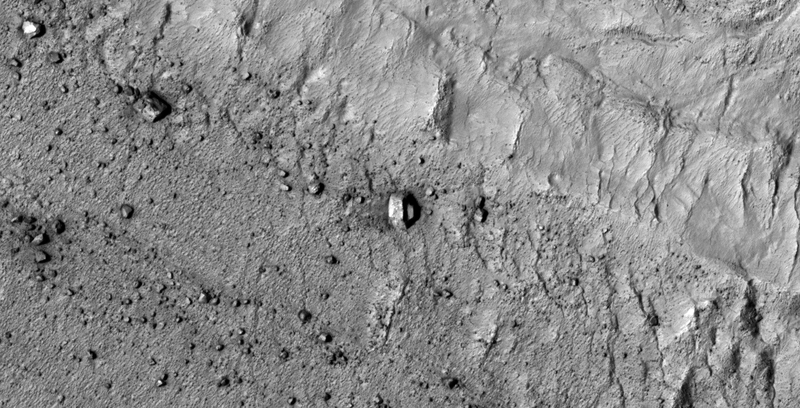 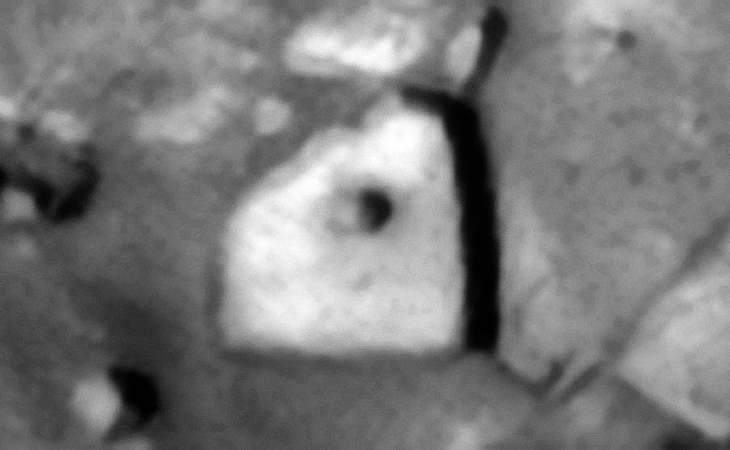 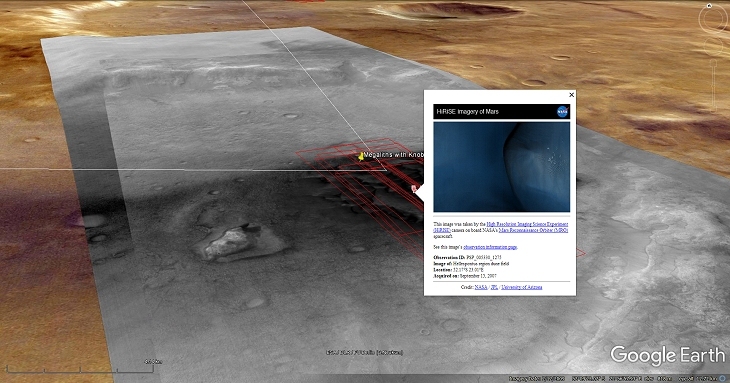 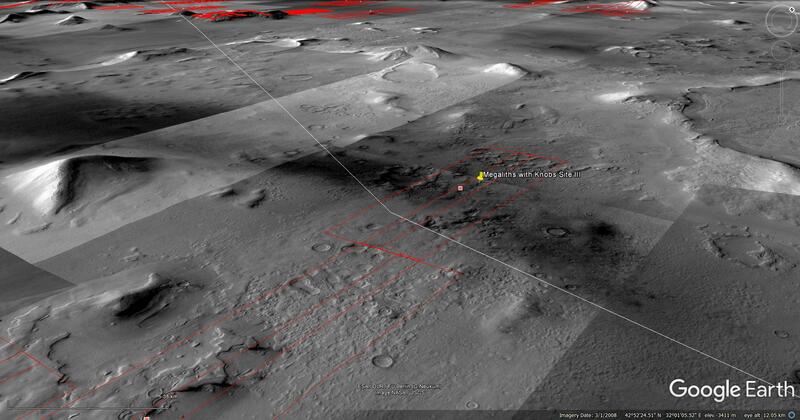 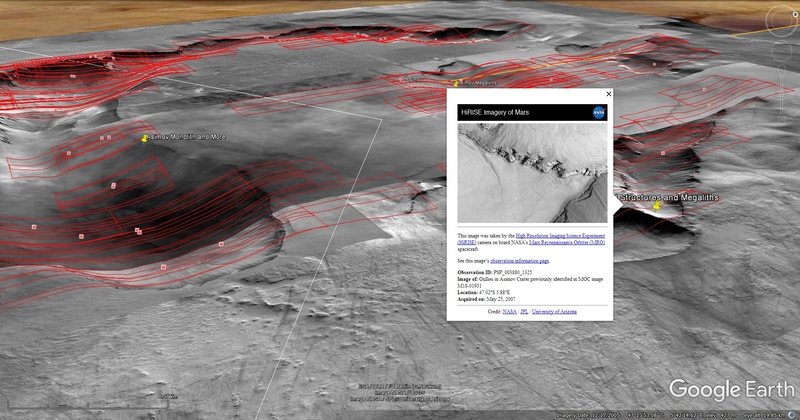 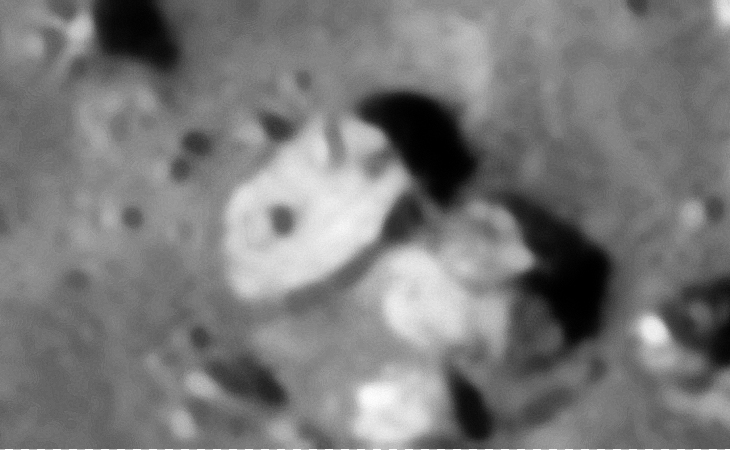 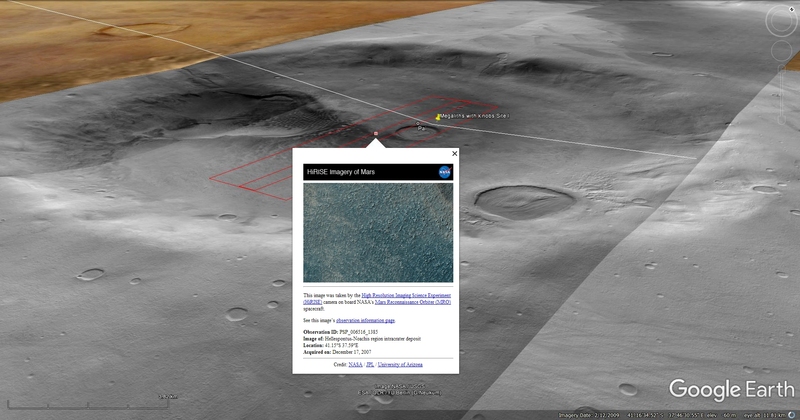 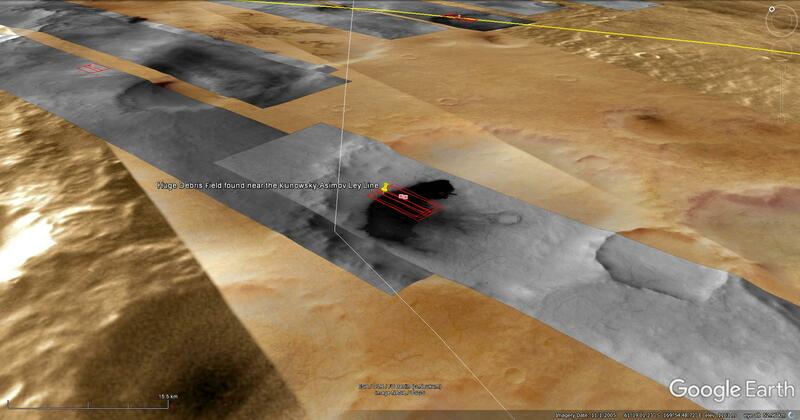 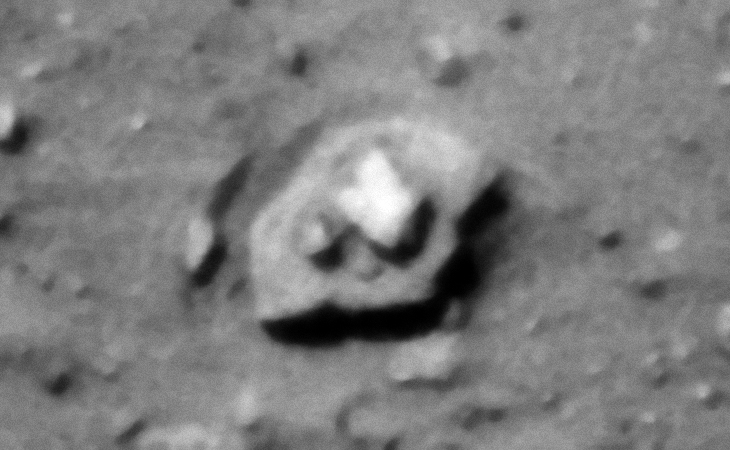 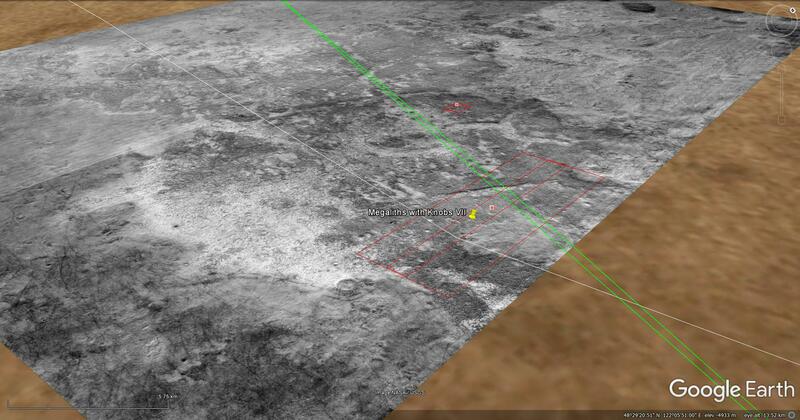 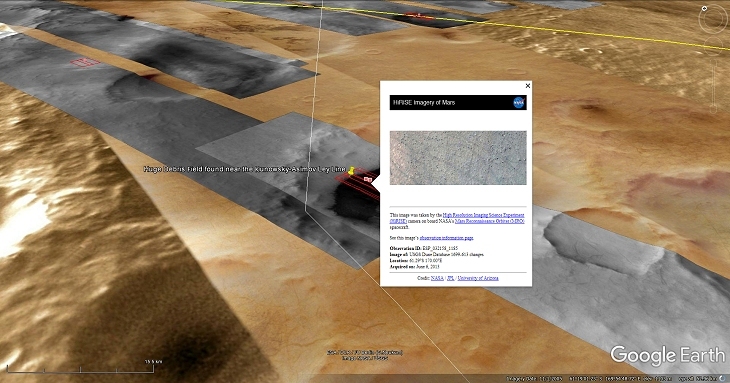 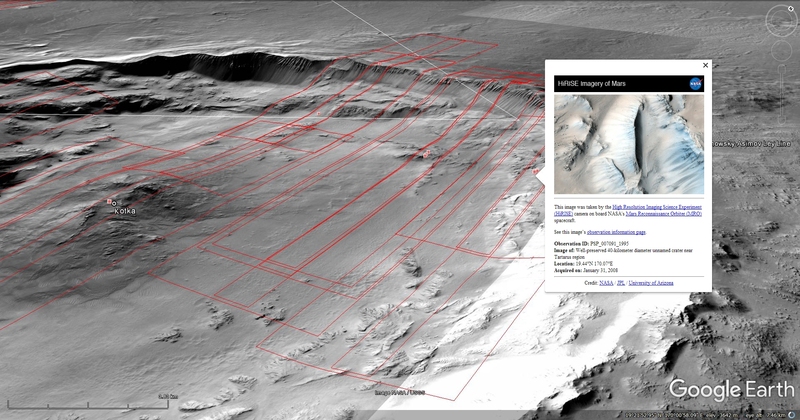 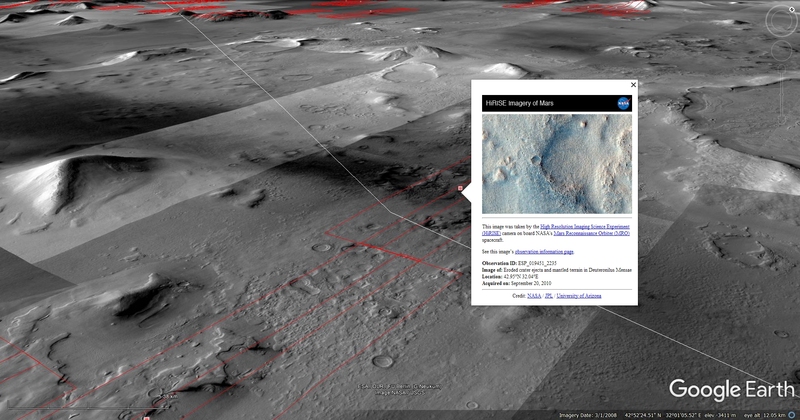 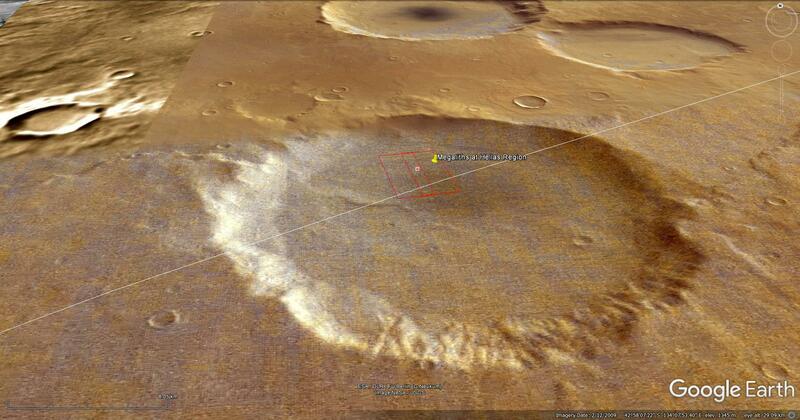 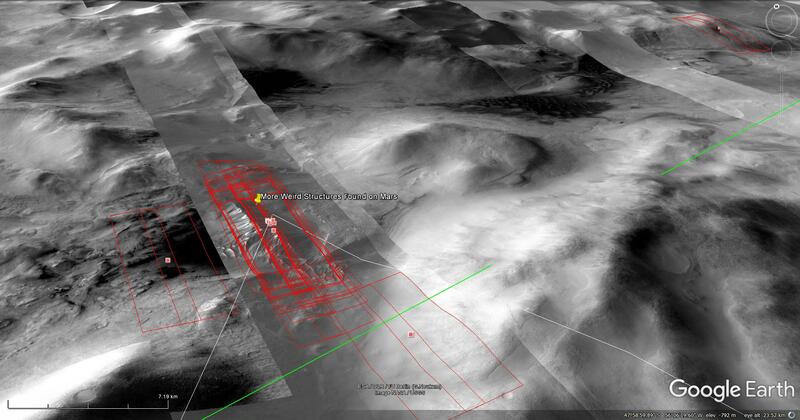 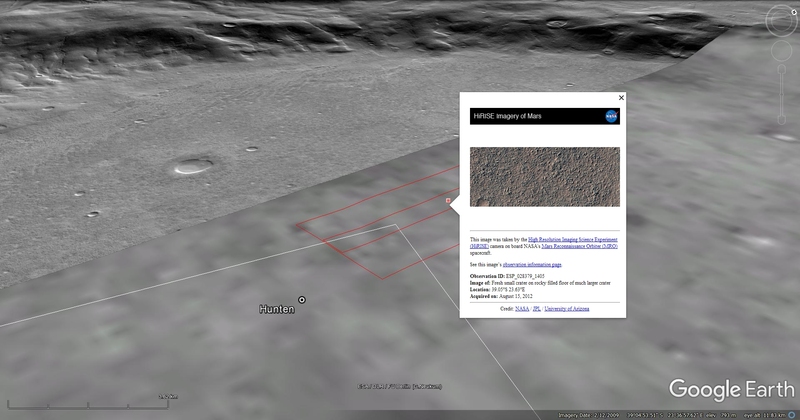 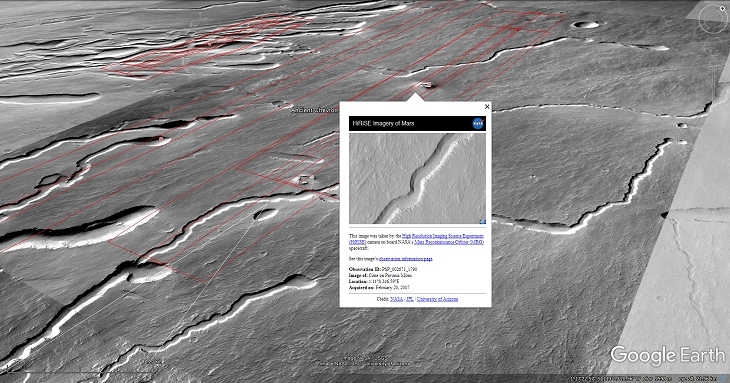 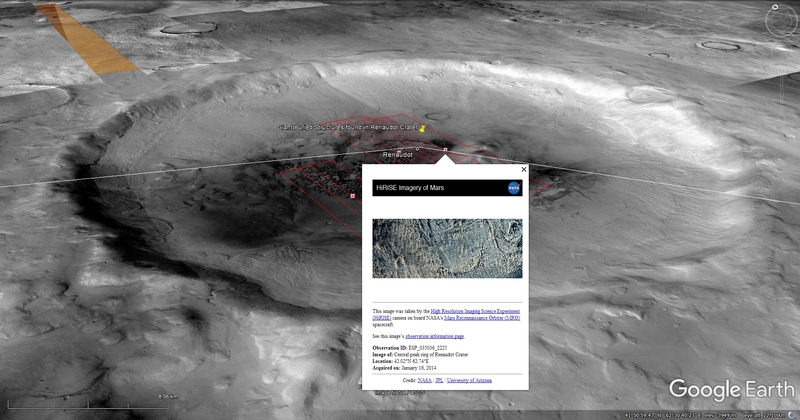 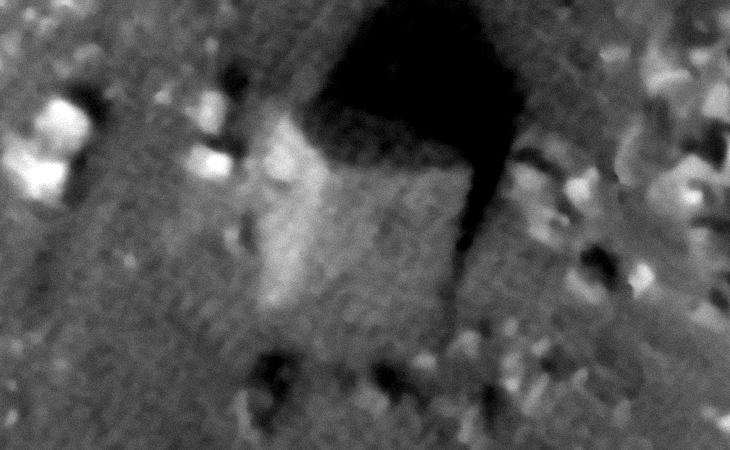 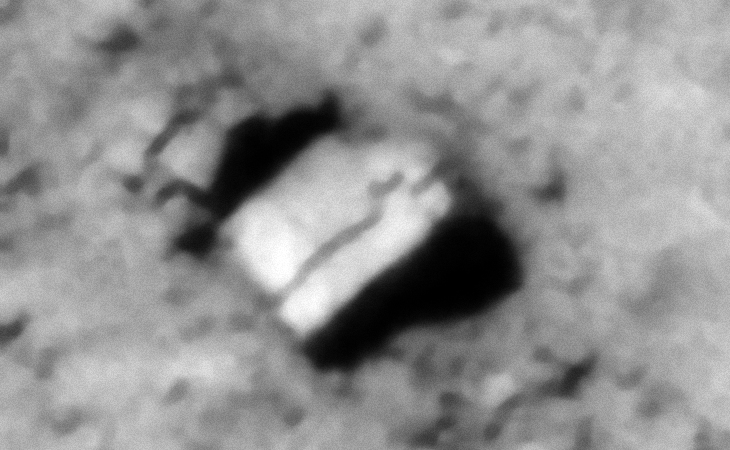 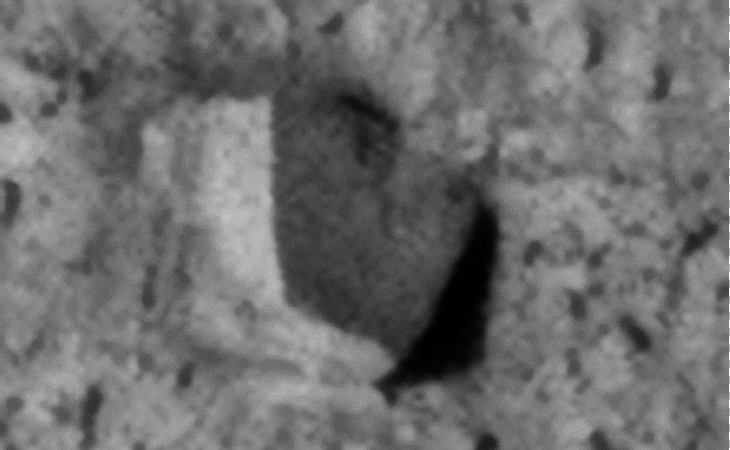 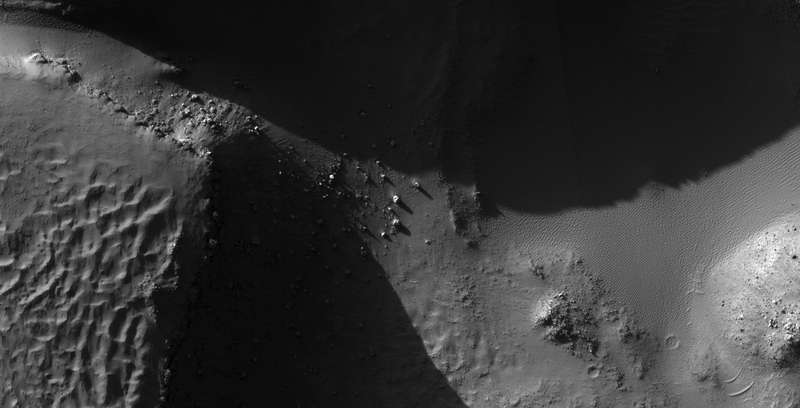 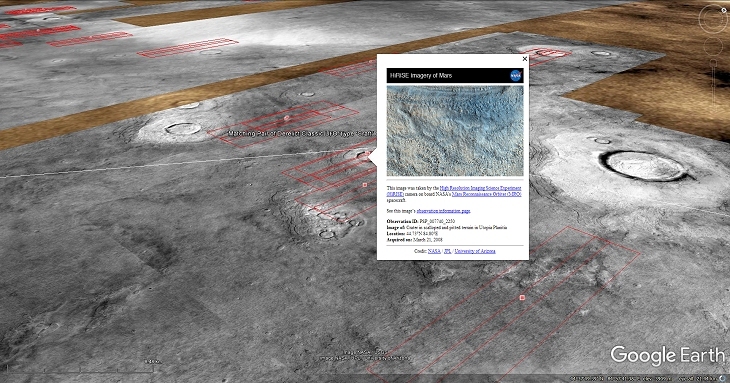 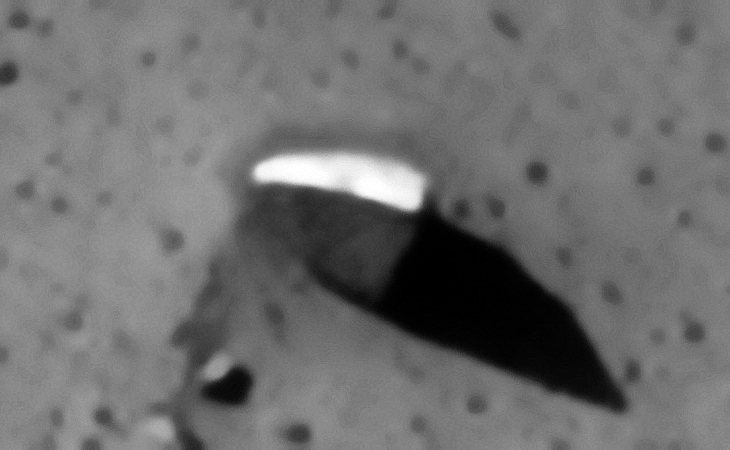 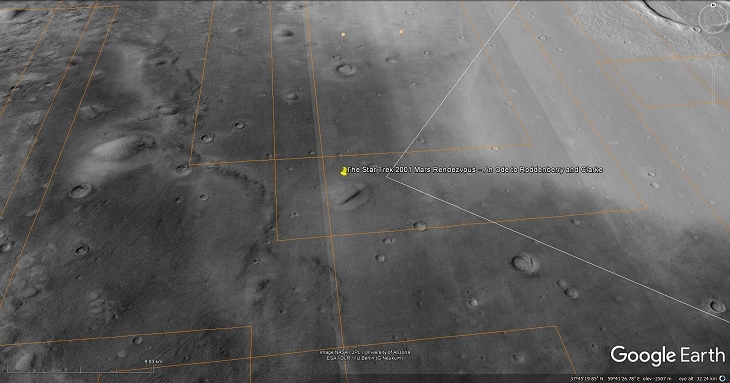 I discovered what looks like another partially buried, large megalithic-block on Mars (approximately 8 metres wide). 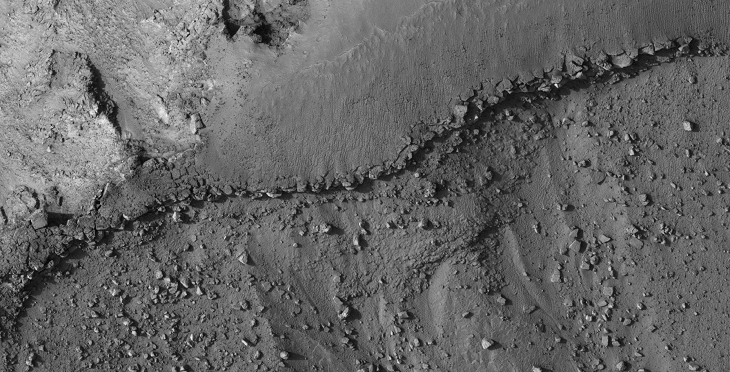 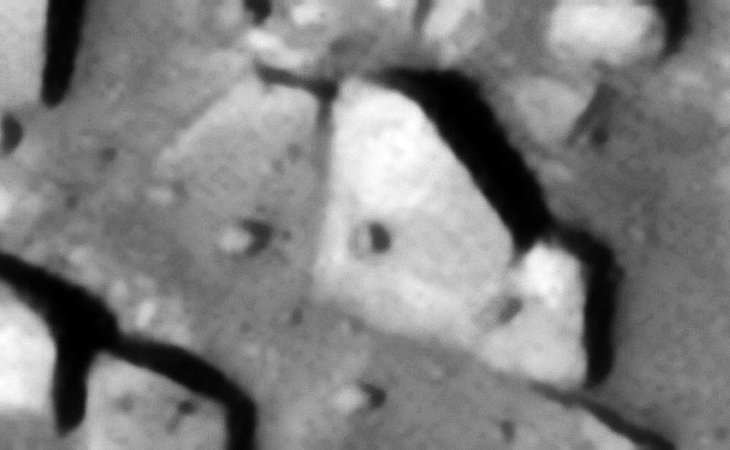 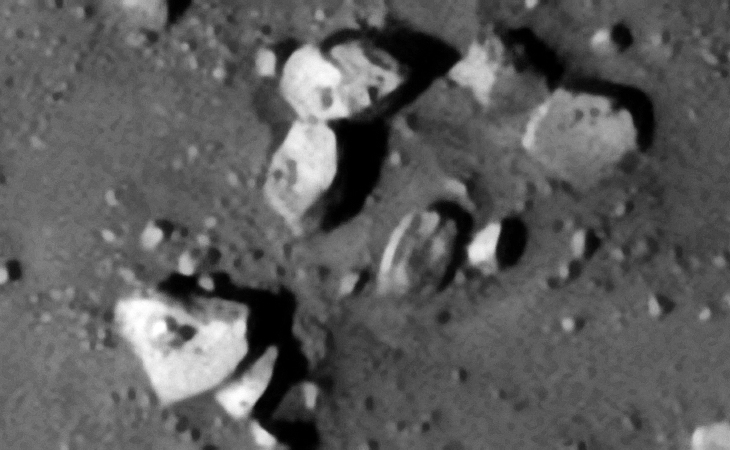 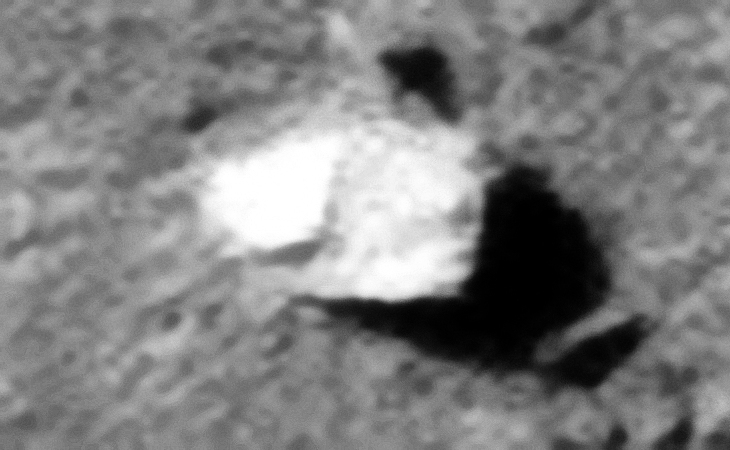 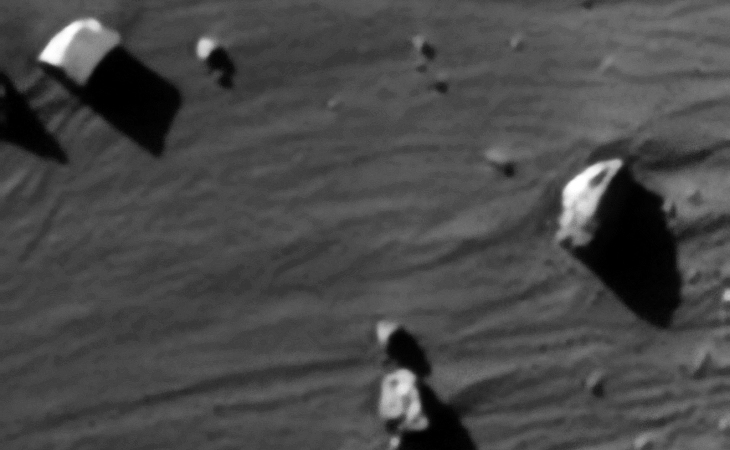 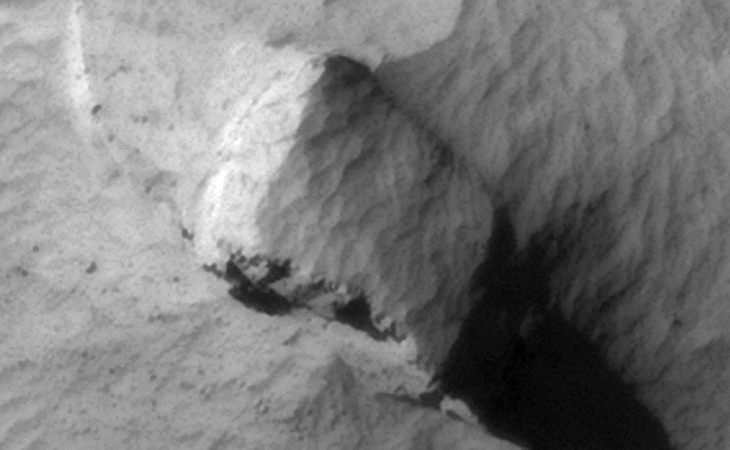 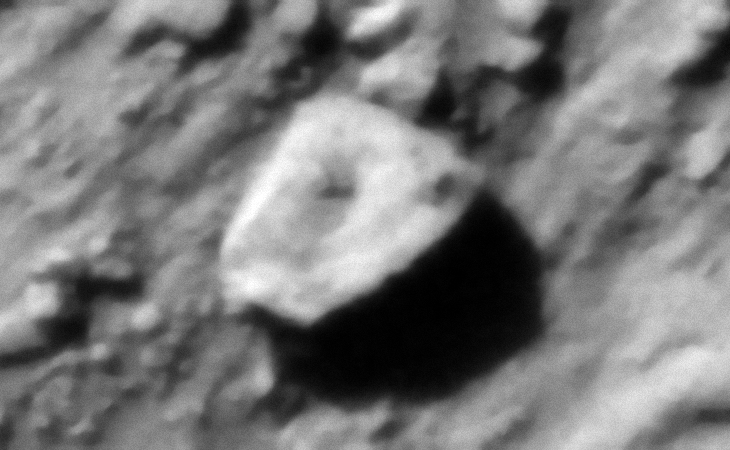 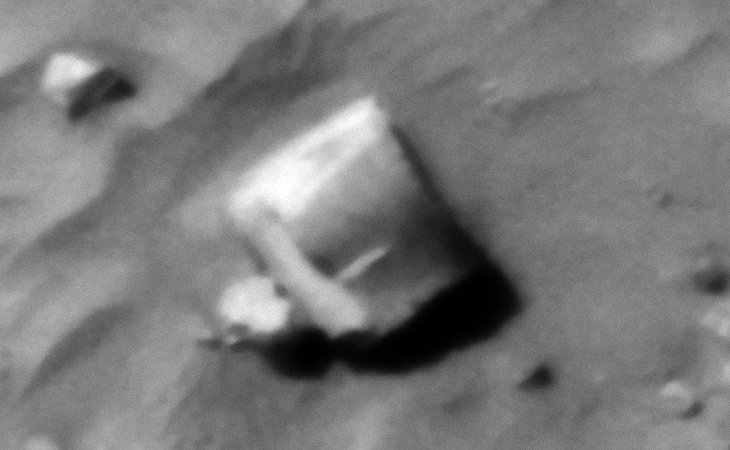 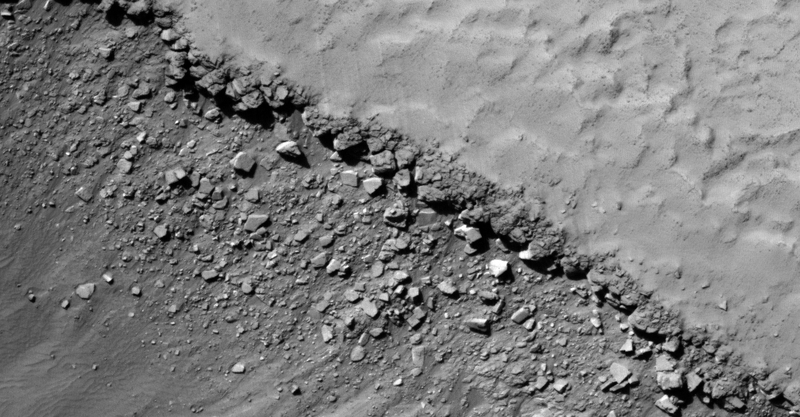 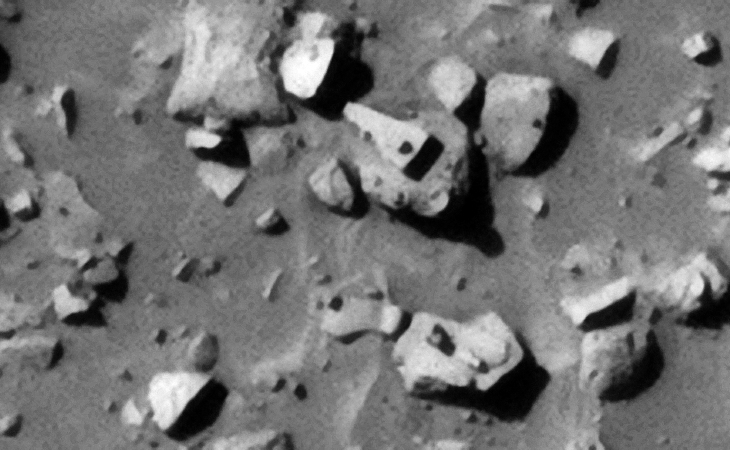 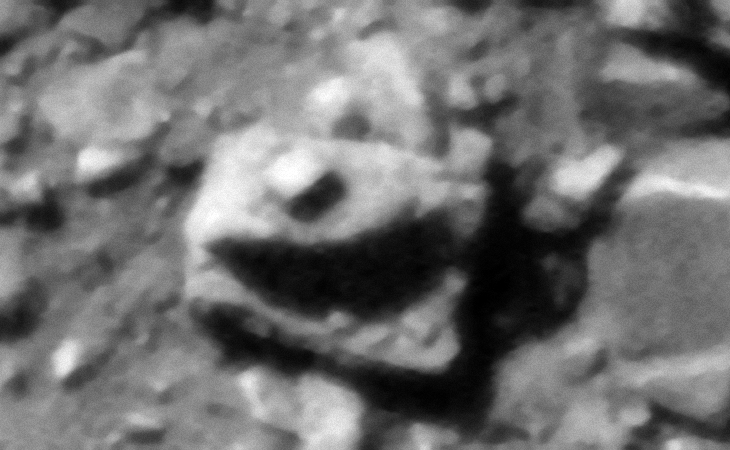 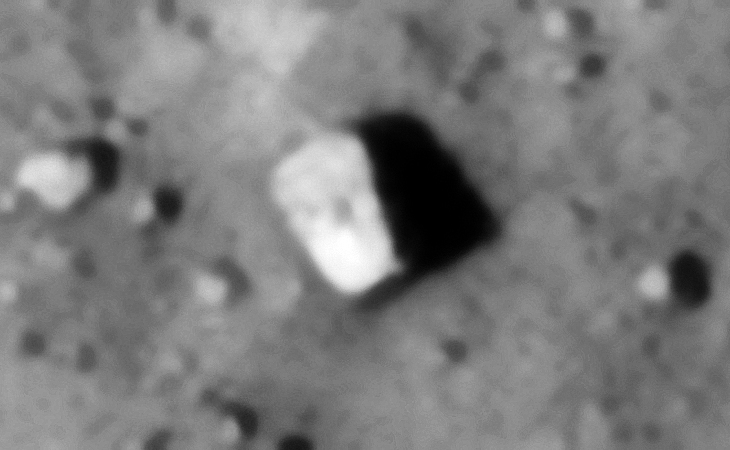 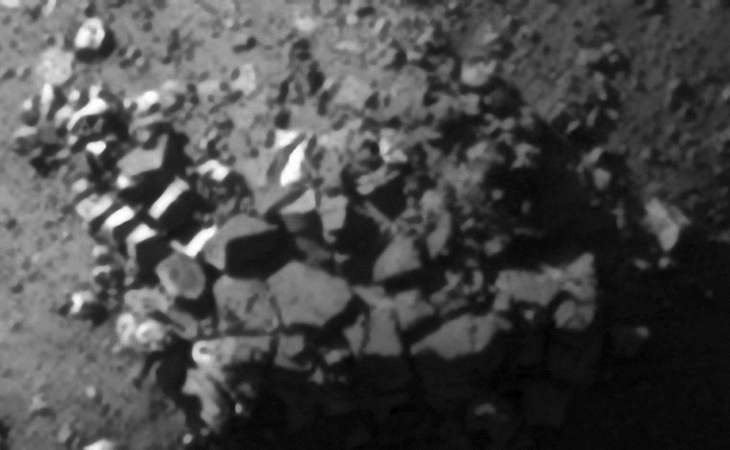 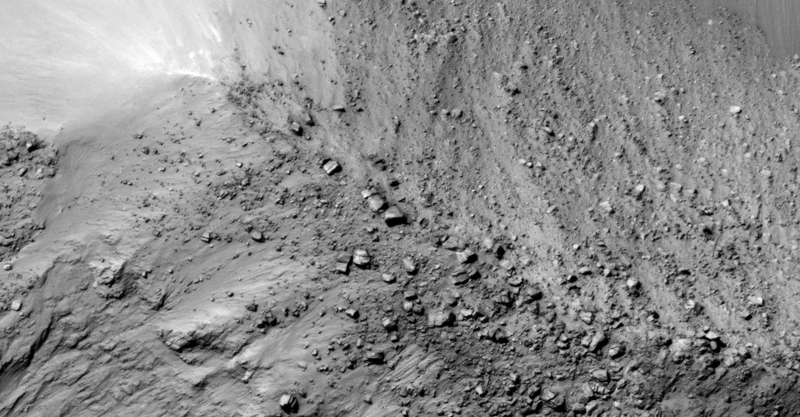 I further speculate that this block was part of a retaining wall similar to those found in Asimov Crater. 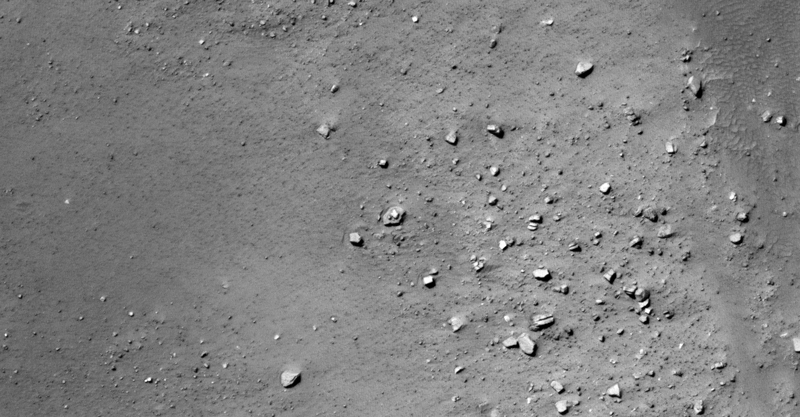 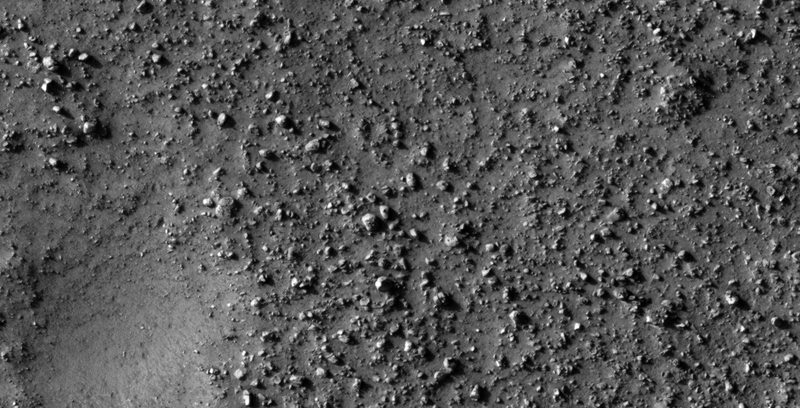 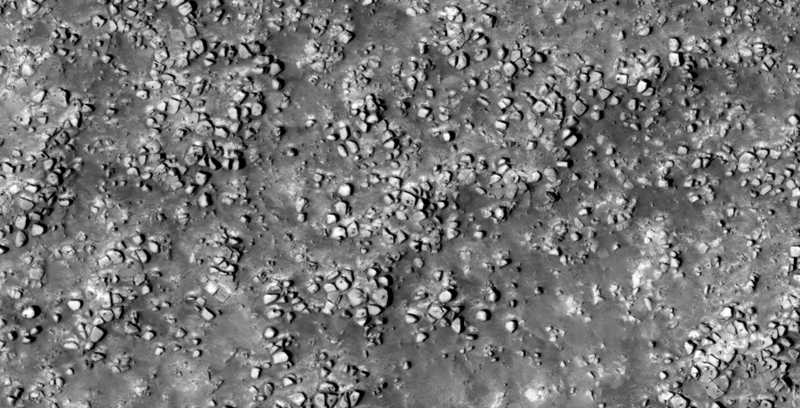 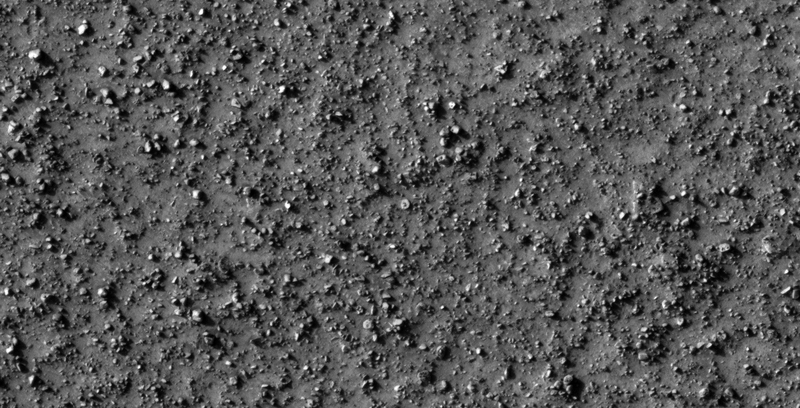 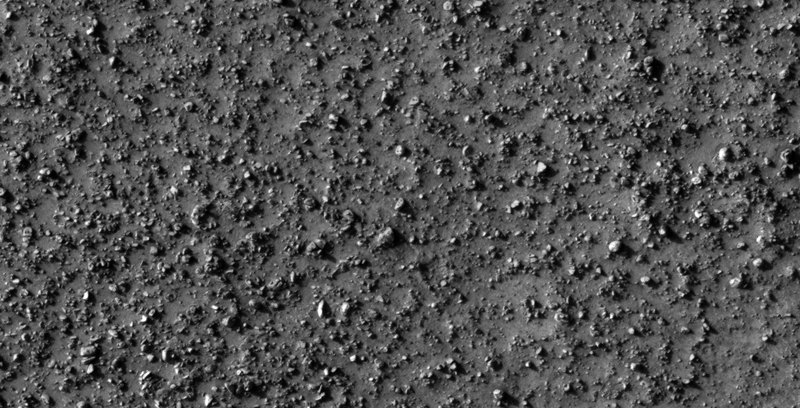 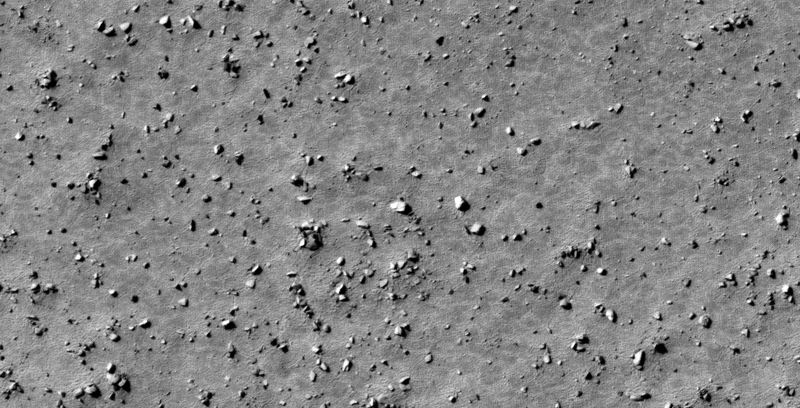 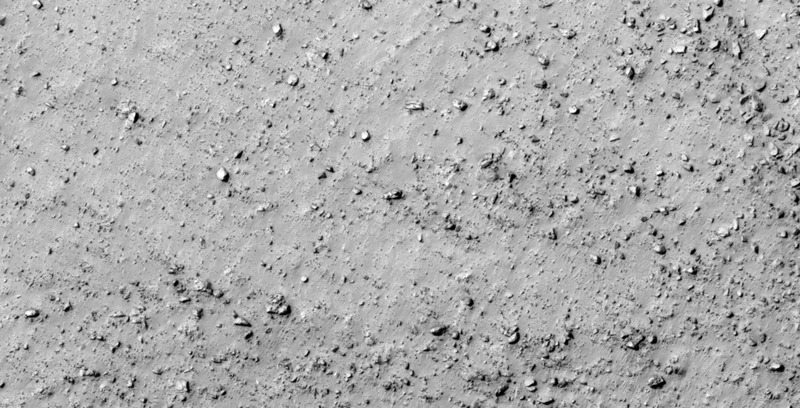 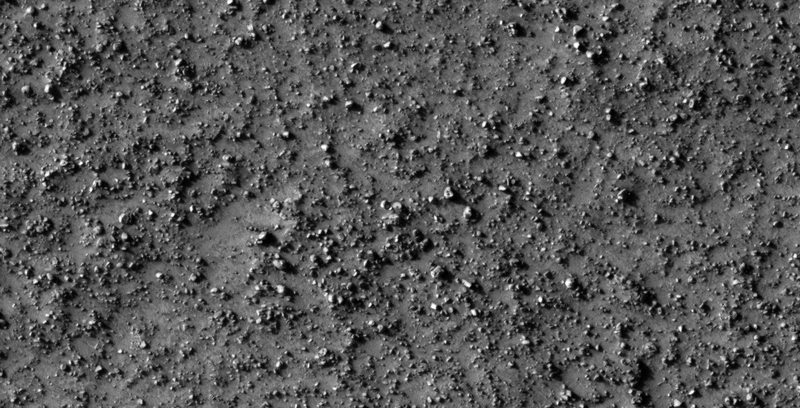 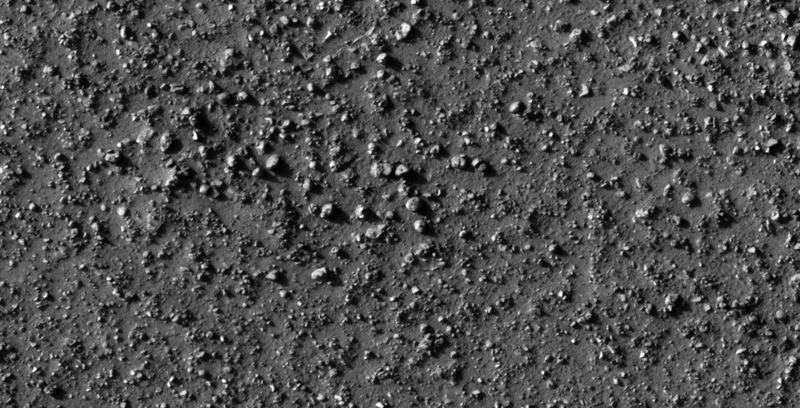 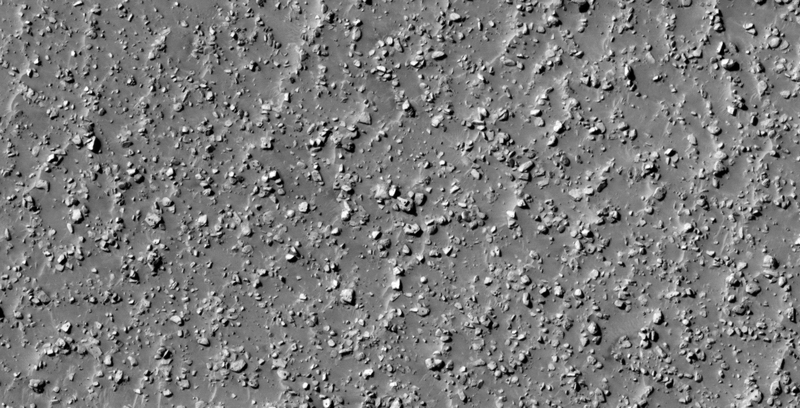 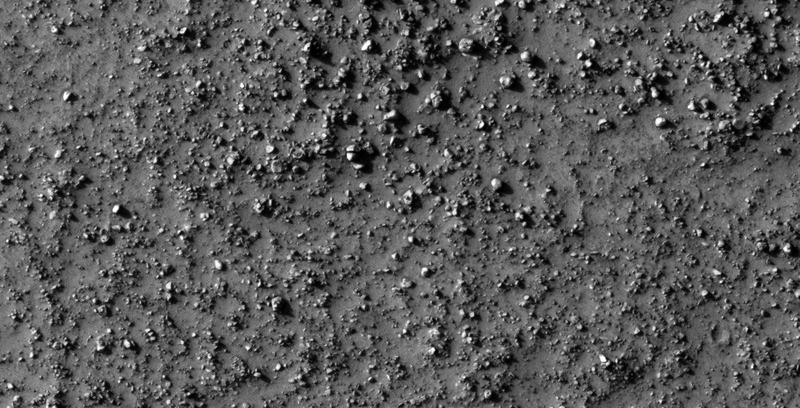 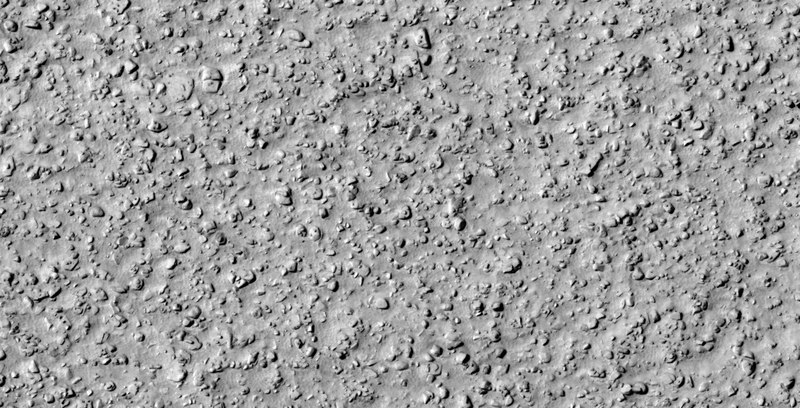 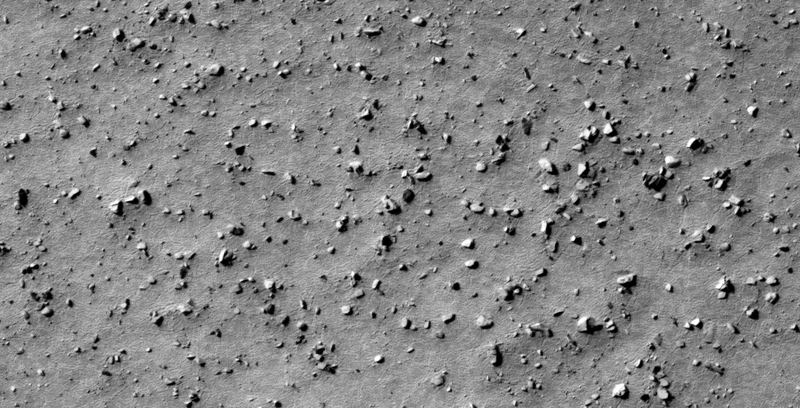 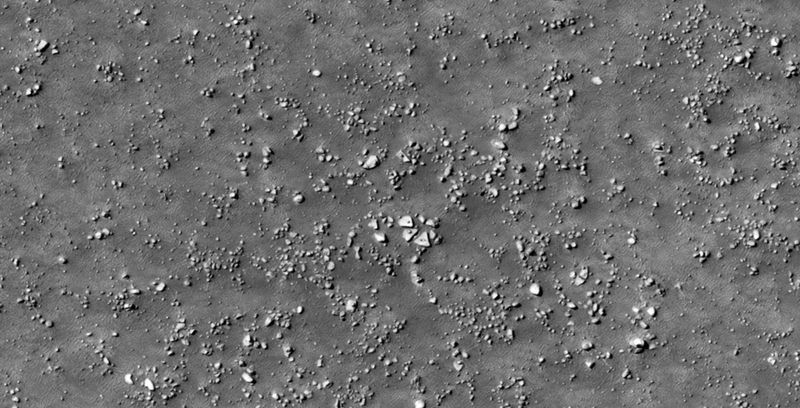 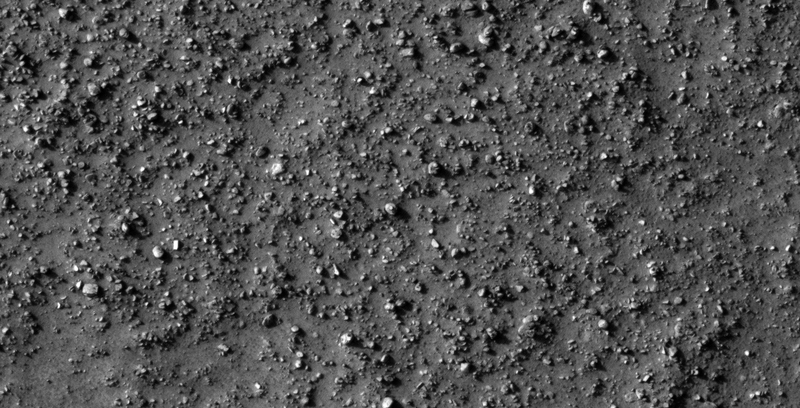 I discovered what looks like another large debris field on Mars. 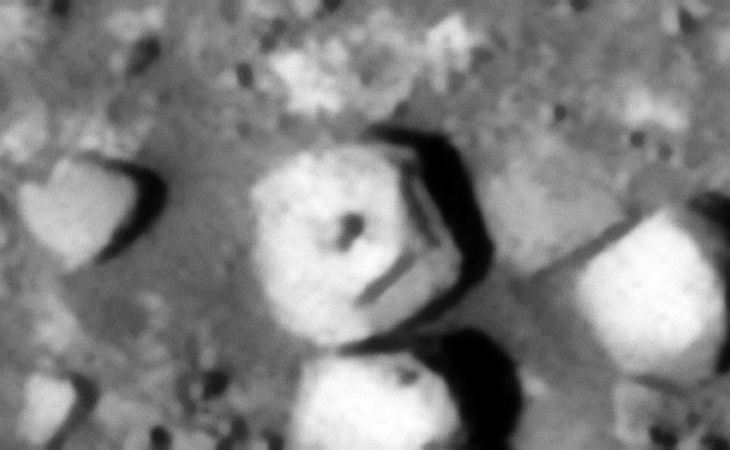 Seen are more megalithic blocks with knobs, disc-shaped objects with small domes on top and wreckage of machinery or technology. 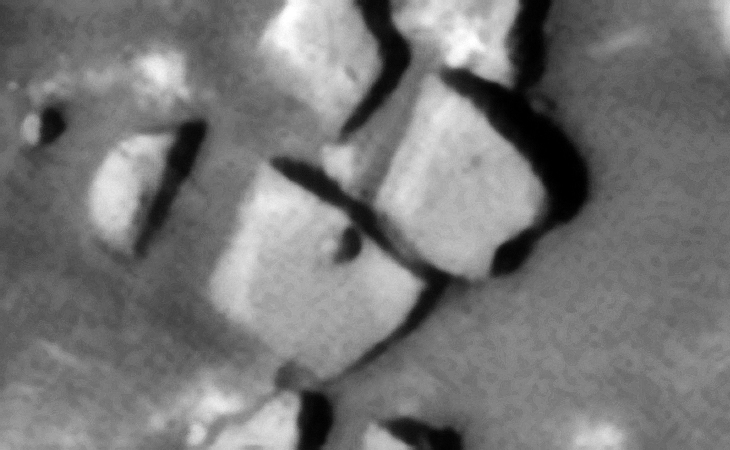 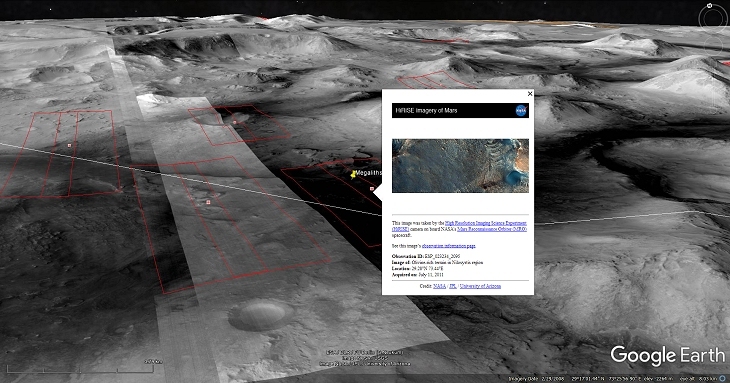 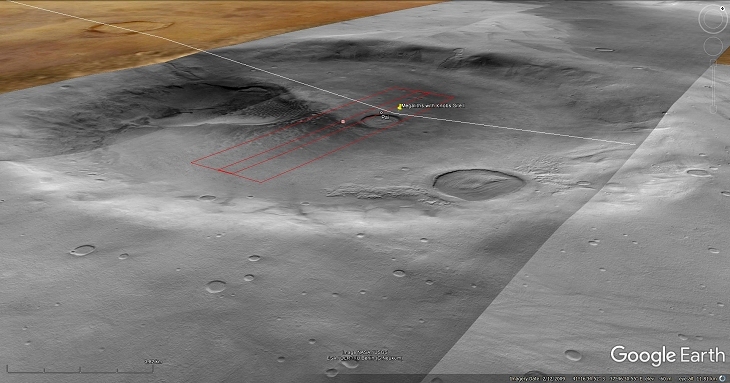 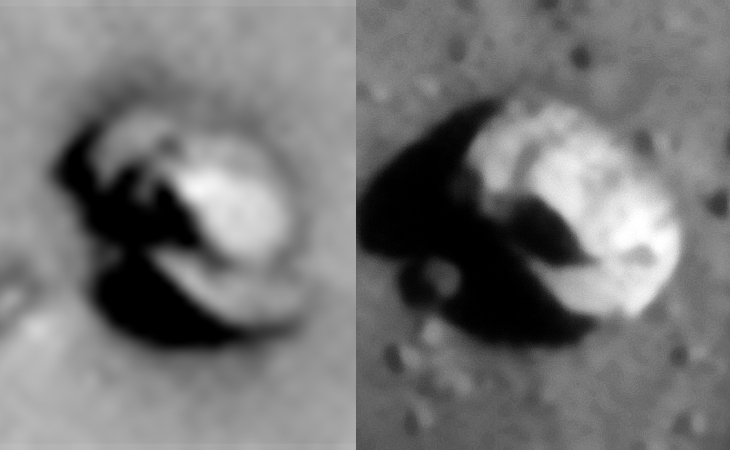 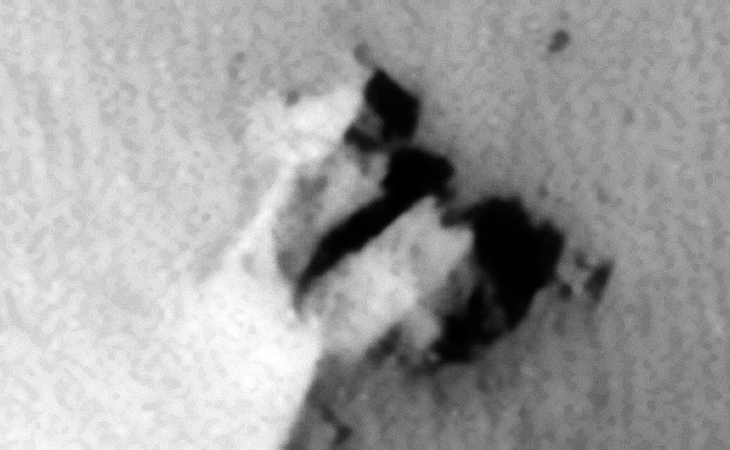 The photographs analyzed here (B05_011413_1790_XN_01S113W and PSP_002671_1790) were taken by NASA’s Mars Reconnaissance Orbiter on 01 January 2009 and 20 February 2007 respectively. 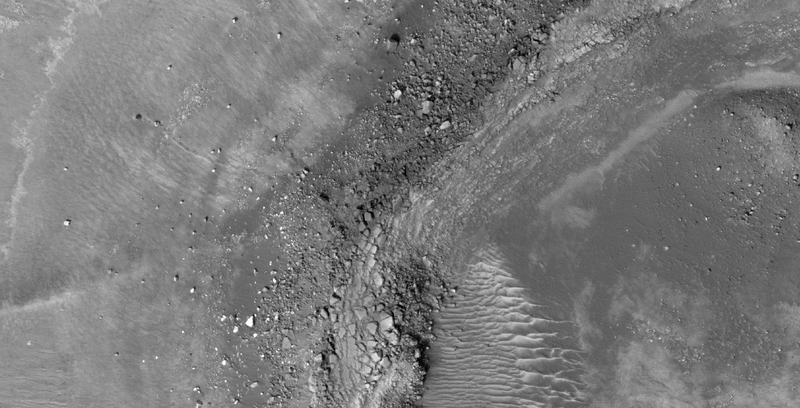 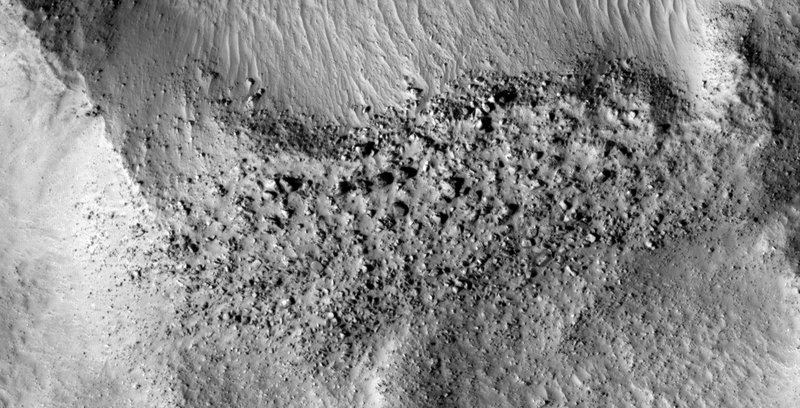 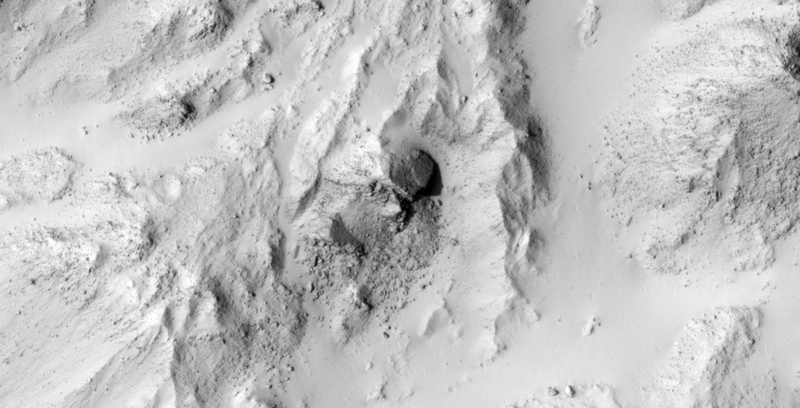 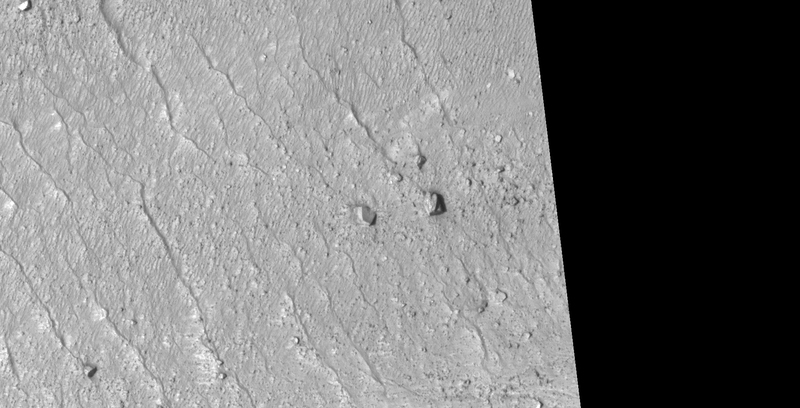 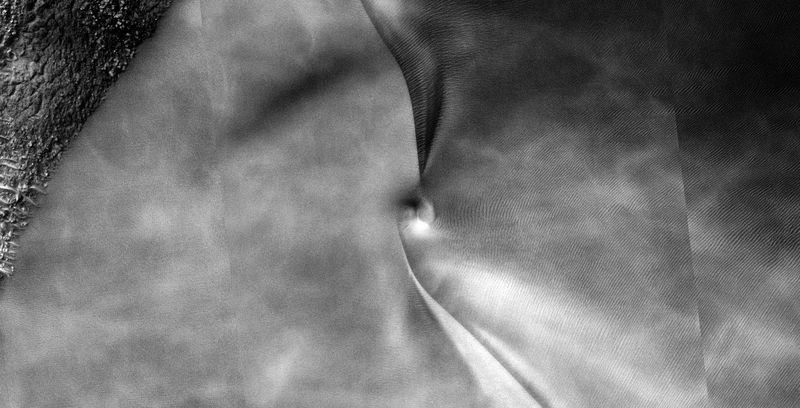 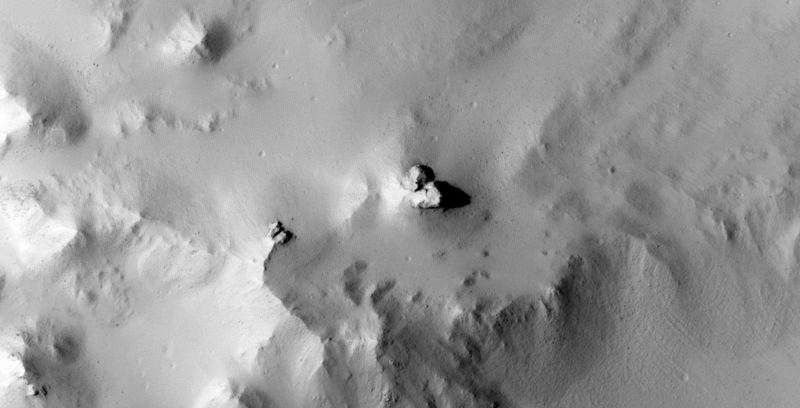 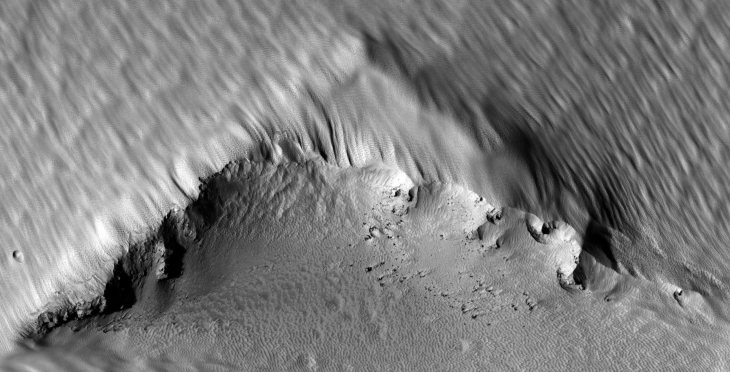 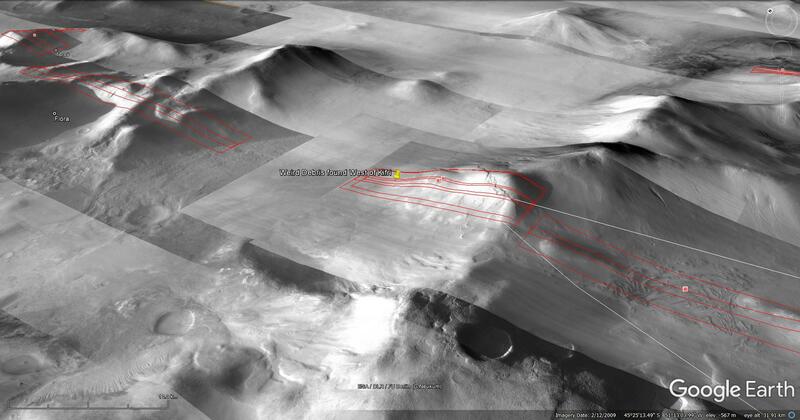 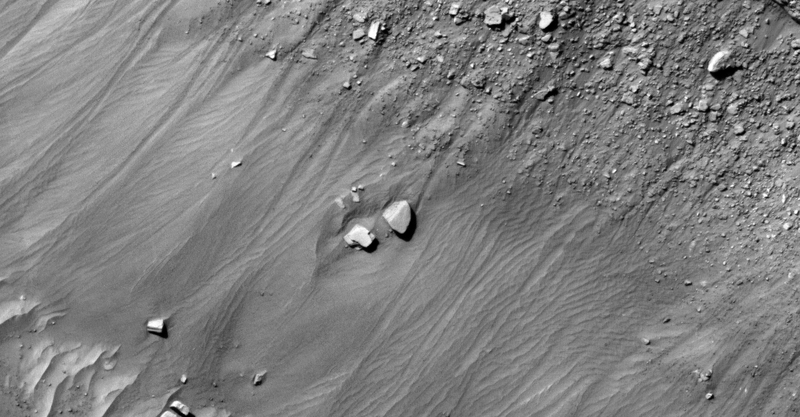 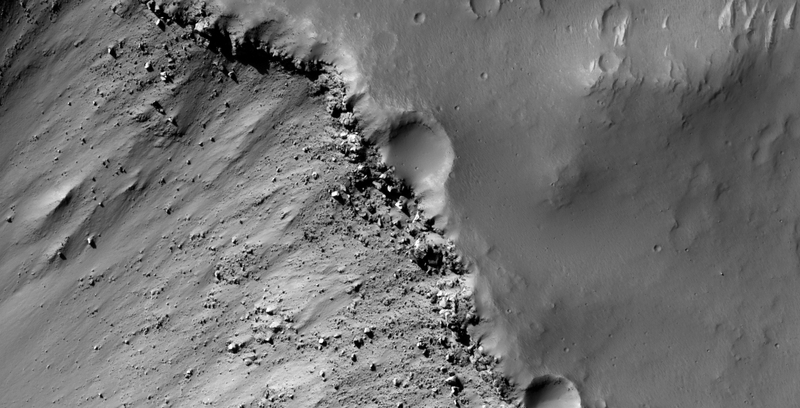 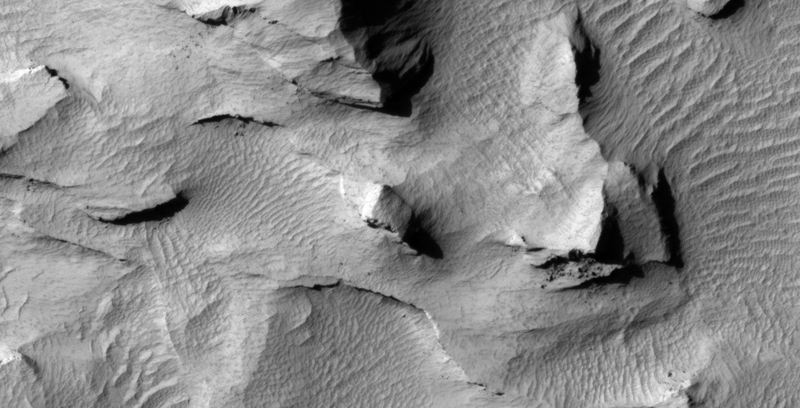 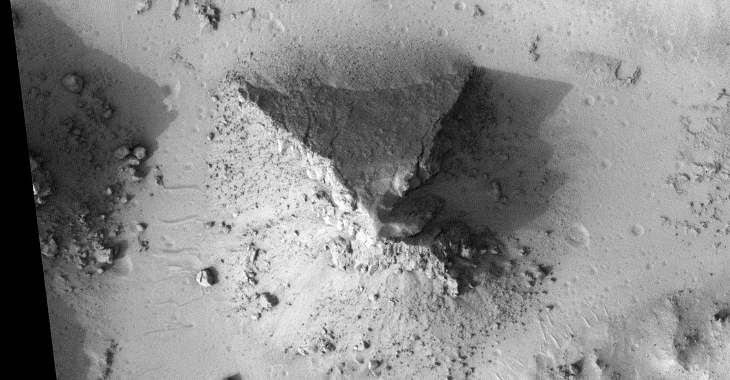 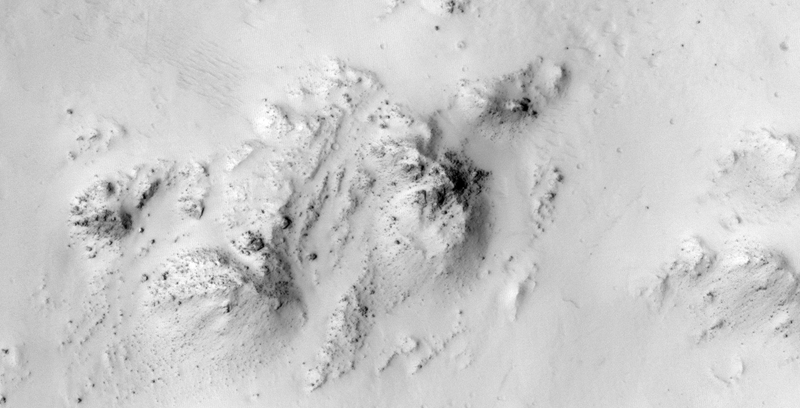 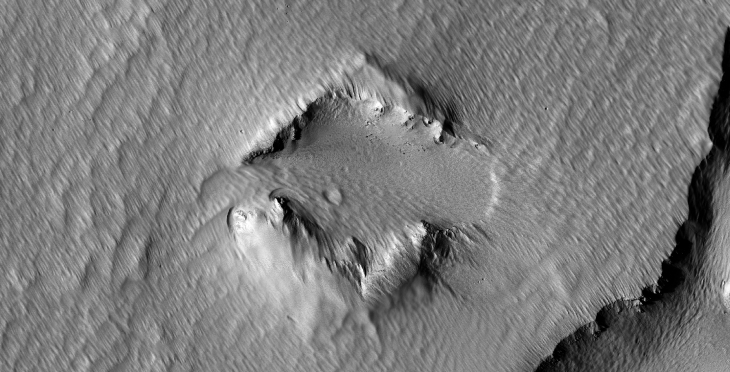 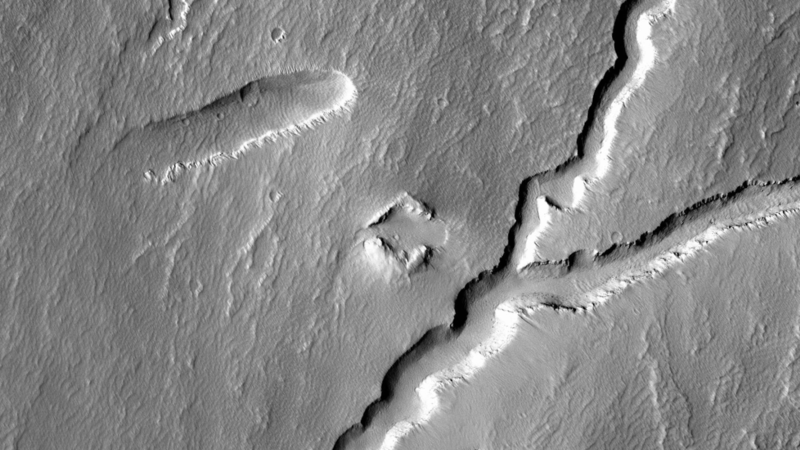 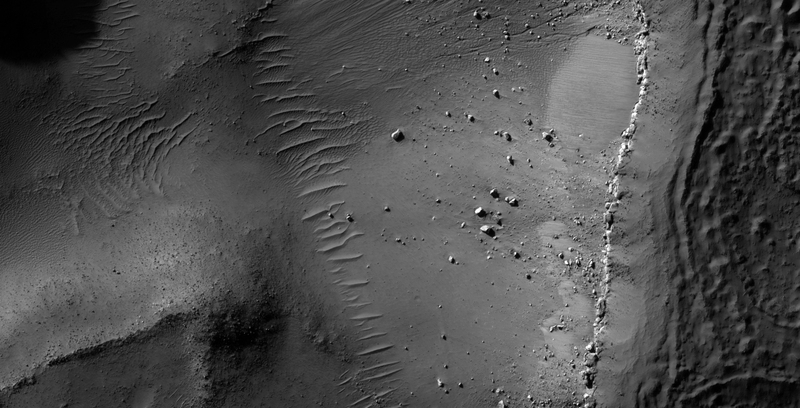 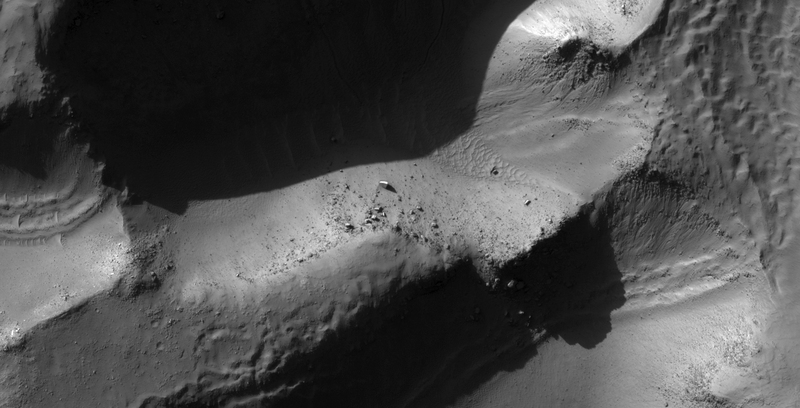 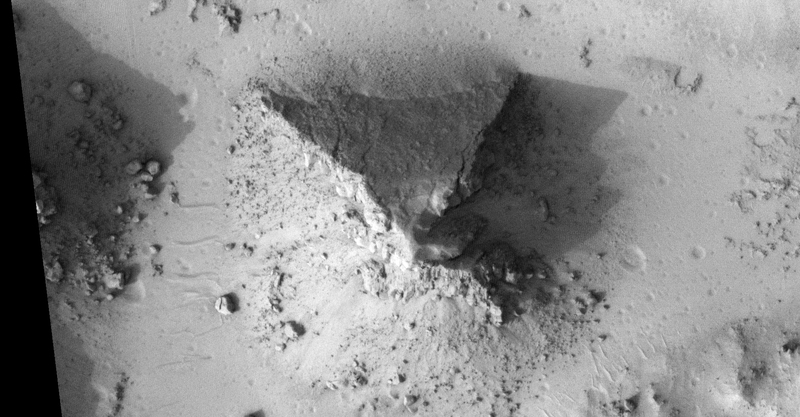 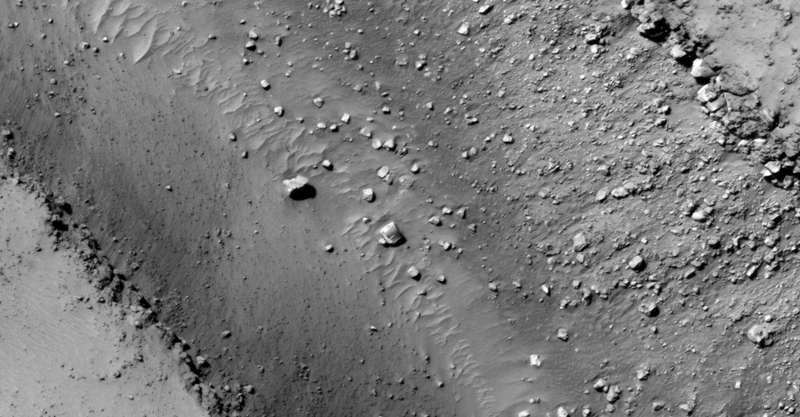 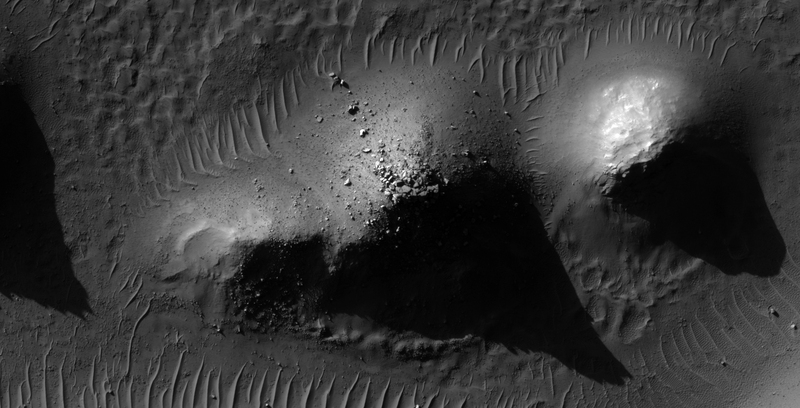 NASA describes the photographs as ‘Ride-along with HiRISE’ and ‘Possible Cinder Cone on the Southern Flank of Pavonis Mons’ respectively. 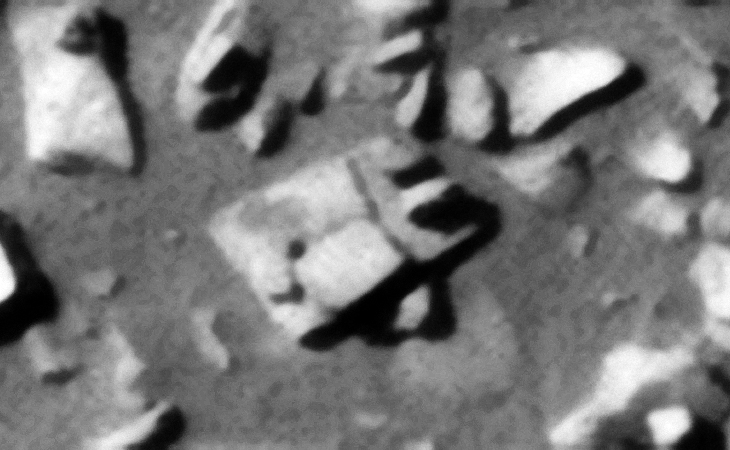 I discovered what looks like an ancient ruin on Mars consisting of two opposing chevron-type structures/walls. 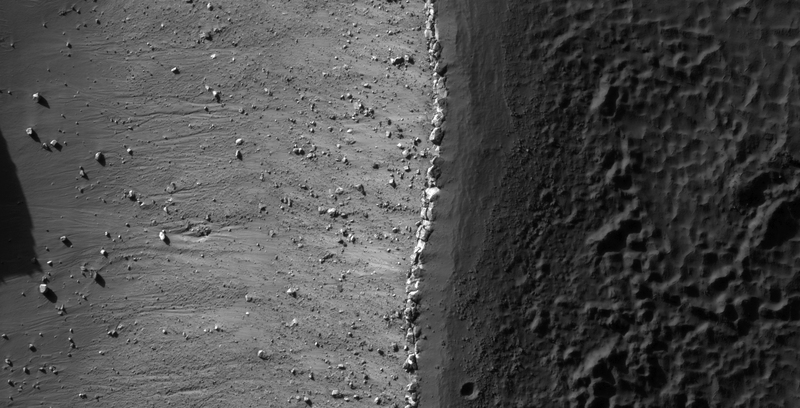 The side of each wall measures approximately 480 metres in length with a gap of 180 metres and 350 metres respectively between the two structures/walls. 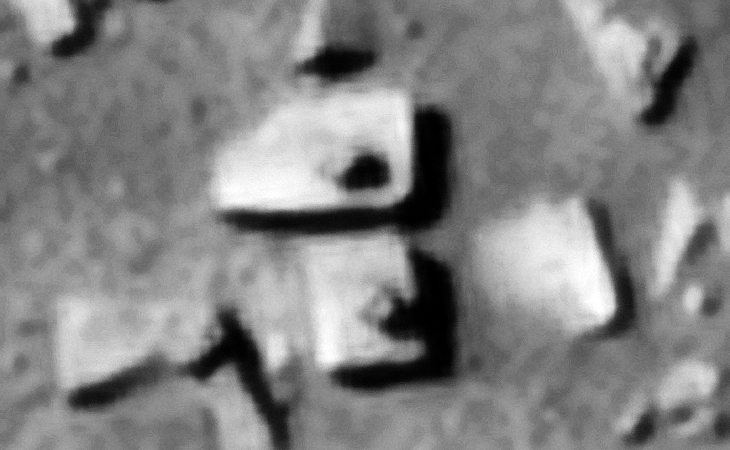 Could these two chevron shapes be the remnants of a square structure/walled-in area that collapsed in the distant past? 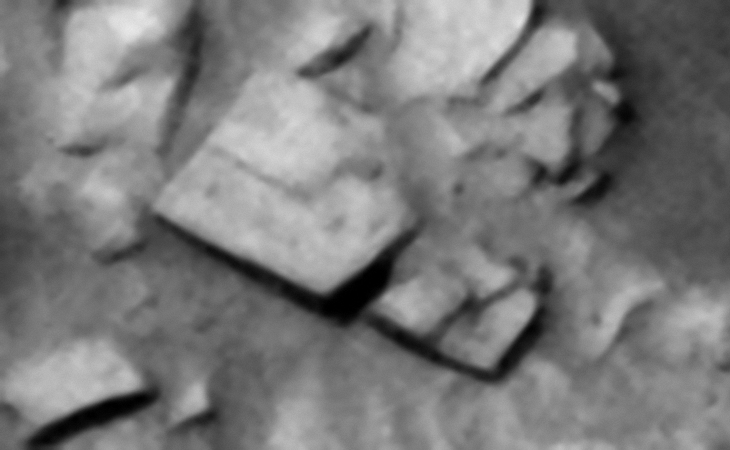 I discovered what appears to be further ancient megalithic ruins consisting of massive, broken megalithic blocks. 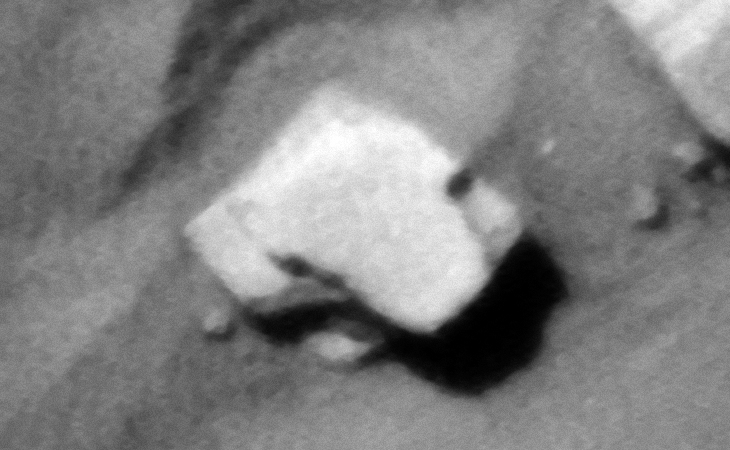 Some structures are still relatively intact and show a few blocks that have become dislodged. 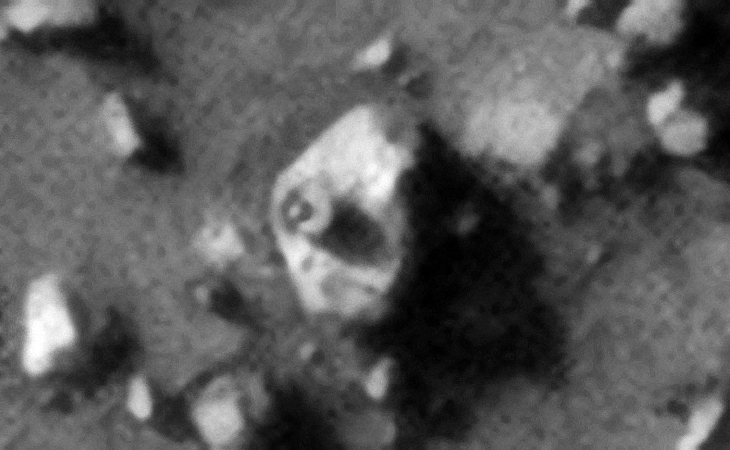 Again, there are multiple anomalies that look like wrecked craft, damaged machinery or tech, underground entrance-ways and pieces of sculptures, even what look like a giant hatch. 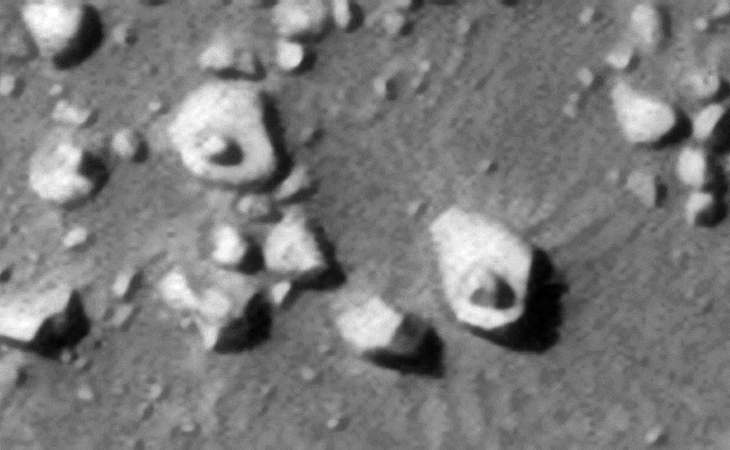 Are these ancient ruins built by a civilization that lived on Mars in the distant past or were these structures formed through a natural geological processes? 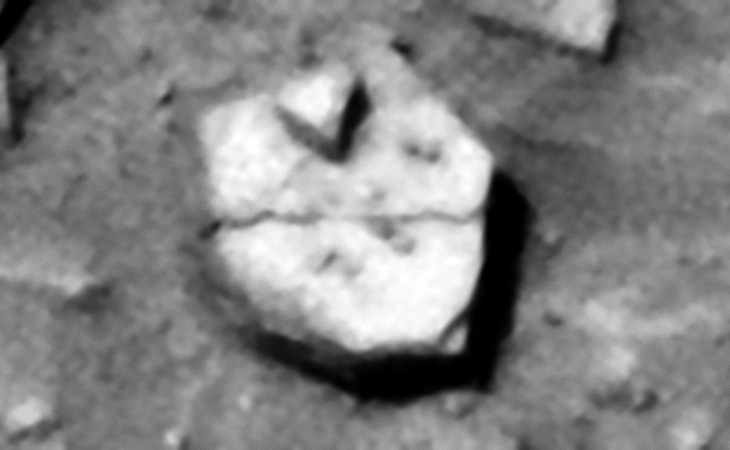 Due to the fact that I have discovered multiple sites on Mars with similar matching megalithic blocks and similar objects I speculate these ancient ruins are artificial in nature. 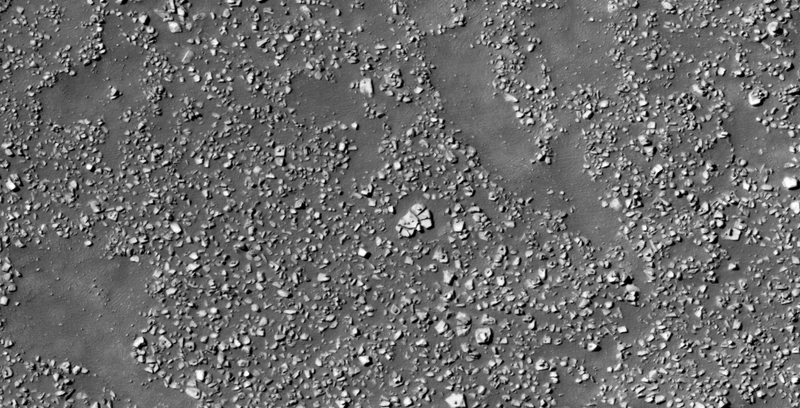 Furthermore it looks like the area consisted of artificially made islands inside a canal-type system. 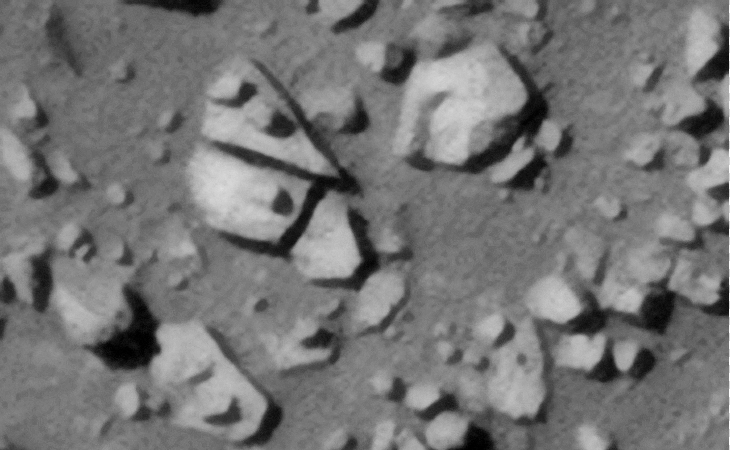 There are also other weird anomalies including what looks like an eroded pyramid with only one side still relatively intact. 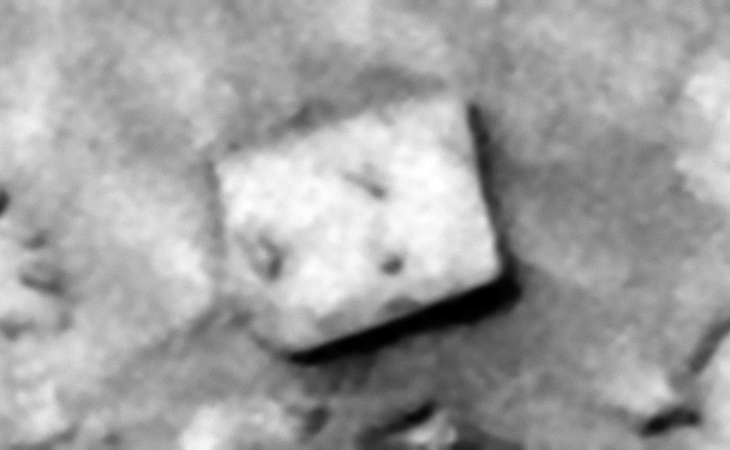 There is also a square block consisting of nine small square blocks. 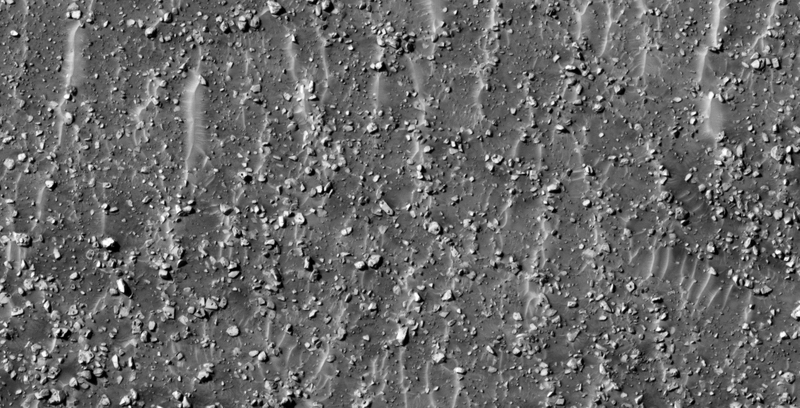 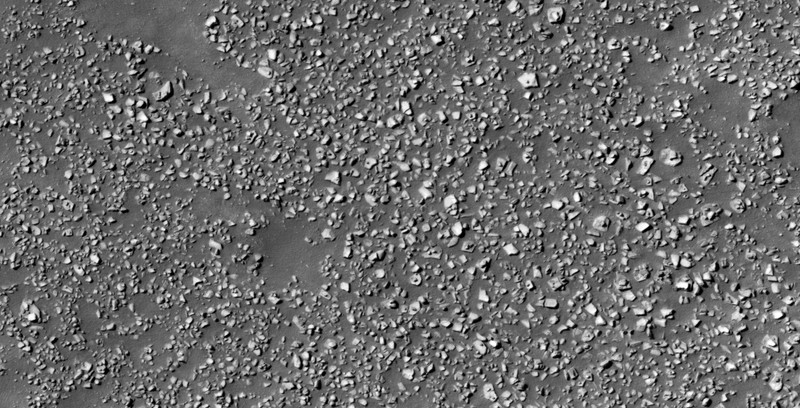 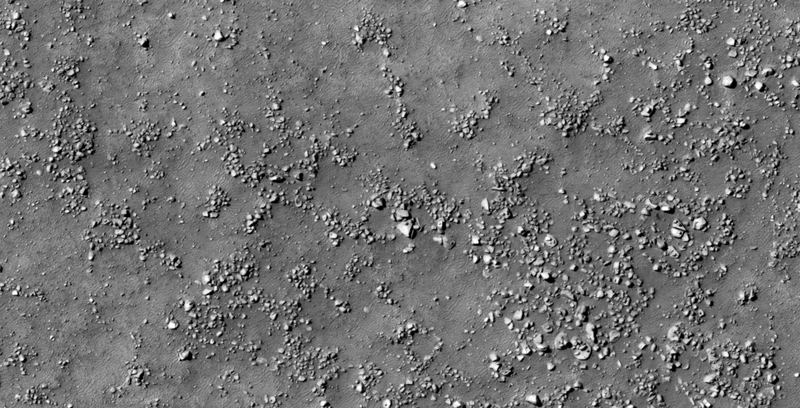 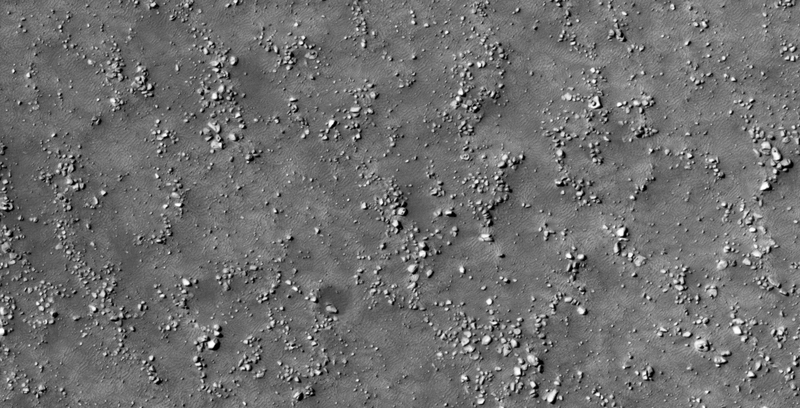 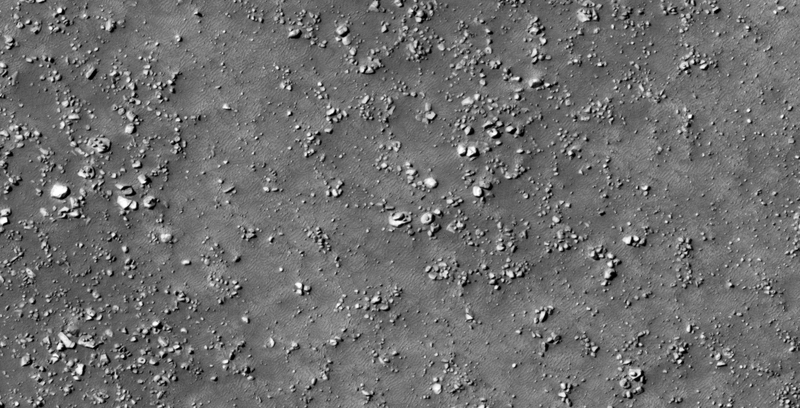 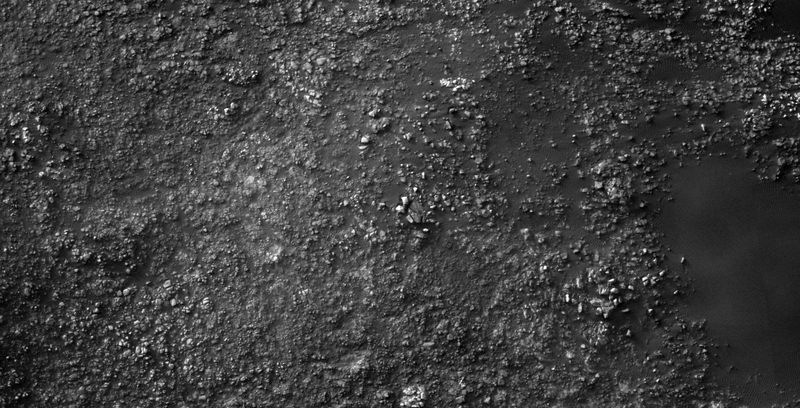 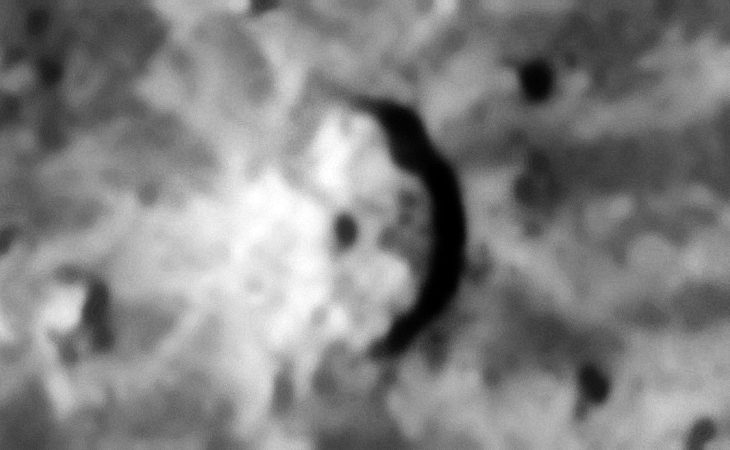 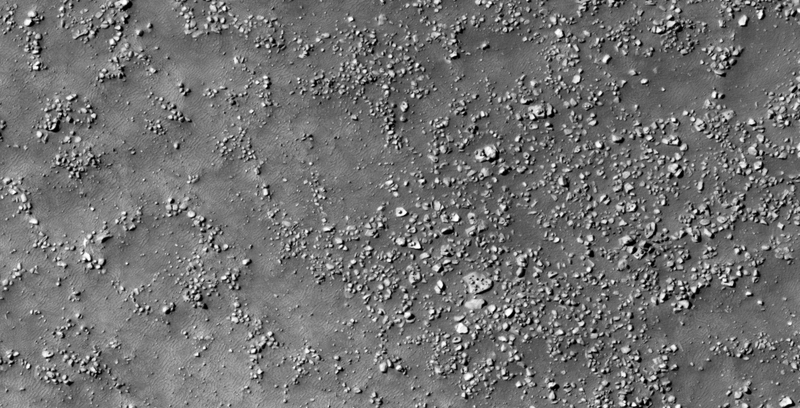 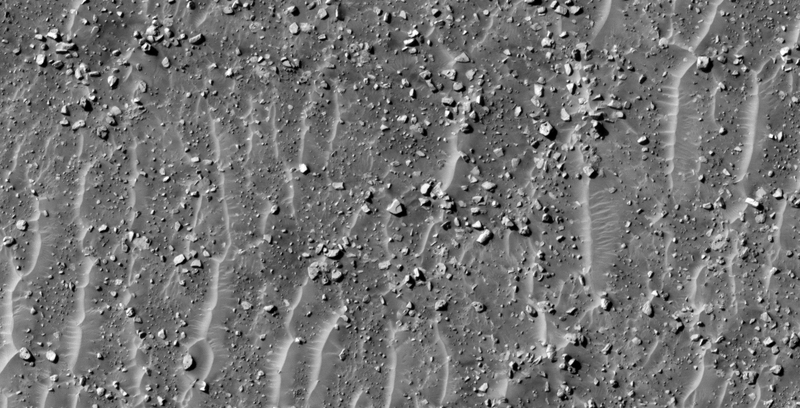 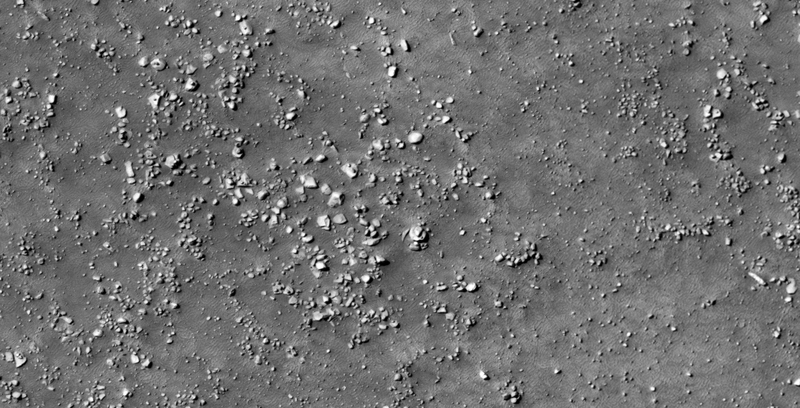 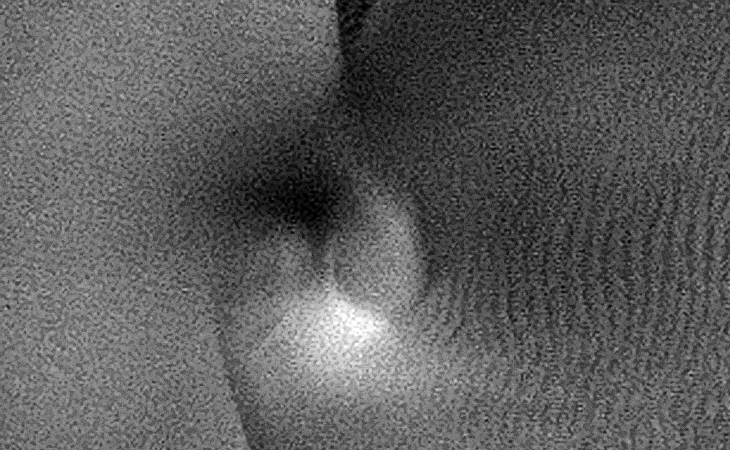 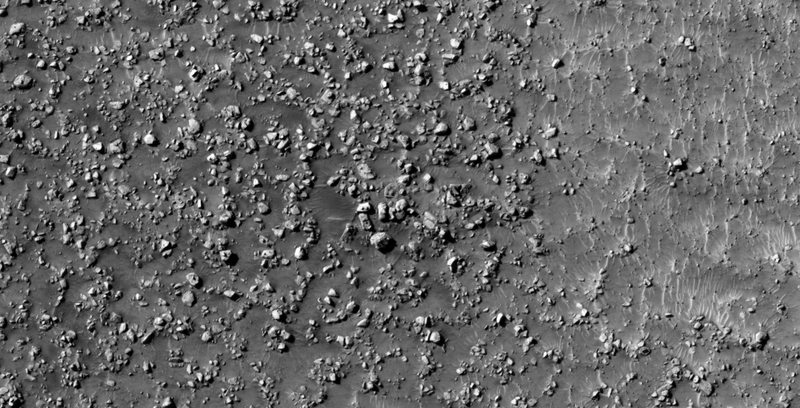 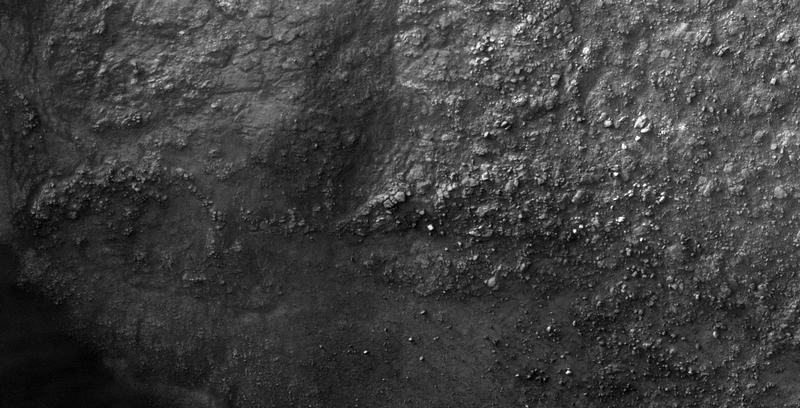 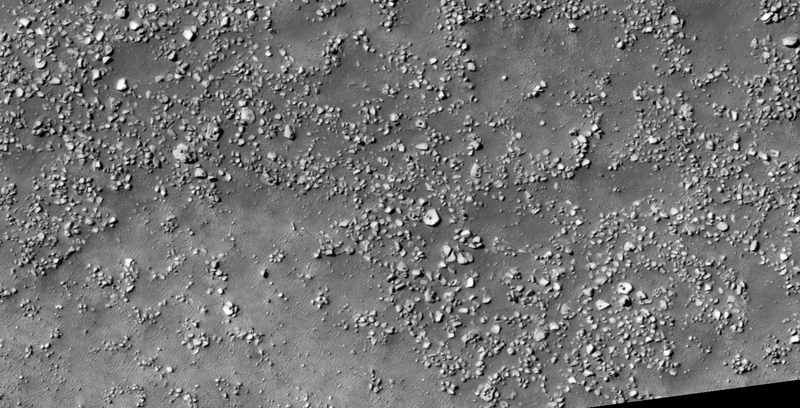 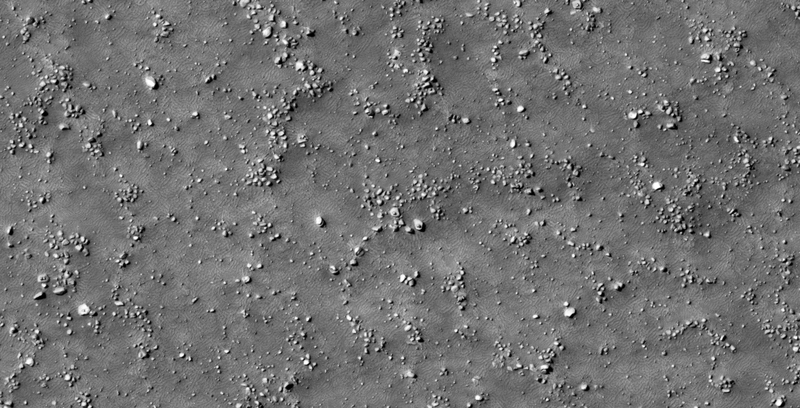 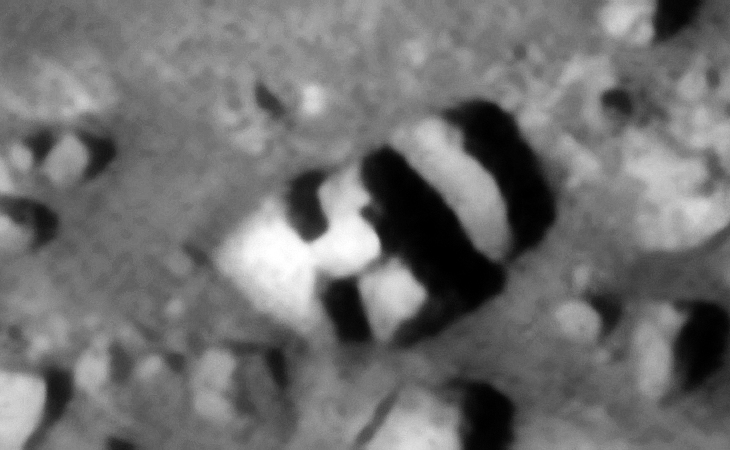 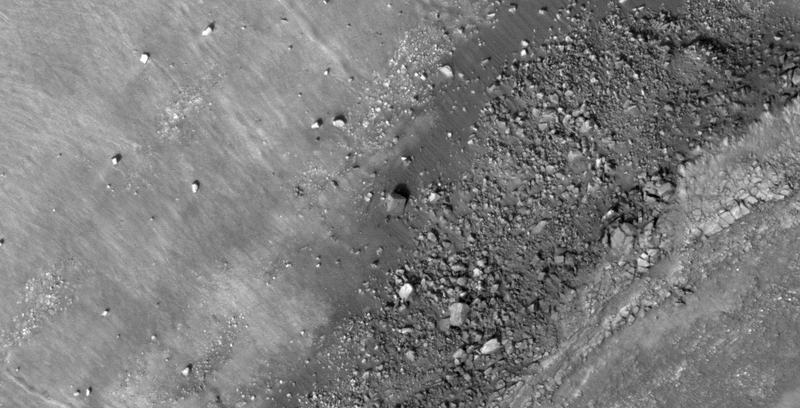 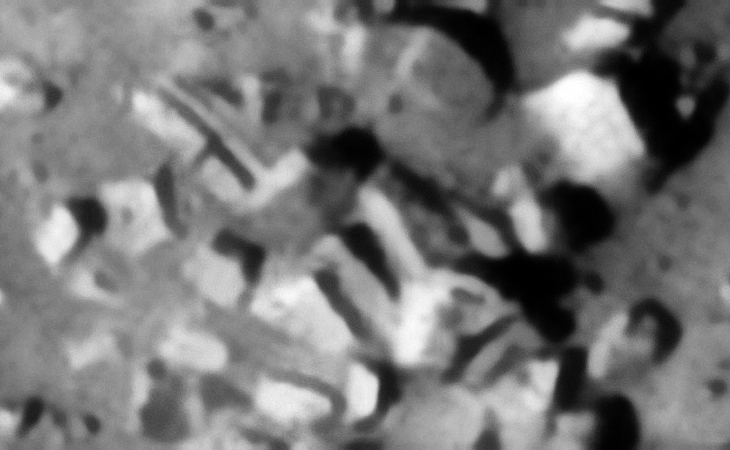 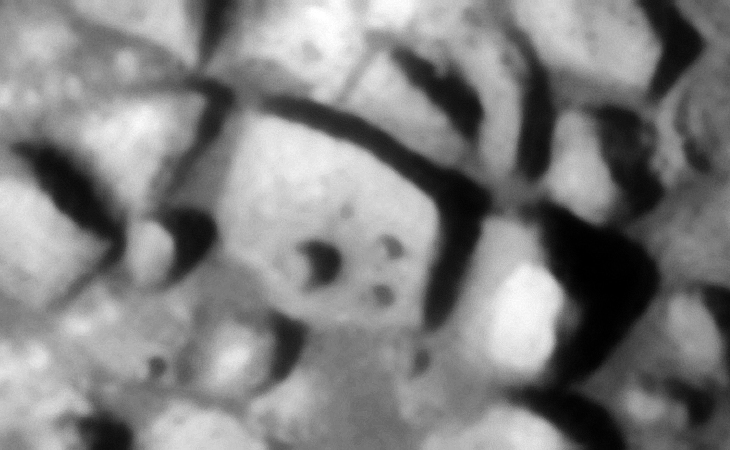 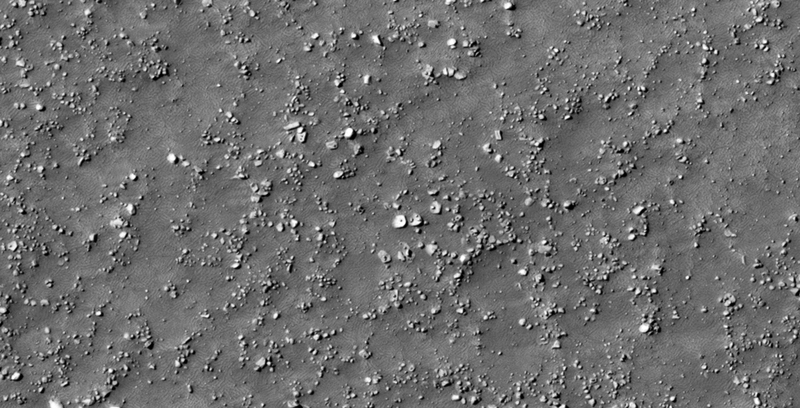 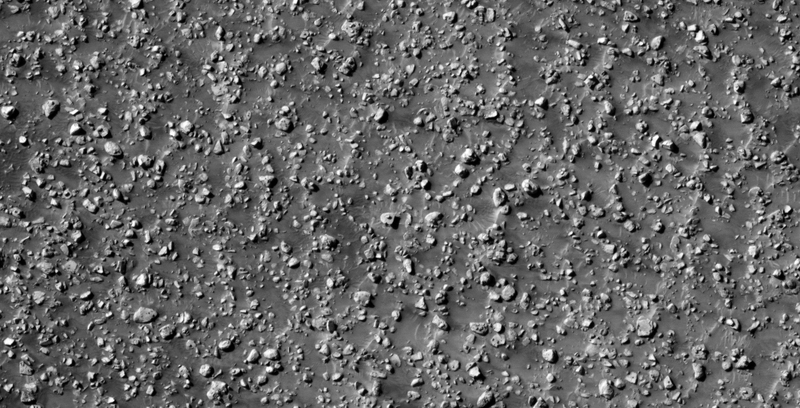 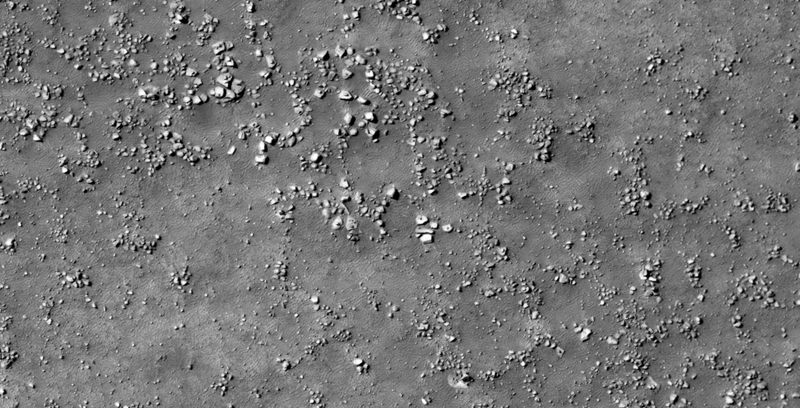 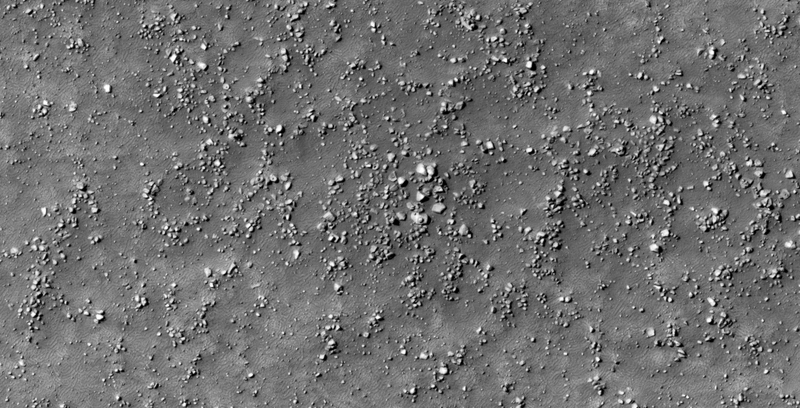 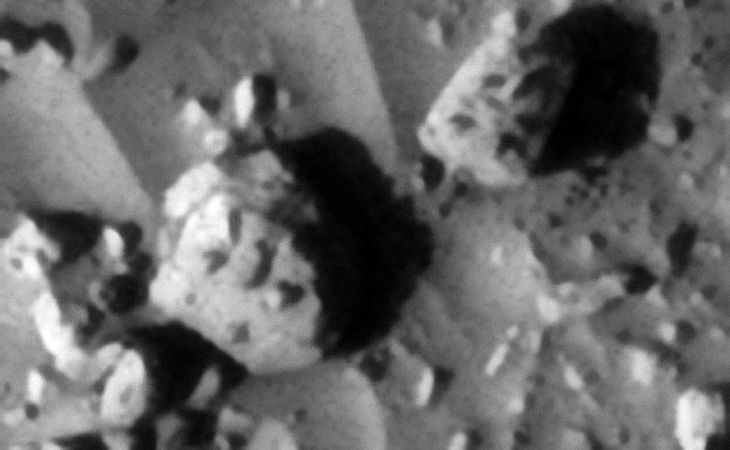 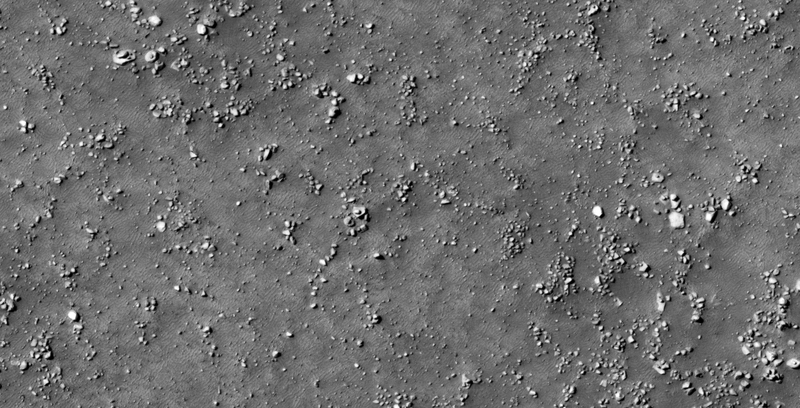 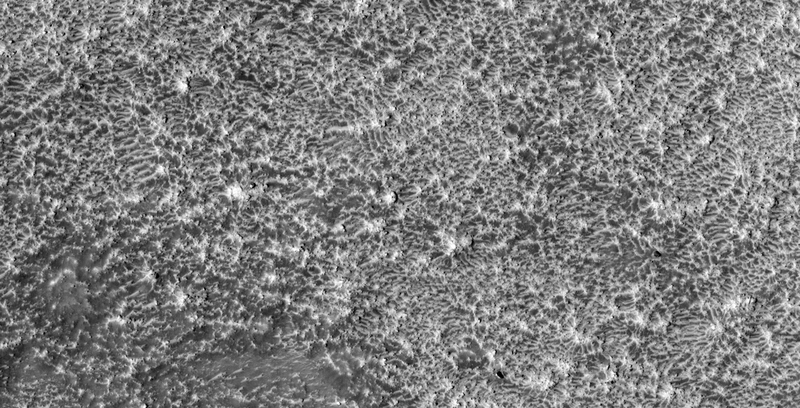 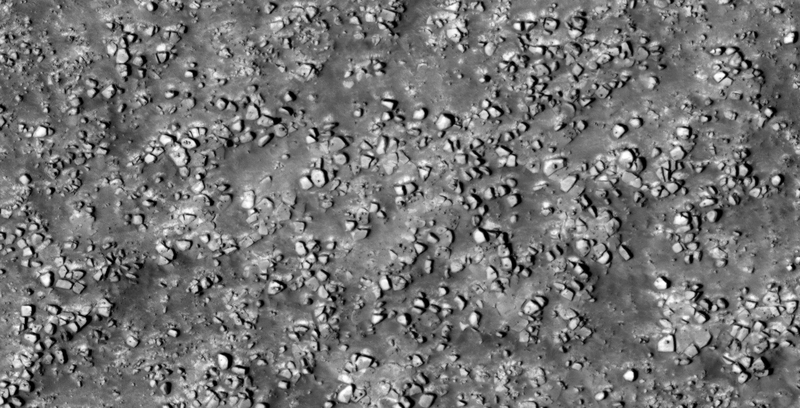 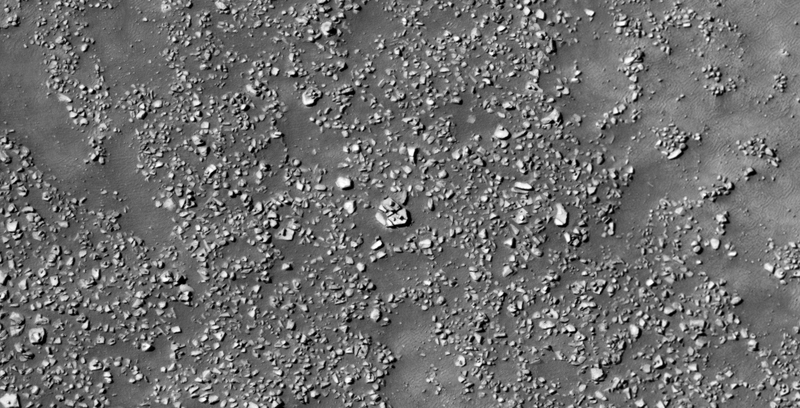 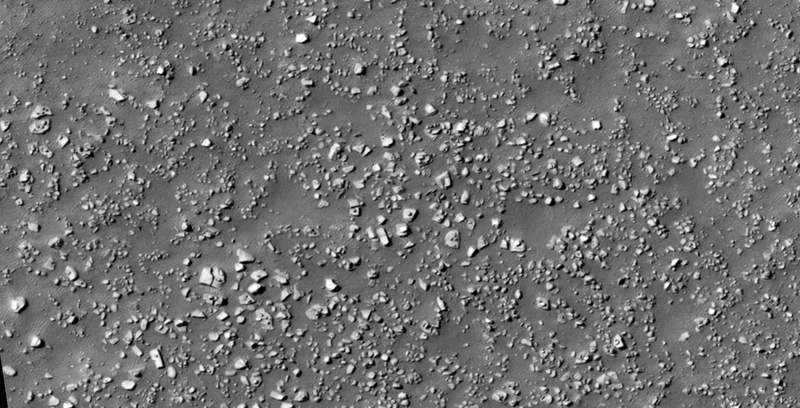 PS: I decided not to include close-up zooms of the anomalies because the HiRISE photograph is too ‘noisy,’ salt and pepper and thin interference lines. 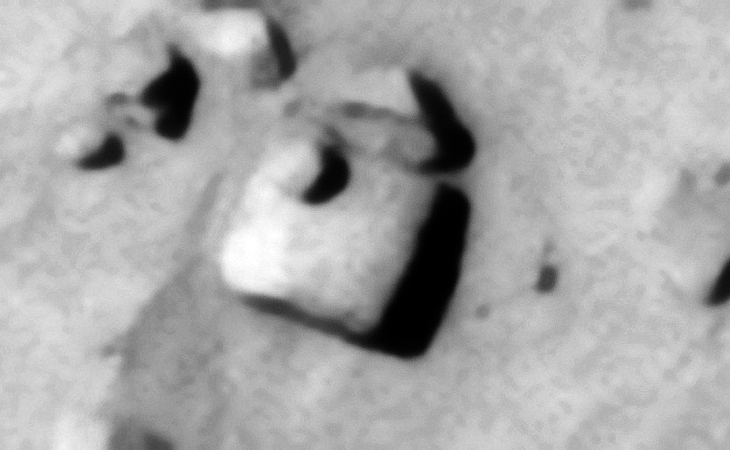 I discovered what appears to be further evidence of ancient broken megalithic blocks with knobs or smaller features on top and what may be wreckage. 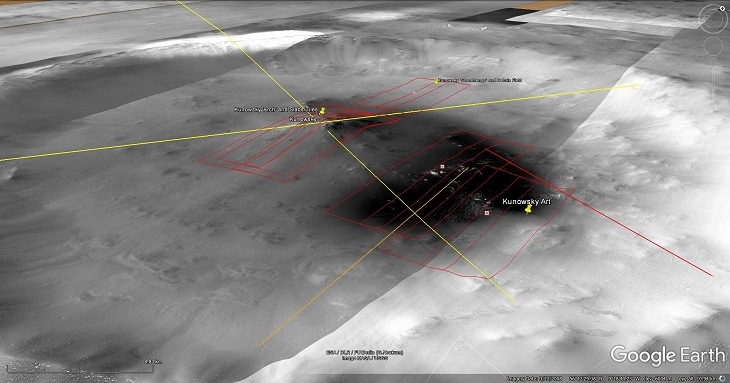 There may even be a few underground entrance-ways shown, only speculating. 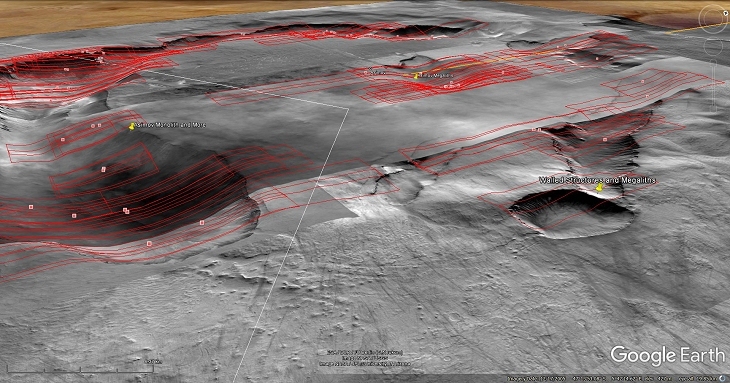 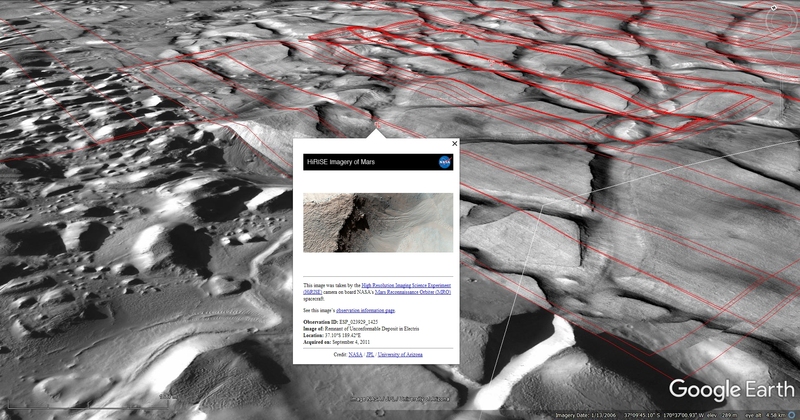 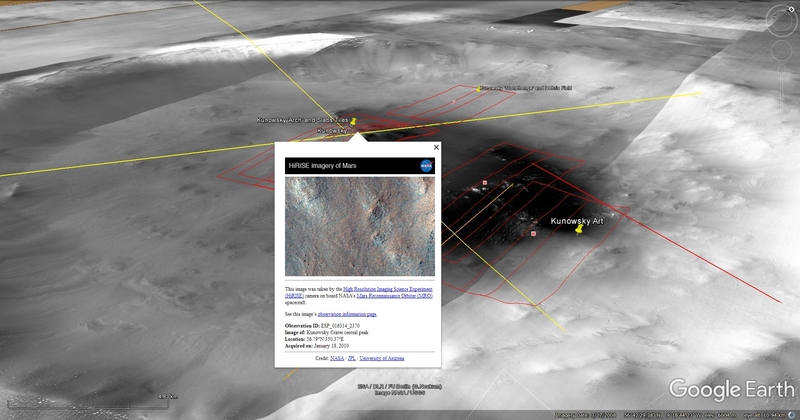 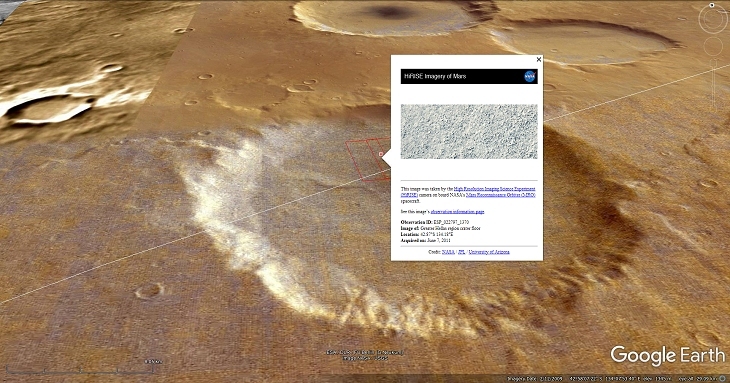 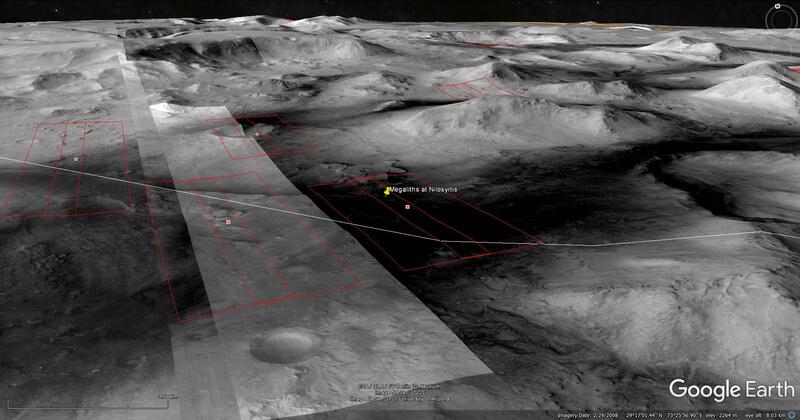 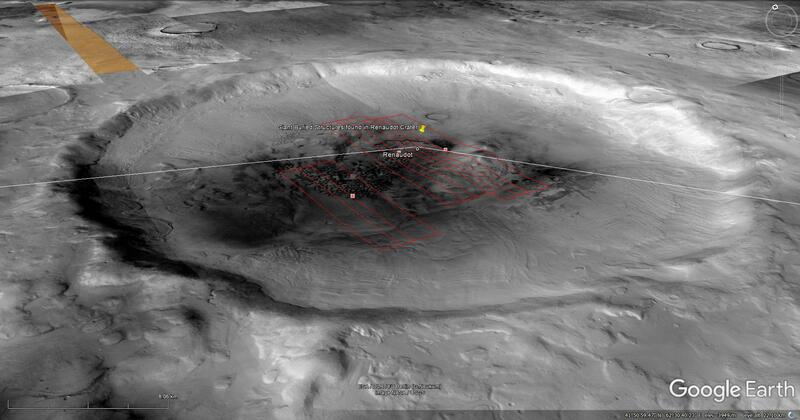 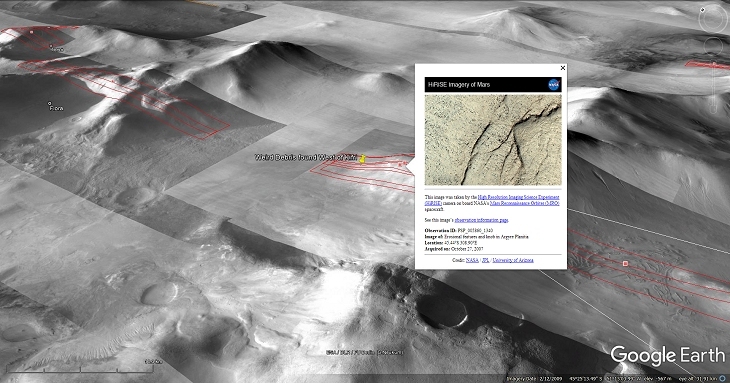 Discovered here is what I speculate to be further evidence of ancient ruins and technology on Mars. 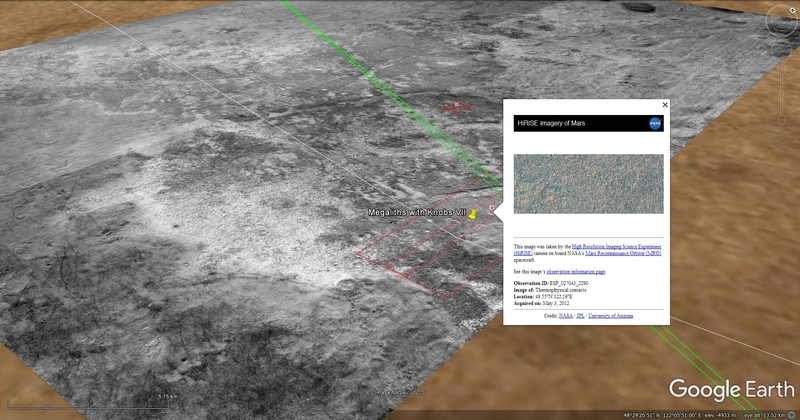 I also found what looks like a wrecked Quimbaya ‘Jet’-type object approximately 20 metres long. 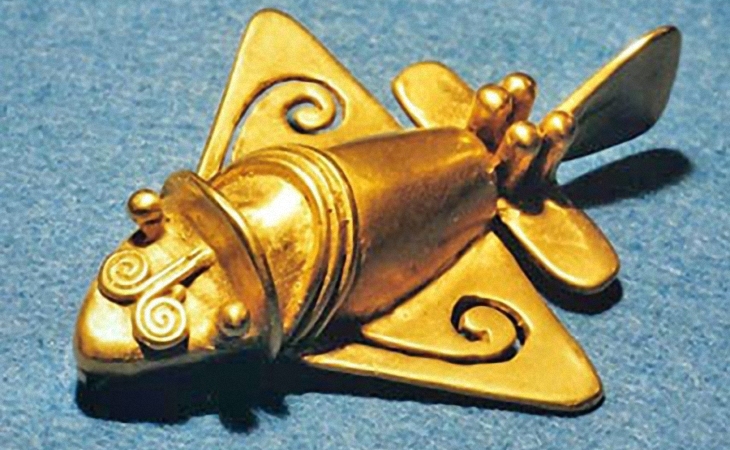 I wonder what Giorgio from Ancient Aliens will think of this artefact? 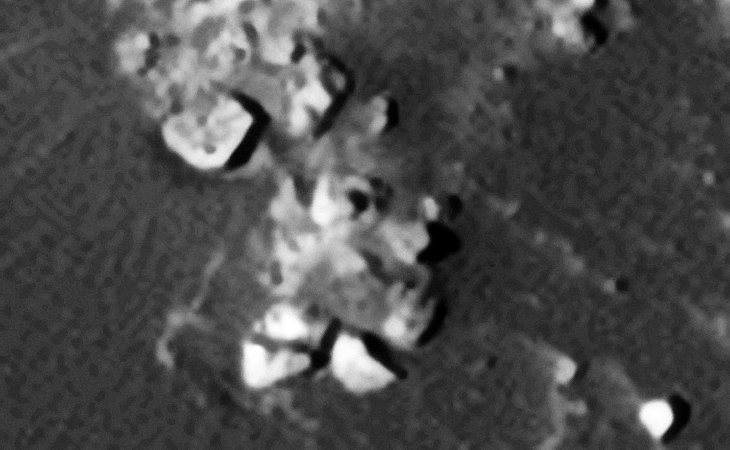 I speculate I may have found more heavily eroded megalithic blocks, a type of stepped structure and another rectangular opening/mine/entrance-way cut into the side of a hill. 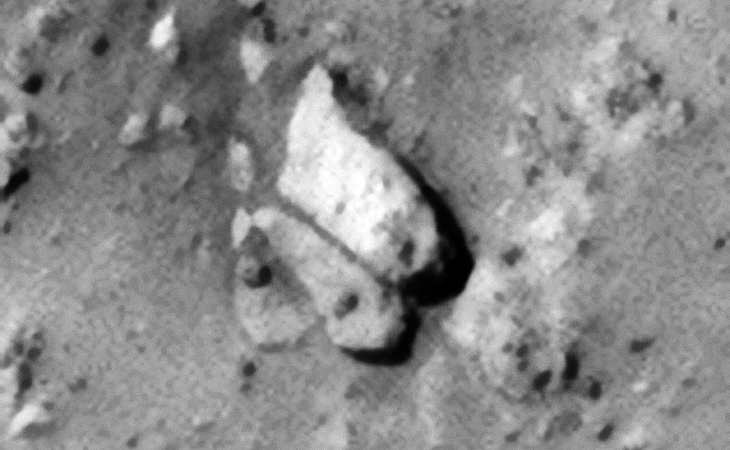 Might this evidence point to some type of megalithic block mining/extraction activity?